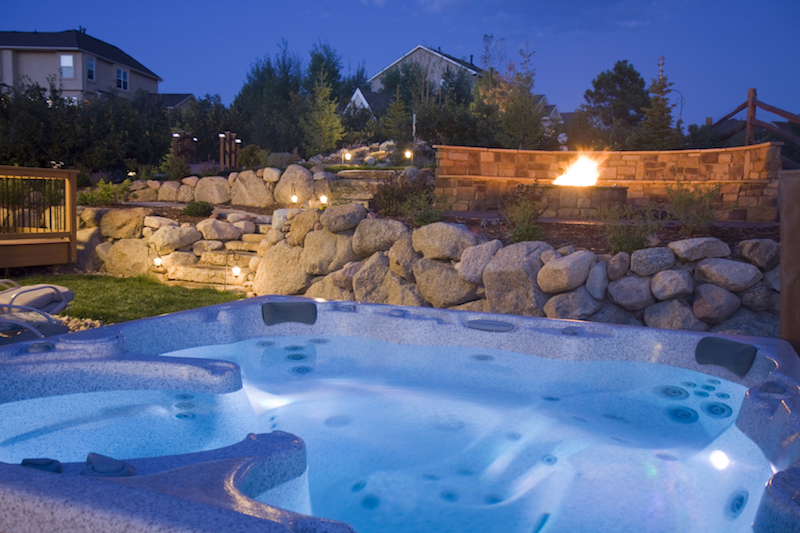 You can hardly go wrong adding a hot tub to your backyard. What you really want to do is make the space around the hot tub beautiful and relaxing. Get a pile of backyard hot tube ideas here. 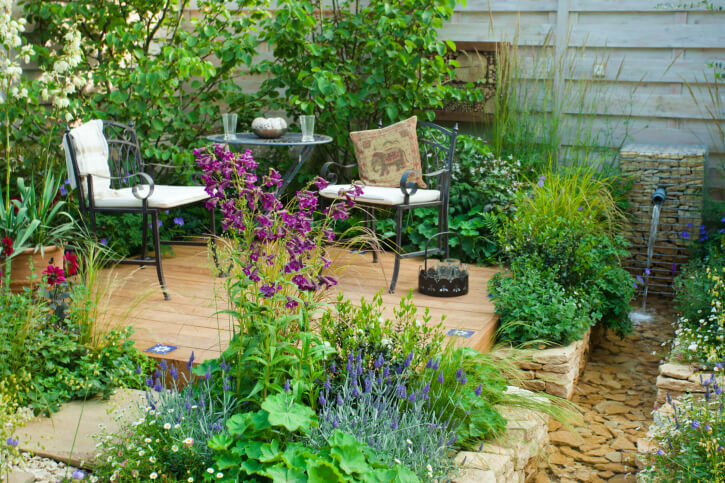 One of the most popular backyard ideas is to create a garden or series of gardens. The good news is that there are types of gardens you can plan and grow. Discover all the different types of gardens here. 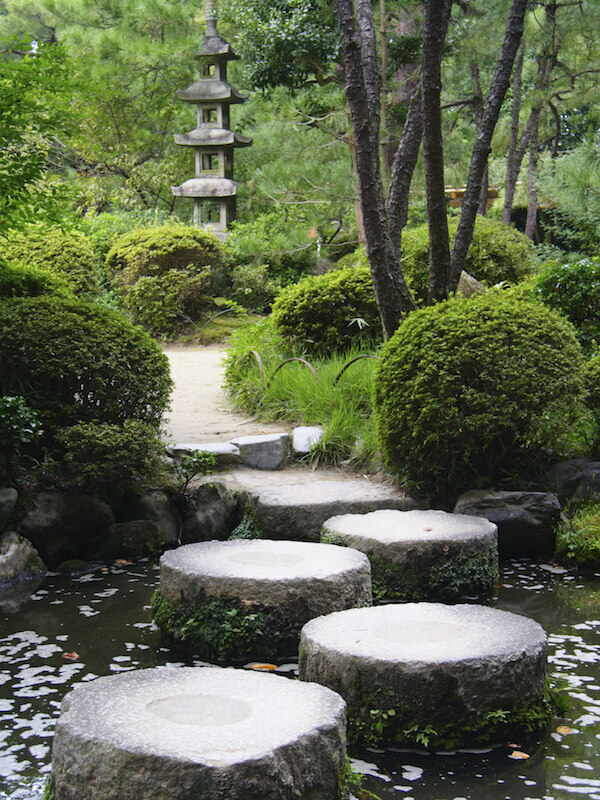 It’s not as hard as you think to create a Zen garden. You just need some sand and some space. I’d pepper it with large boulders and gardens around the perimeter, but there’s definitely a stark beauty to these types of gardens. 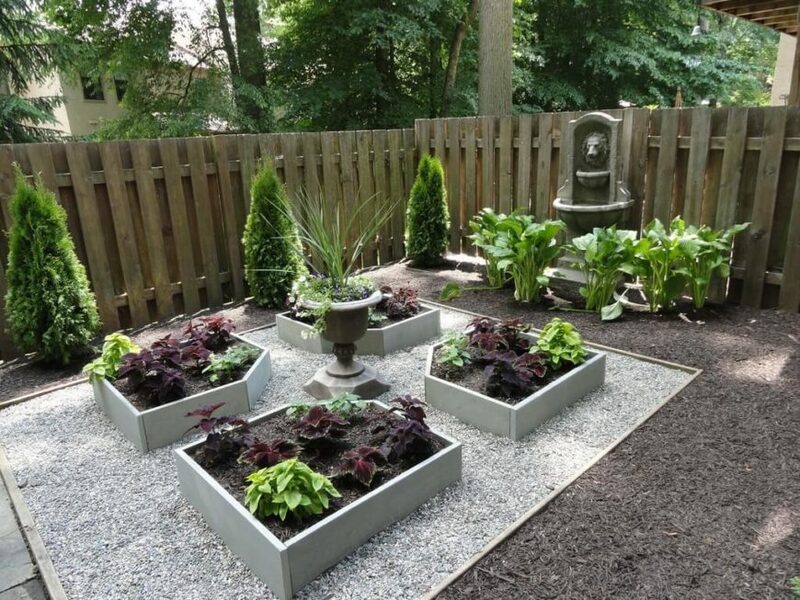 See our extensive collection of Zen garden ideas here. Fire pits are all the rage these days. There are many types, designs, sizes, shapes and fuel options to choose from. 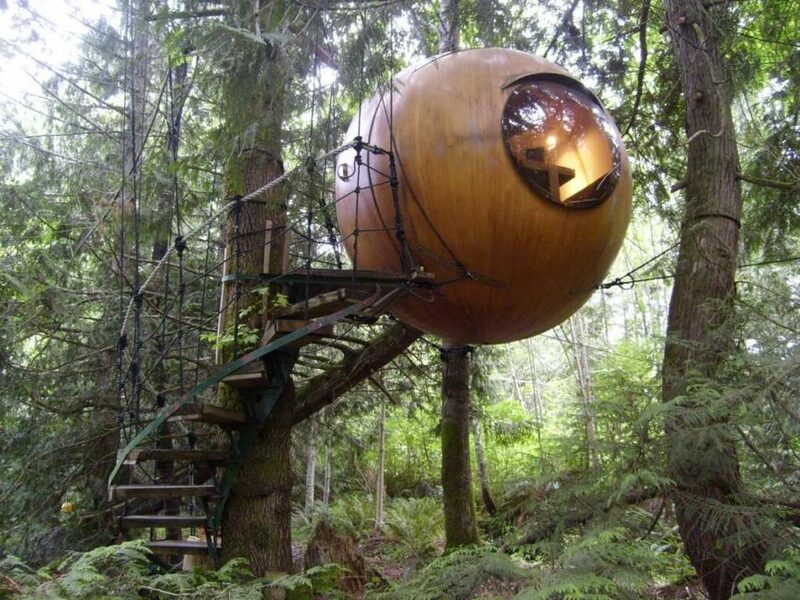 You can built one yourself or buy a cool propane style. The sky is the limit. 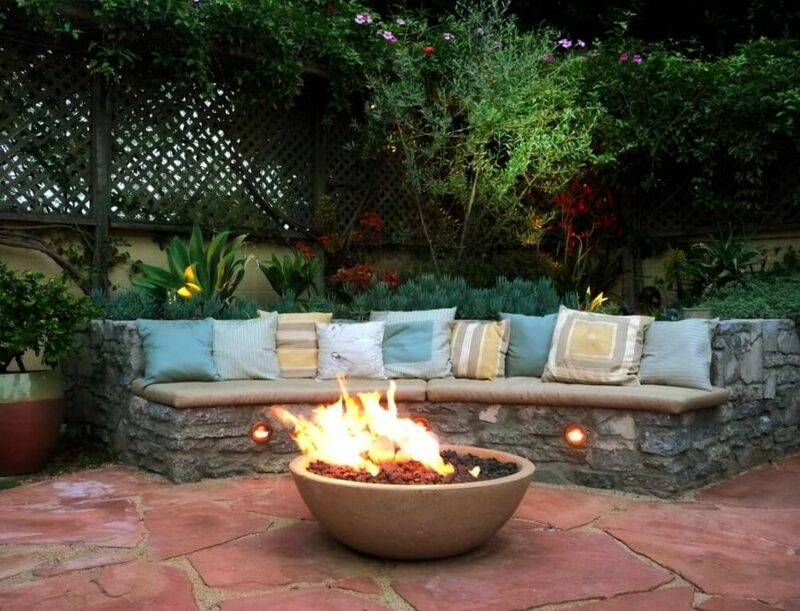 Get all kinds of fire pit ideas here. A smaller deck with stairs leading down to the lower section of the yard. 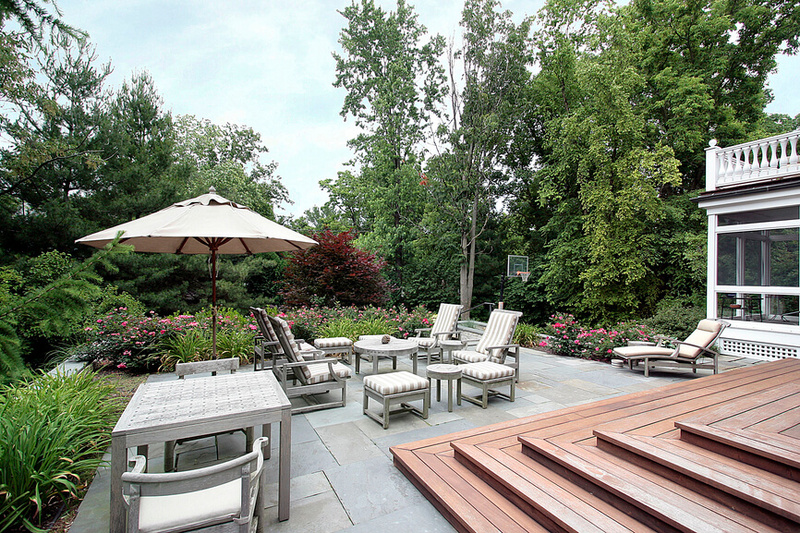 A small seating area is positioned perfectly to enjoy the view of the expansive yard that ends in a thin forest. 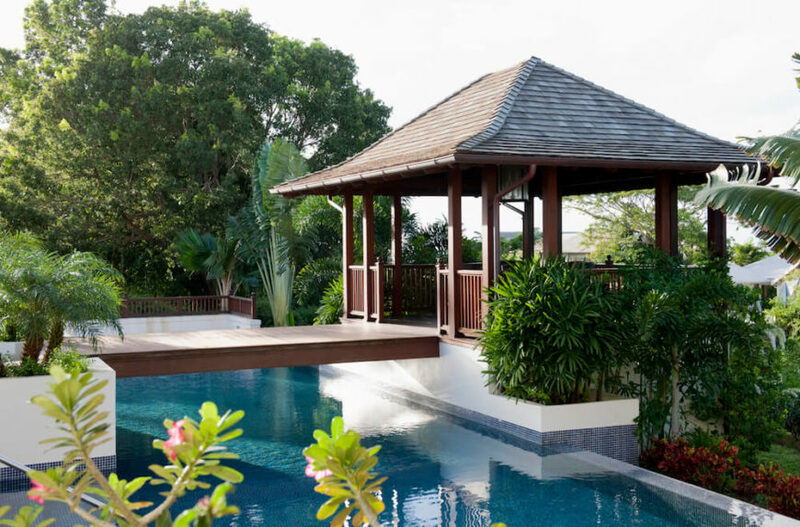 A raised deck overlooking a swimming pool. 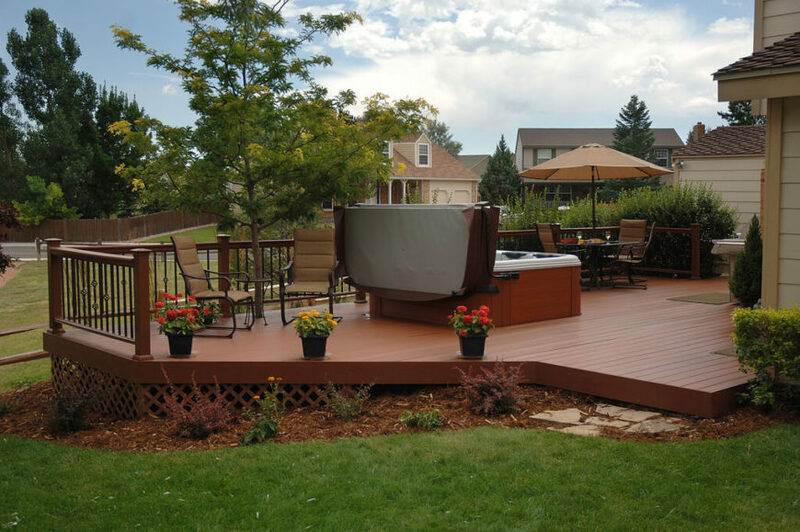 This deck is surrounded on all sides by a railing and has several different tiers. 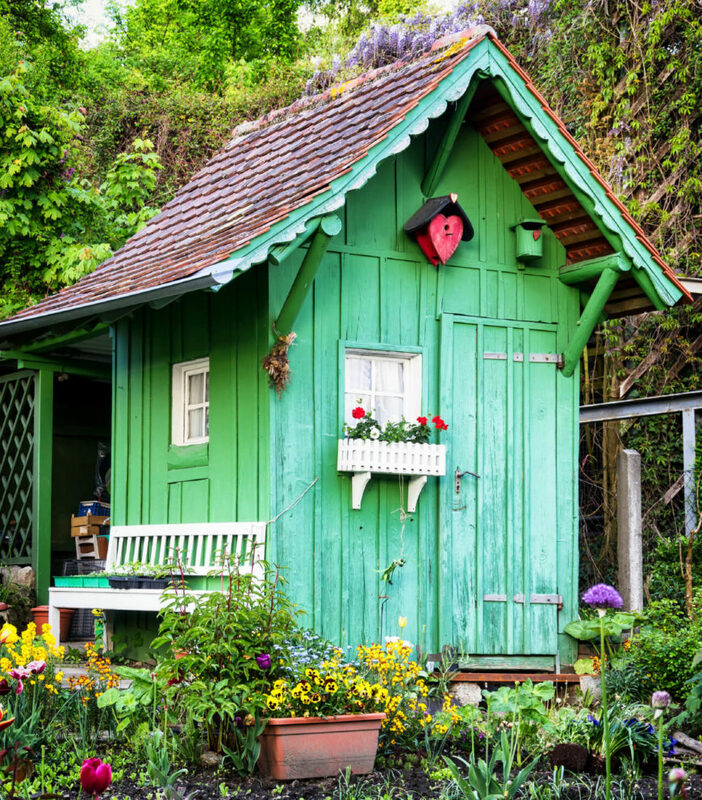 If you’re into gardening, a shed might be the perfect small structure to include on your property. 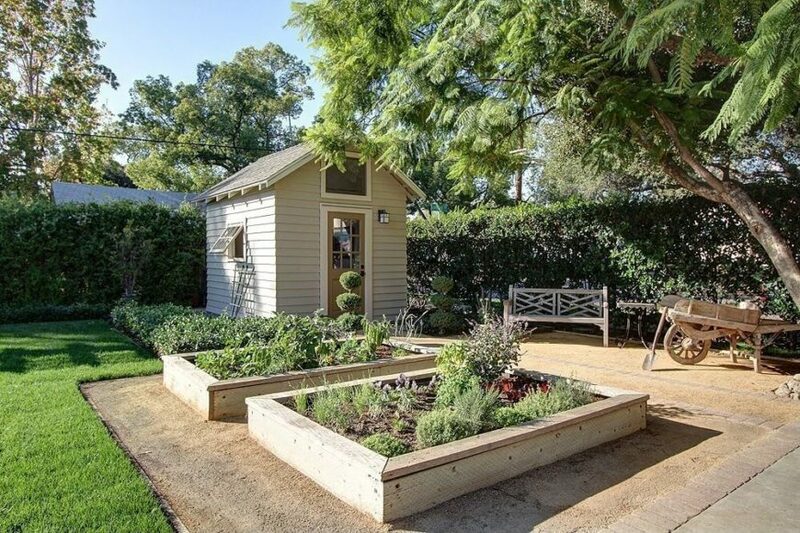 It’ll keep all your gardening supplies out of the garage and close to the very place you need the most: the garden! 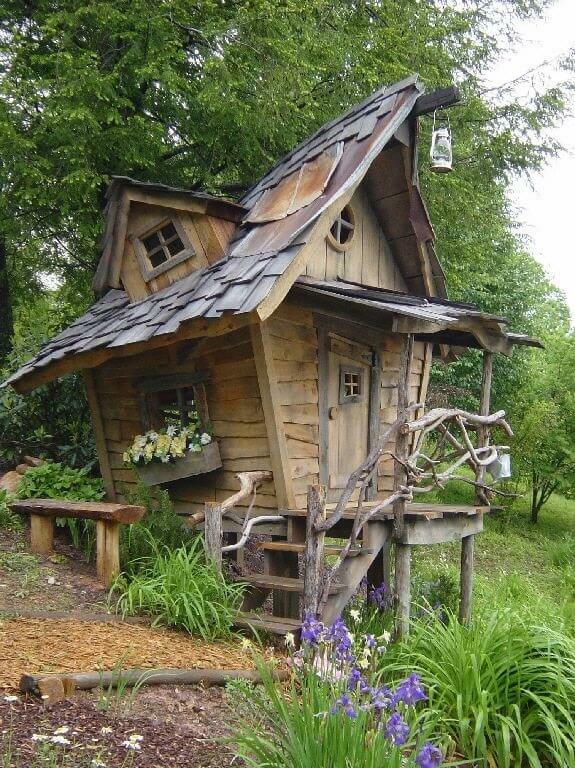 Check out more lovely shed designs and ideas. Gardening resource: 10 handy gardening trowels (vote your favorite). 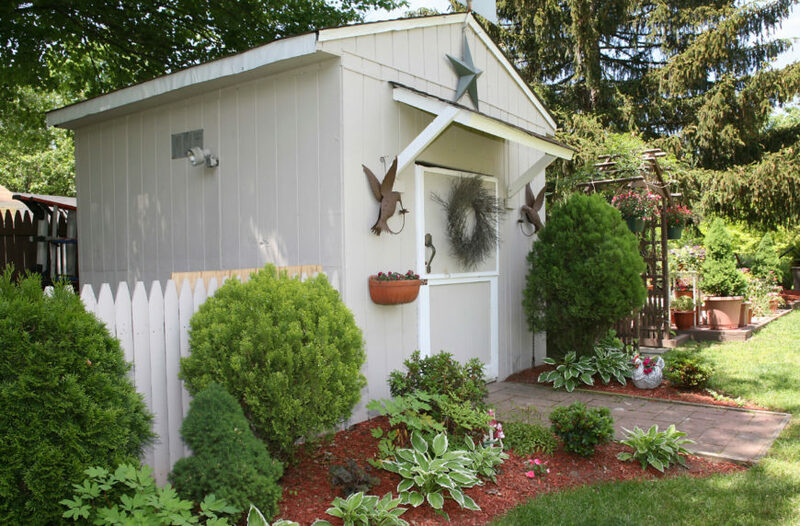 This garden shed is actually fenced off by a decorative fence in addition to a privacy fence that surrounds the yard. Nearby is an arbor and plenty of potted trees. 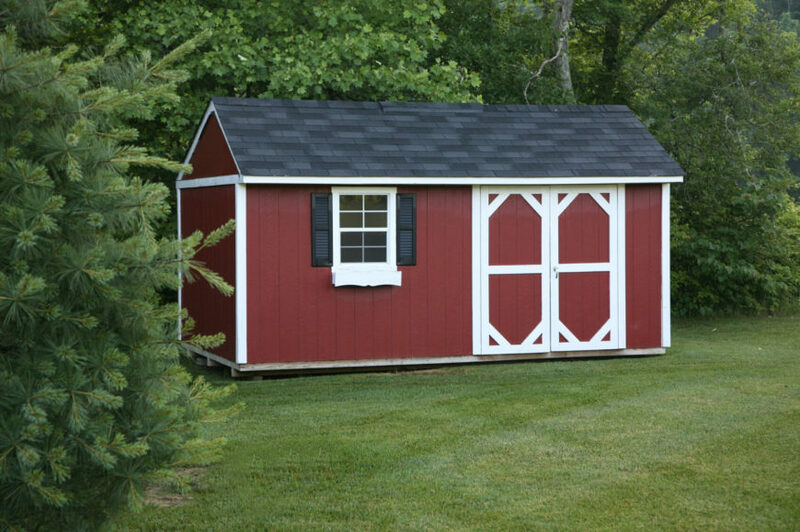 This pretty red shed is built to resemble an old country barn, and has cute shutters and a dark slate roof. 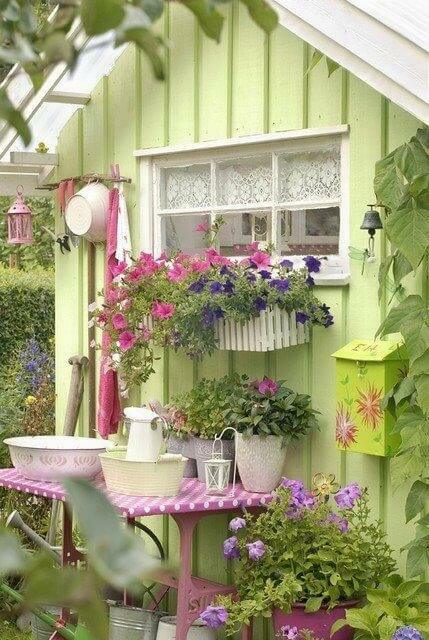 Painted a bright green, this ramshackle garden shed stands out against the surrounding planting beds. A small picket window box and a matching bench stand out against the bright green. 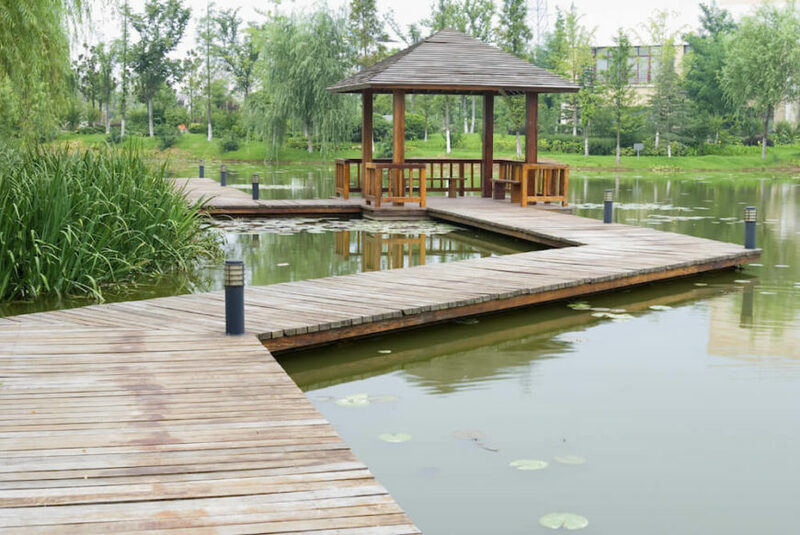 There are many reasons to add a small garden footbridge to your yard, but the best reason is probably to bridge the gap over a small creek running through your property. 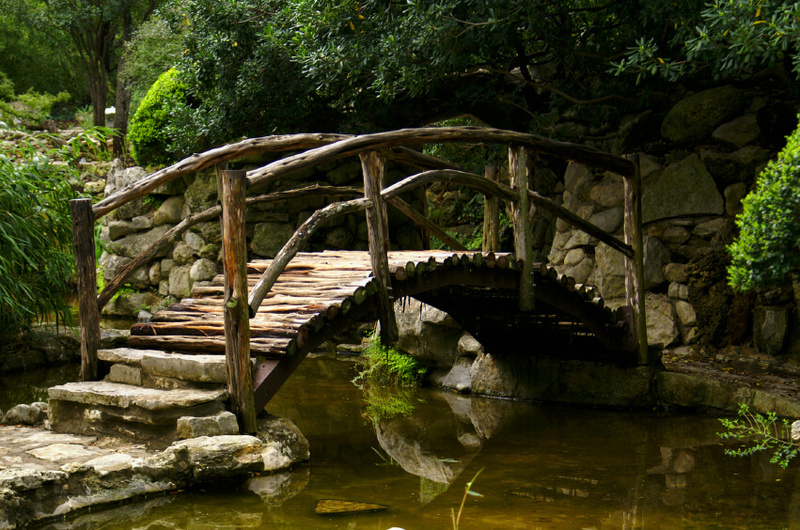 Of course, bridges are used in zen gardens as well, some of which do not have any water whatsoever. 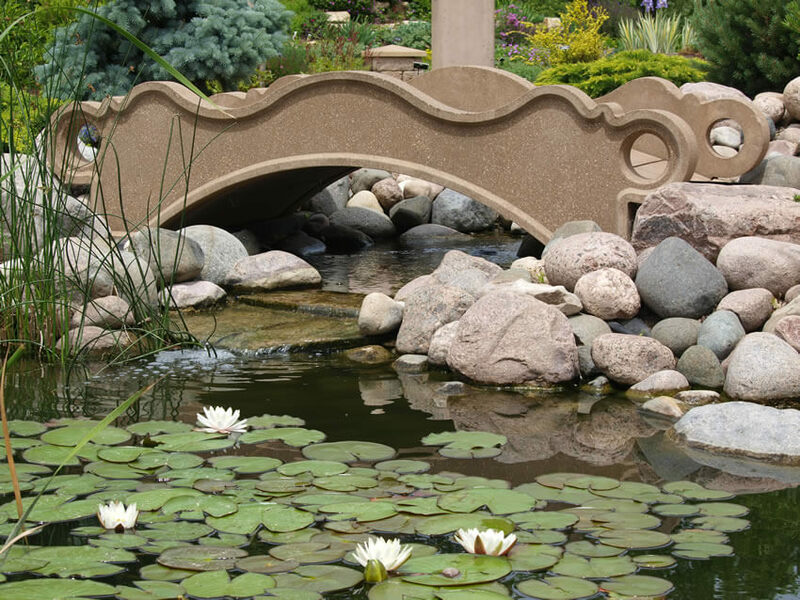 Check out all the great ways that garden bridges are used in garden designs! An ornate concrete bridge across a wide but shallow and slow-moving creek. 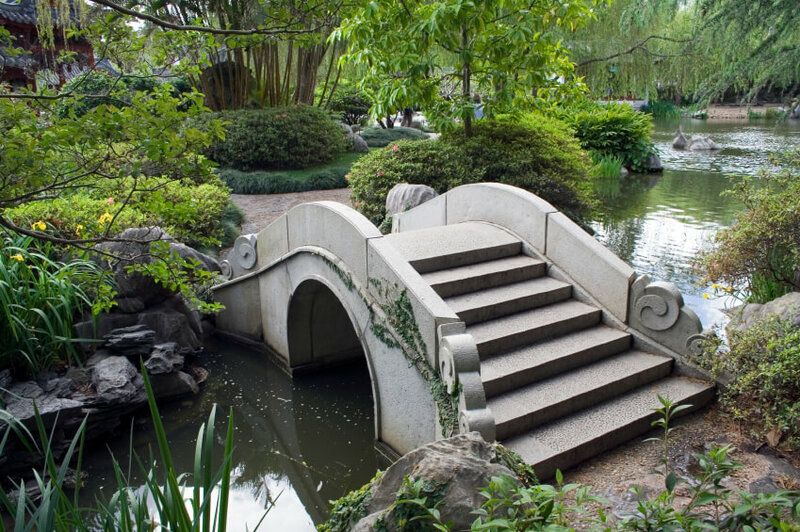 This bridge connects two sections of an expansive, lush garden. A much more rustic bridge with a high arch above a crystal clear, shallow creek. An ornate stone footbridge over a small creek leading into a pond. Stones piled up on either bank keep the bridge stead and in place. 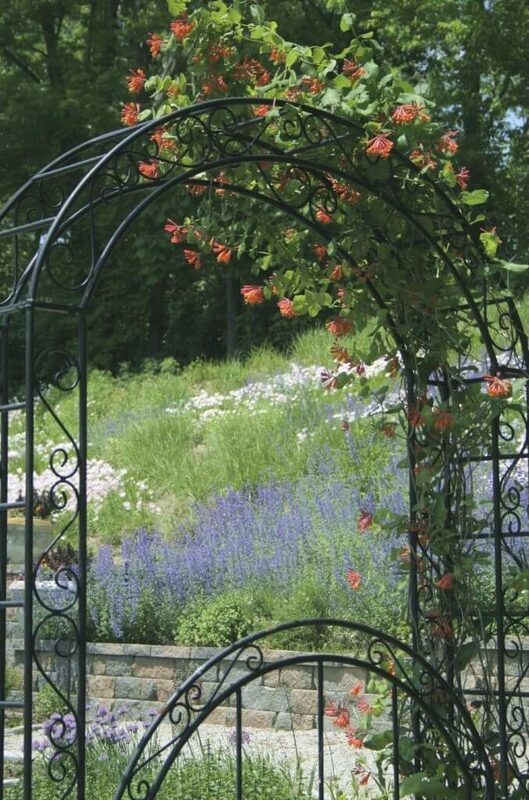 Trellis and lattices are great ways to create decorative vine displays, and are also great for growing grapevines, strawberries, and even tomato plants! 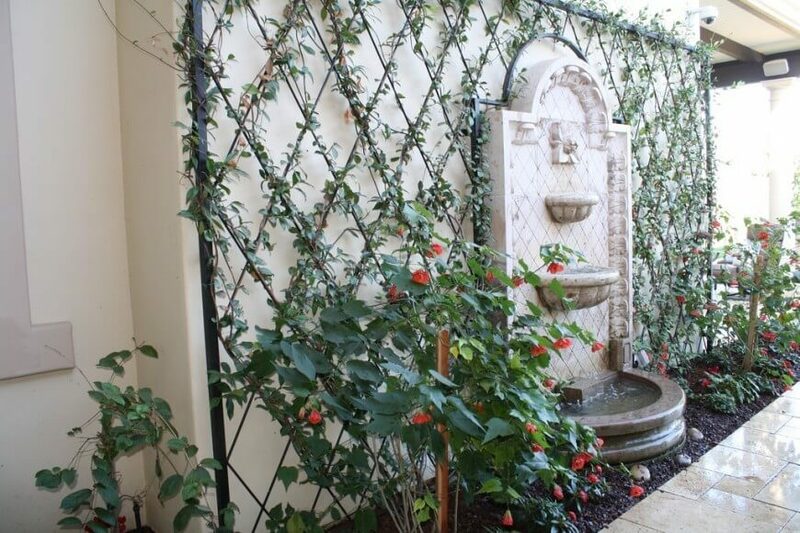 Want to see all the different ways to design using trellises or lattice? 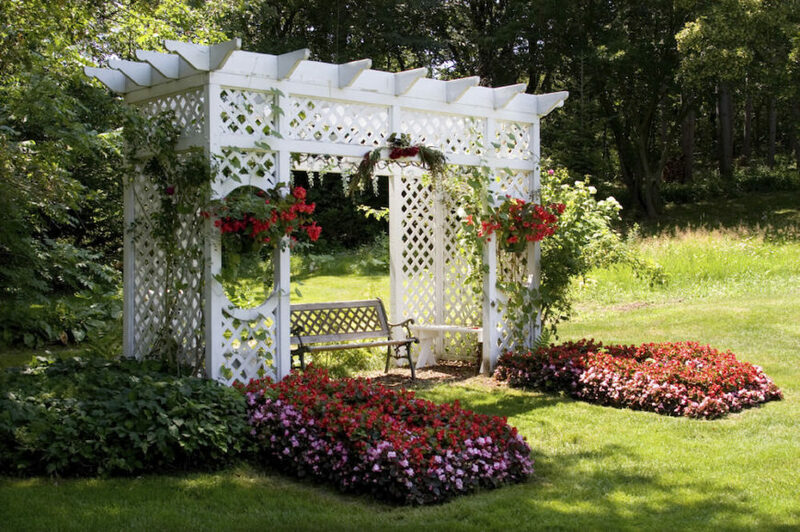 This trellis is combined into an arbor and trained with flowering vines. It also has a wrought iron gate. 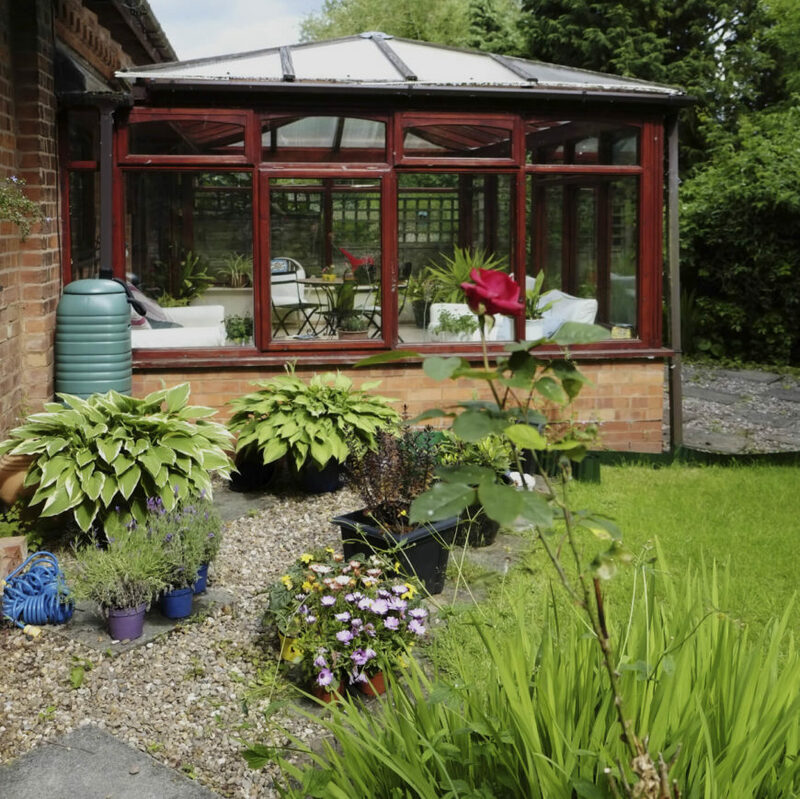 Like a garden shed, if you’re an avid gardener, you might like to have a greenhouse on your property. 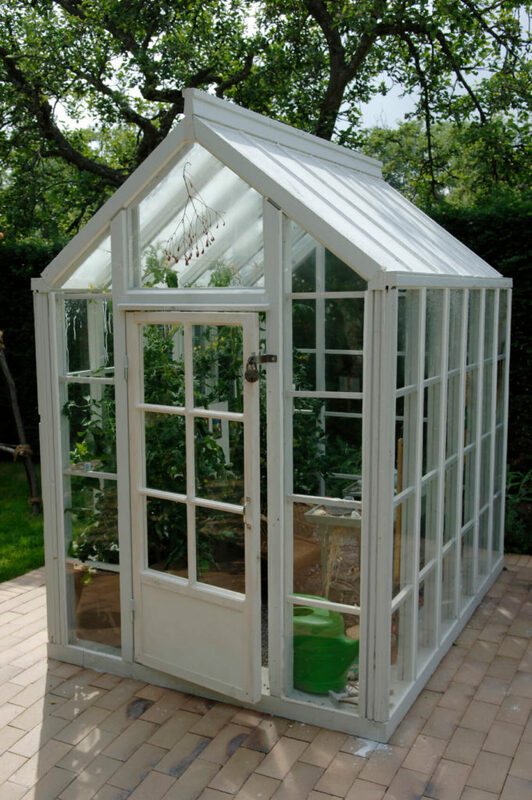 Greenhouses are particularly a great idea for gardeners who live in colder climates. The greenhouse’s glass doors and roof allow sunlight to warm the building, keeping climate sensitive plants healthy. 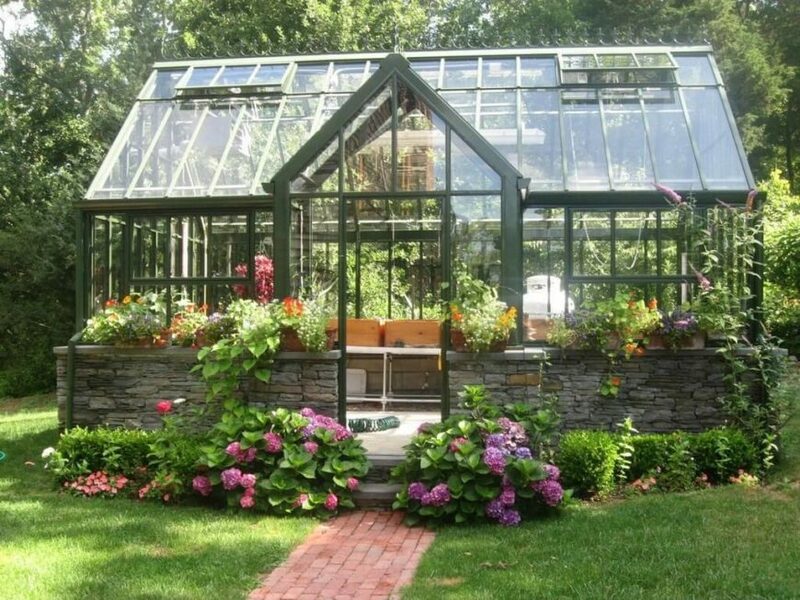 Check out all the fantastic ways to create a greenhouse in your own backyard! A small white greenhouse the doubles as a gardening shed. This structure is placed upon the brick patio. 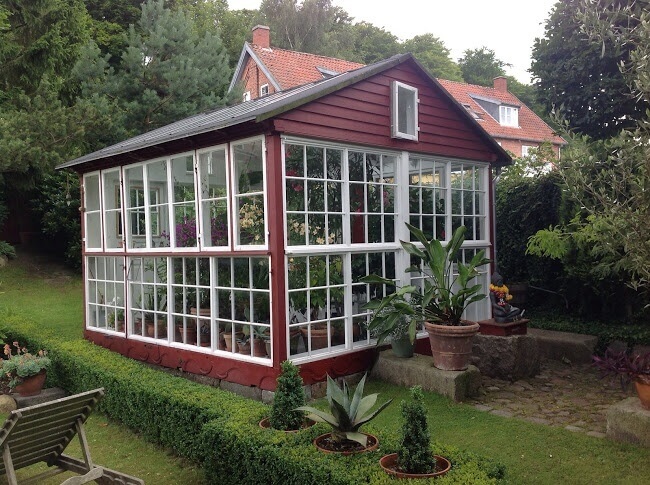 This greenhouse has been combined with a sunroom for a conservatory feel. The building is attached to the rear of the house and is accessible from either the yard or from inside the home. 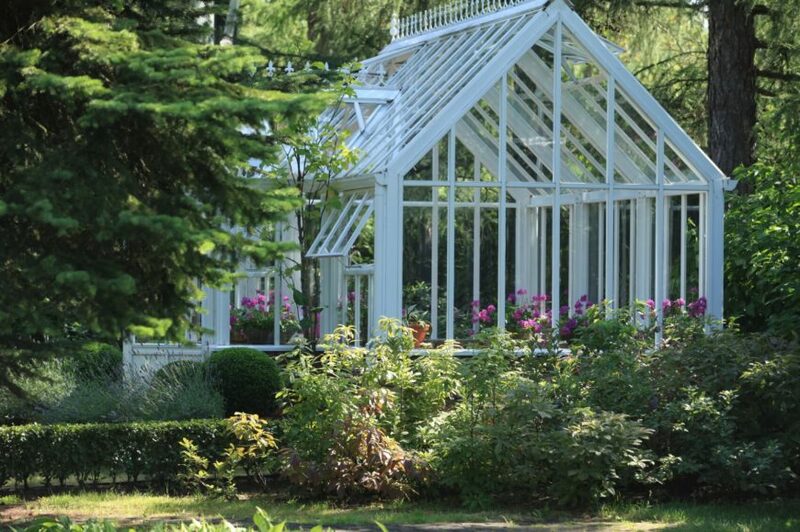 An enormous white greenhouse that is mainly used for cultivating brightly colored roses. While similar to a patio, a garden patio is a type of patio that is kept separate from the home and is accessible only by walking through the garden on a pathway. 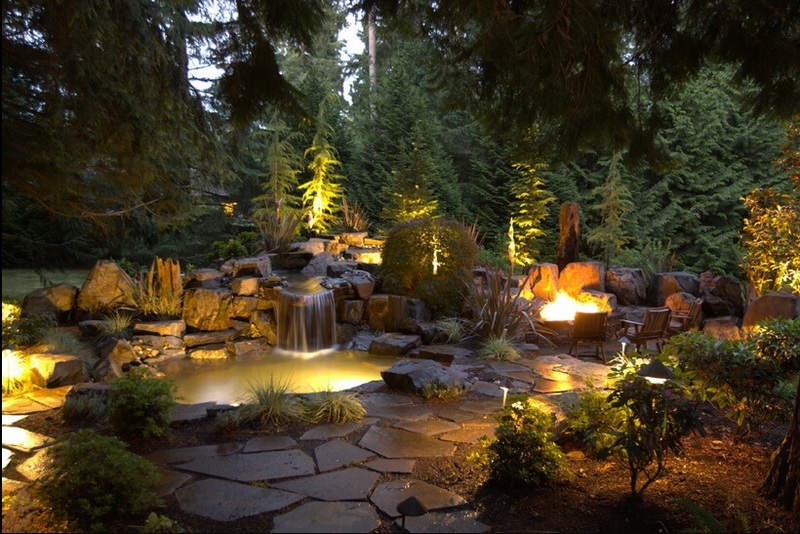 They’re great private refuges that allow homeowners to relax amongst the beauty of their landscaping. 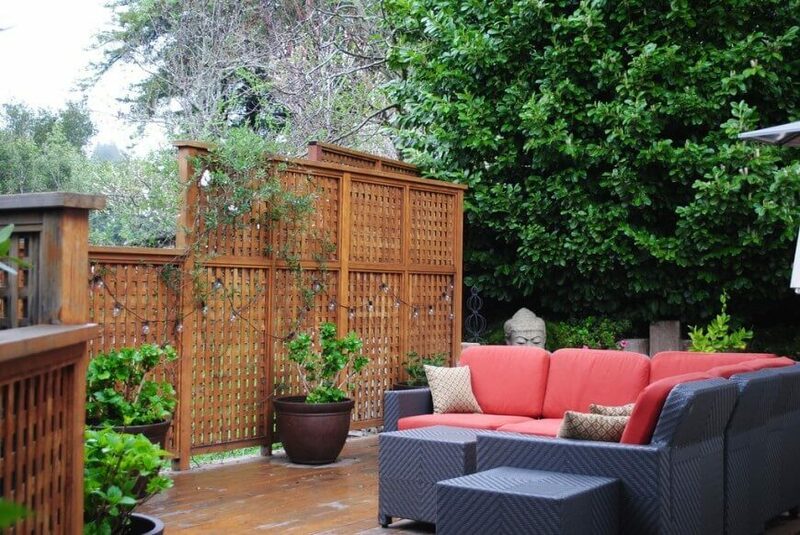 This lovely, small patio is tucked behind leafy plants and tall flowers in great variety. To the right is a man-made creek with a small fountain. This spot is perfectly relaxing with the addition of white noise. A secluded patio tucked underneath a pergola and lit by strands of twinkling lights in addition to small lights tucked into the trees beyond. 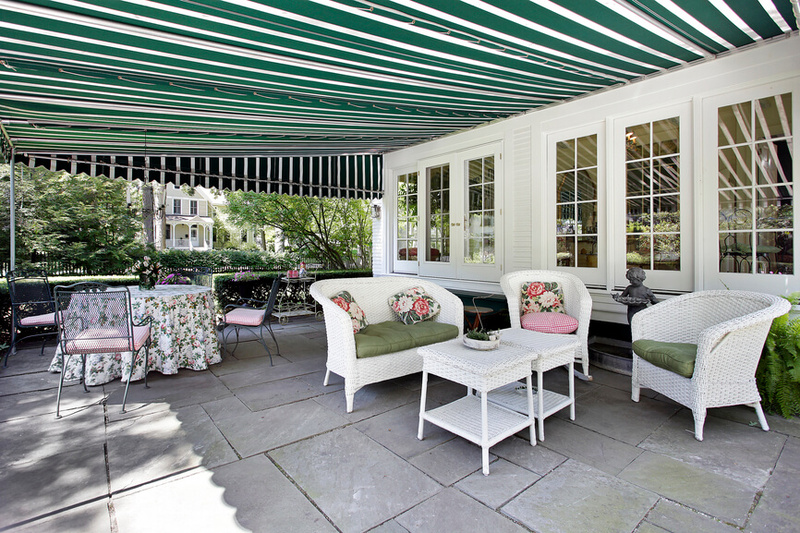 Another secluded patio underneath a large white pavilion. A small chandelier hangs from the center above the coffee table. Privacy screens are the perfect way to create a secluded spot to entertain or relax even in a small yard. In larger yards, privacy screens can be used to segment off a section of the property for a specific purpose. A private seating area is enhanced by adding a wooden screen to one side. 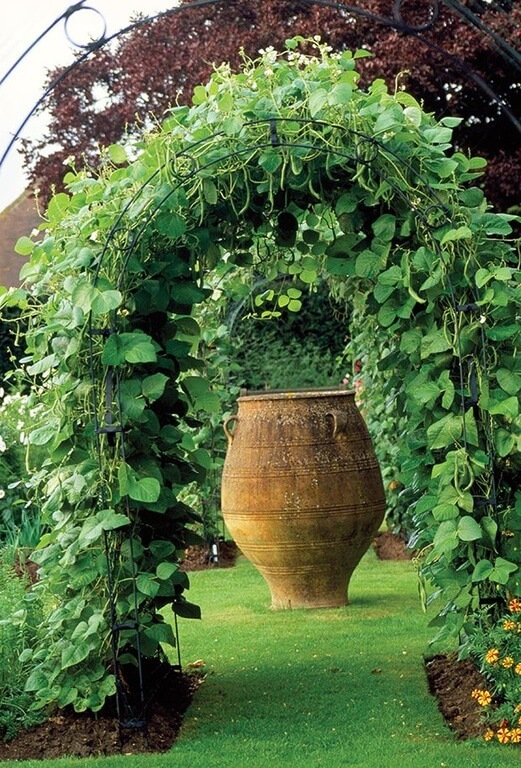 Trailing vines draw the seating area back into the garden. 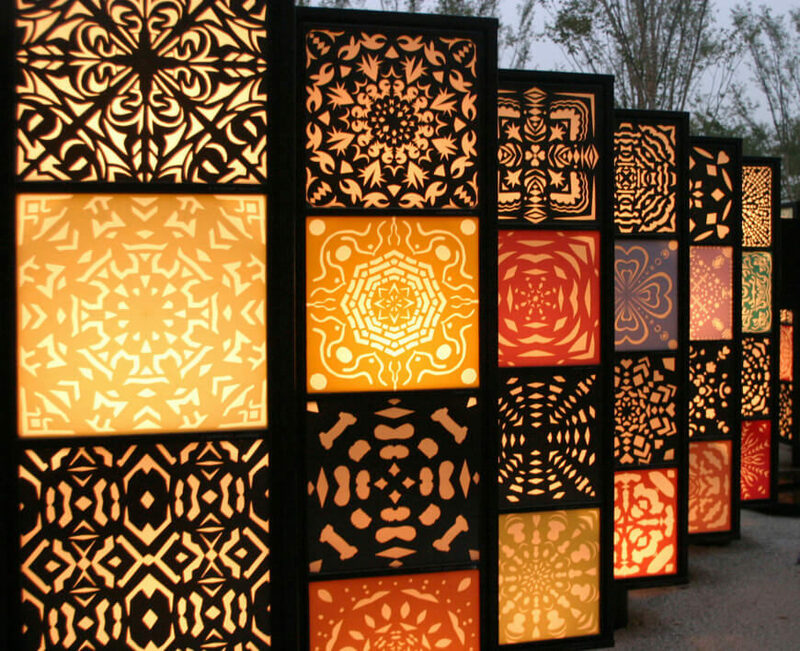 These lighted privacy screens make a serious statement when added to a garden or patio. 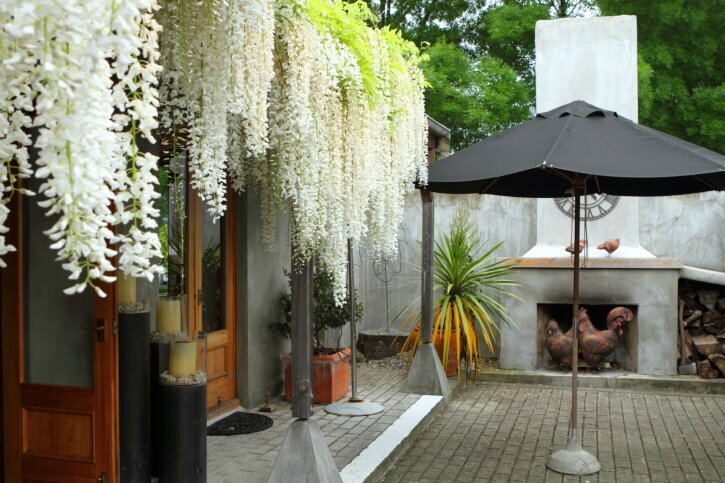 They’re best placed in patios where the landscaping is simplistic, so they don’t compete. 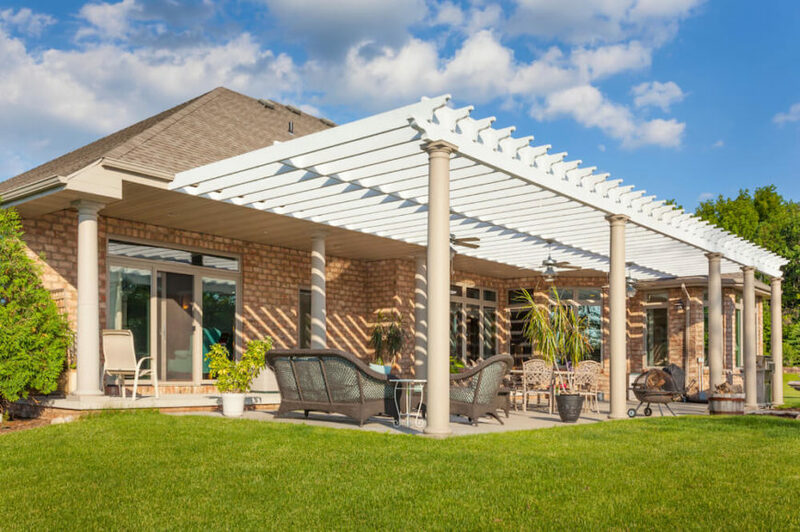 Privacy screens come in a wide variety, and these bamboo shades are the perfect way to combine the need for a privacy screen with an existing pergola structure. 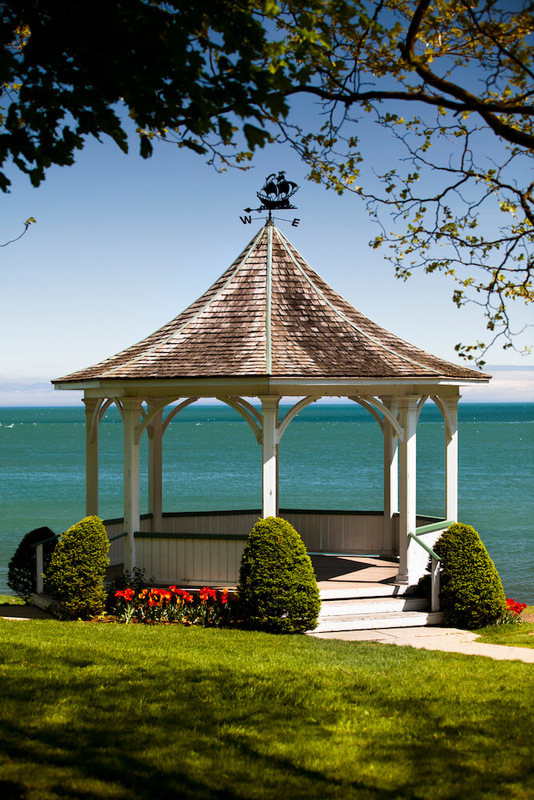 Pavilions are the last of the trio of often confused structures that also includes gazebos and pergolas. 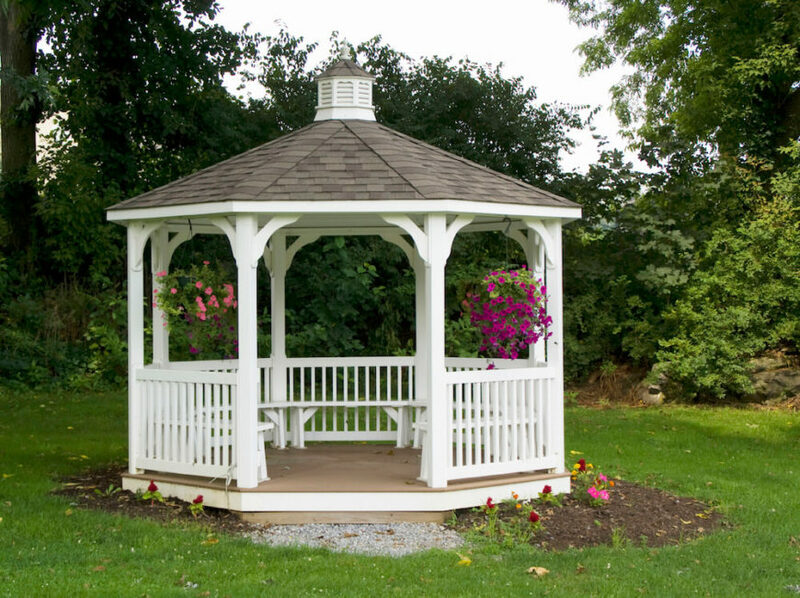 The difference between pavilions and the other two structures has to do mainly with size, but gazebos are typically not enclosed on the side and feature complete roofs that are similar to the roof on a home. Pavilions are a great place to relax with family and friends. Find more pavilion ideas here! This large pavilion breaks the rules a tad by adding a railing, but that is due to its position on at floating bridge. This pavilion is a great place to stop and admire the landscape. 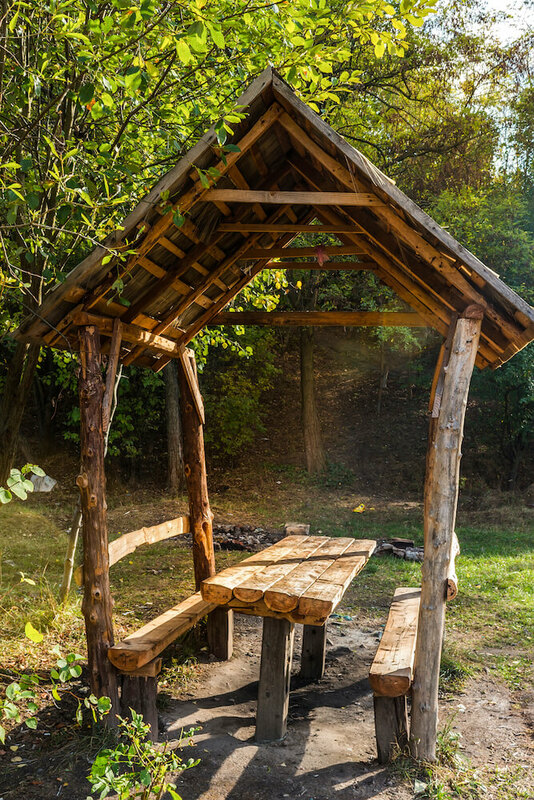 A tiny rustic pavilion with a built-in picnic table. This small area is the perfect spot to stop for a picnic lunch while on a hike. 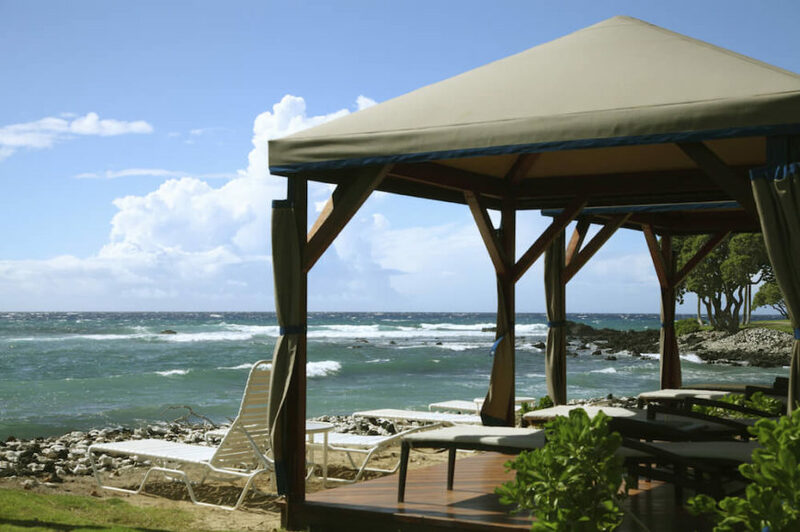 A beachside pavilion with lots of lounge chairs beneath. The rocky shores lead into the pounding surf. 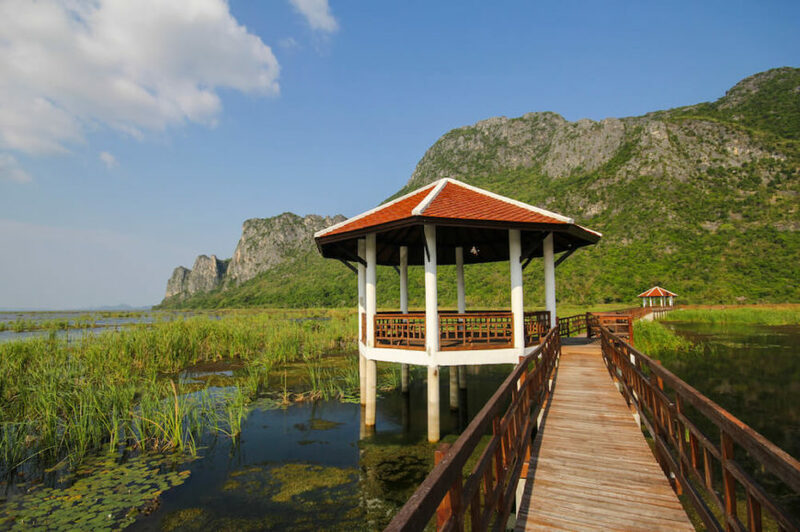 This stilted pavilion rests alongside a bridge across a large marsh and overlooks the beautiful mountainous region on either side of the marsh. 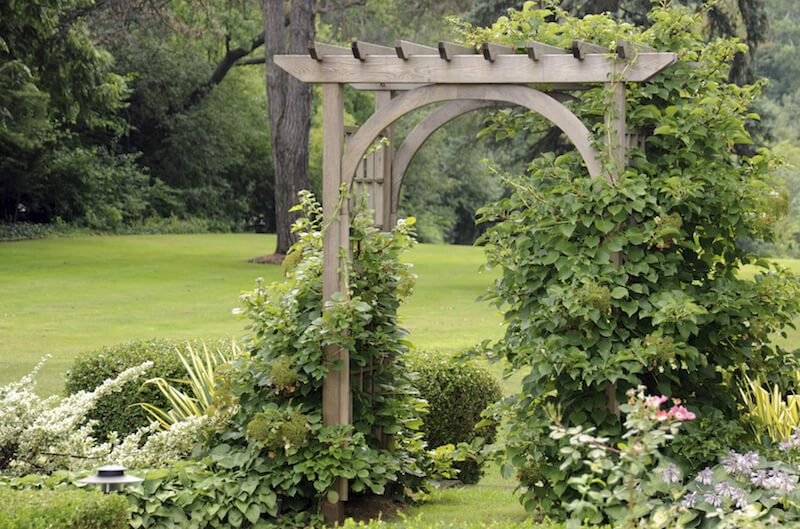 An arbor is simply an arch-shaped trellis that’s meant to cover part of a pathway. 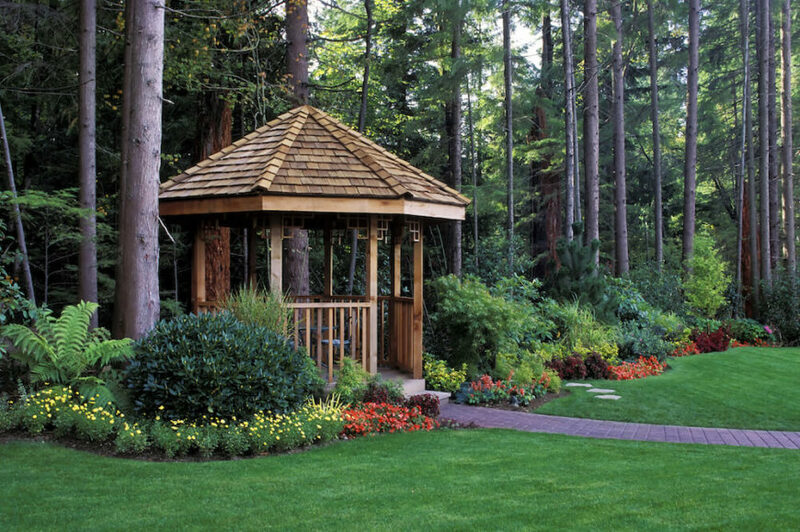 They’re purely decorative, but with a bit of imagination, an arbor can be the jewel of your backyard or garden. 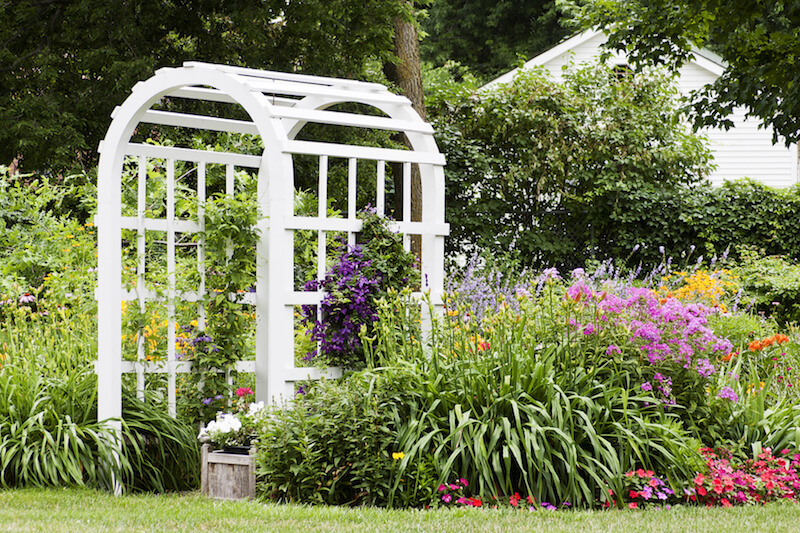 Find the perfect arbor to add elegance to your backyard garden with our guide to arbors. A beautiful white arbor tucked into a massive hedge wall, creating a portal through to the other side of the garden, a large courtyard. Along the flagstone path leading to the arbor are small but thick plants. 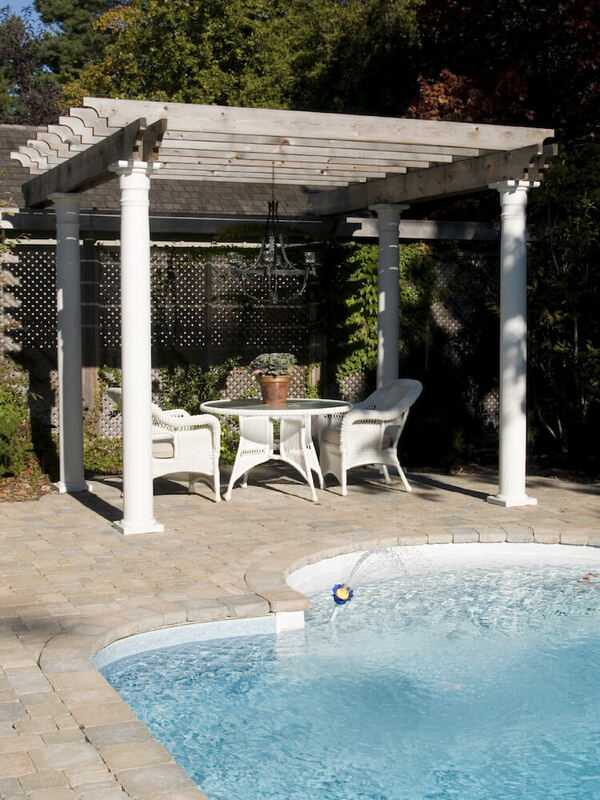 This is a much more simple design, with a top similar to a pergola. The sides are covered in dense vines that merge into the planting beds on either side. This arbor is a little thicker and has much wider lattices on either side. It’s the perfect accompaniment to this thick, colorful garden. 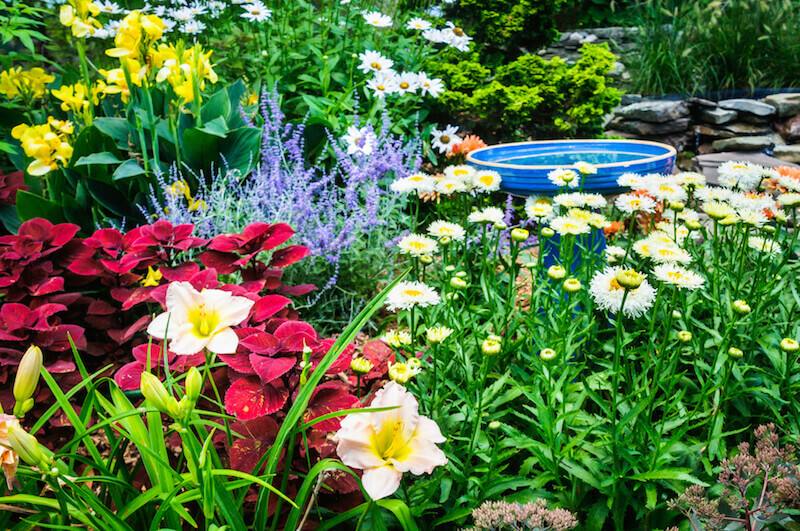 If your backyard is a little smaller or you’re looking to add a little bit of beautification while still sticking to a tight budget, you might want to consider adding more flower beds, potted plants, or other solutions for adding color and variety to your existing garden. 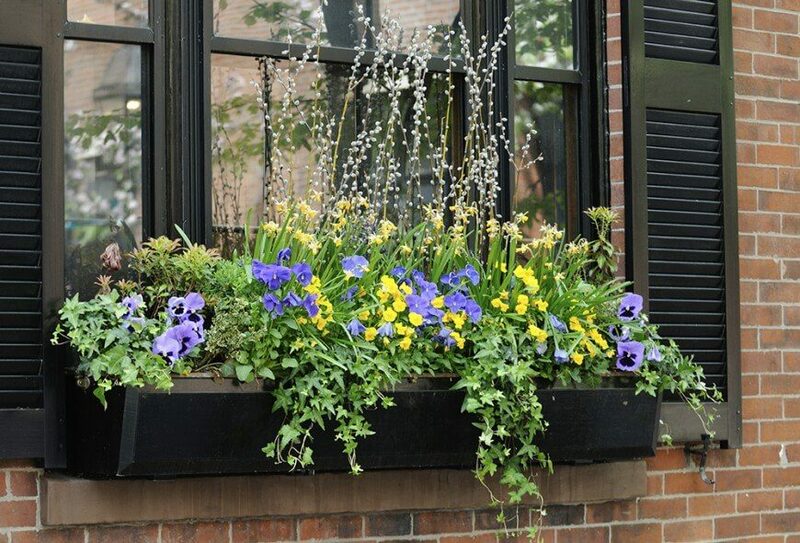 Flower boxes are a simple way to make a big impact anywhere you have a window. They’re perfect for adding bold pops of color in a very targeted way. With so many ways to personalize a flower box, it’s a great way to spruce up your home. These bright white wooden window boxes are simply constructed, which allows the lovely lavender pansies to take center stage. This is a simpler design. 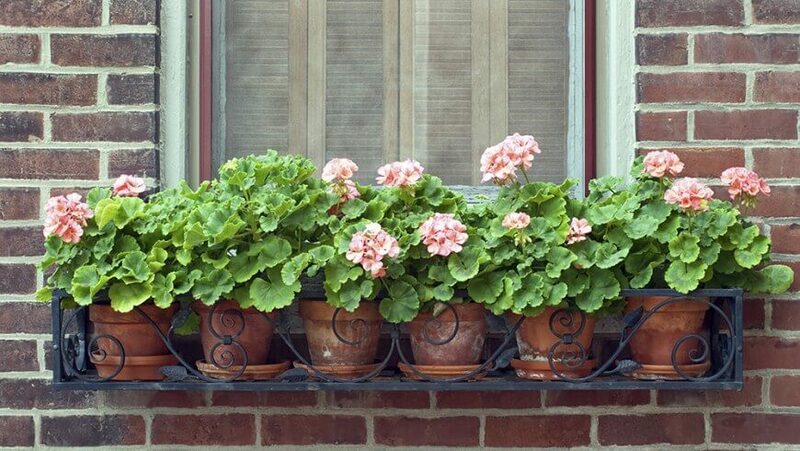 The window box itself is wrought iron with lovely scrollwork, but the geraniums are planted separately in terra cotta pots before being placed in the box. This makes it easy to swap out flowers when needed. 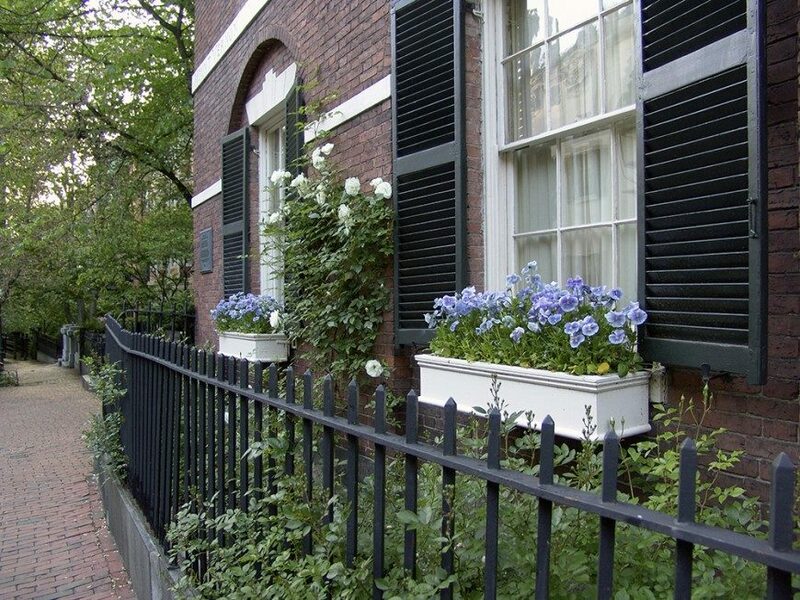 This is a simple black window box overflowing with trailing vines, brightly colored flowers, and some taller plants for texture and height. Terraced gardens aren’t an incredibly popular feature outside of agriculture or large, public ornamental gardens, but they’re a great way to landscape a hilly yard, and they’ll help keep your soil in place and reduce runoff from your property. 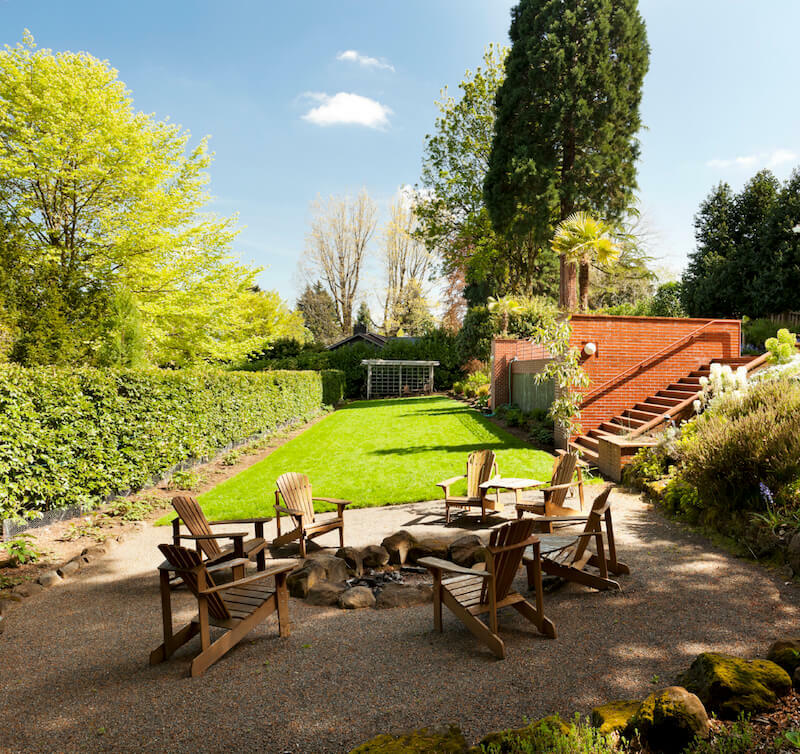 This garden has tall terraces that lead up the hill at the back of the property. Stairs built at the center help the homeowners get up to the higher terraces to water or fertilize. The stone terraces lead along the side of the house following the shape of the walkway running alongside it. 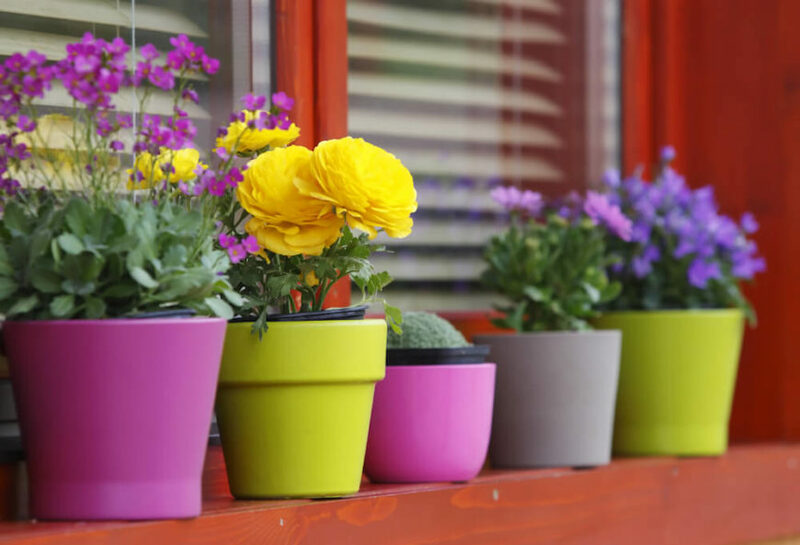 Adding the proper planter full of colorful flowers is a great way to spruce up any yard or patio. 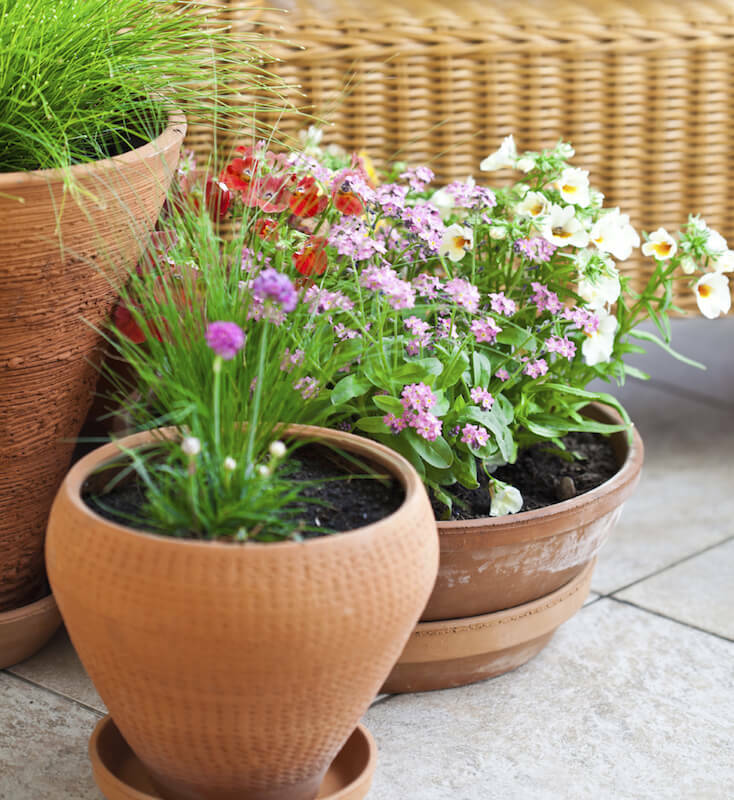 Depending on the size of your yard and your personal style, there are a lot of interesting objects that can be transformed and upcycled into beautiful, unique flower pots or planters. 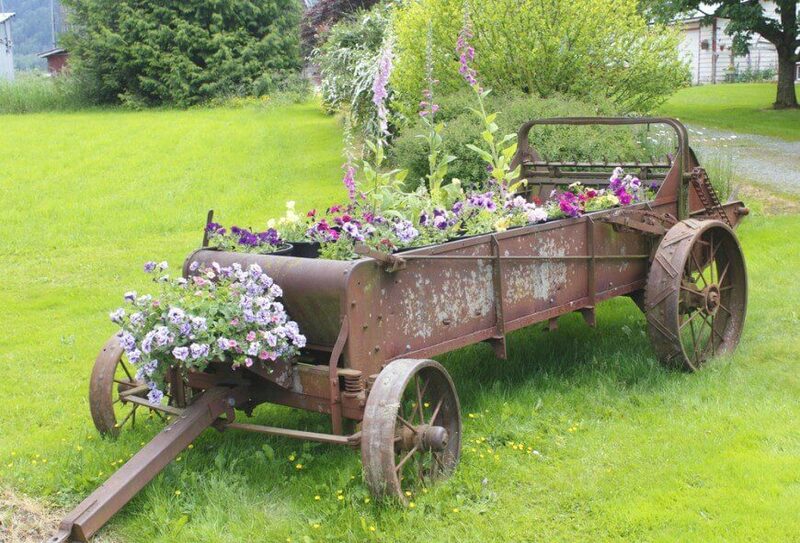 This antique, rusted wagon is filled with a large varieties of flowers, including a few taller varieties to give the display height. If you prefer a more simple approach, some ceramic, brightly colored planters might be just the ticket. 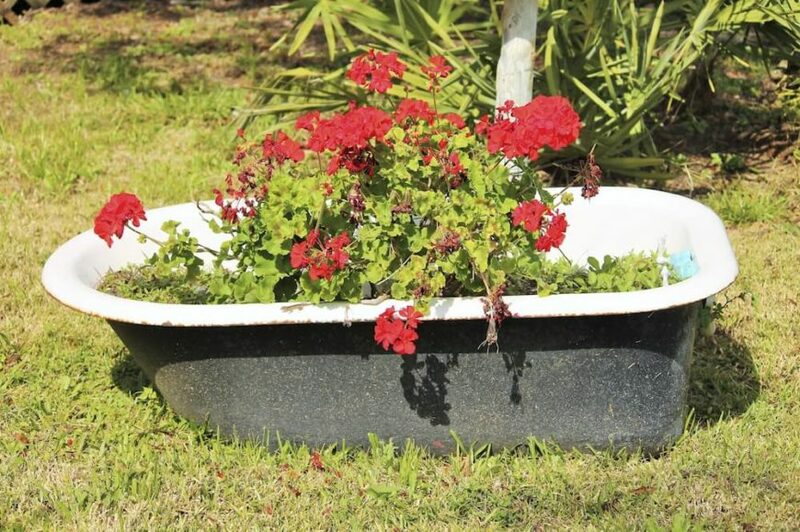 Even an old clawfoot bathtub can get new life as a planter. 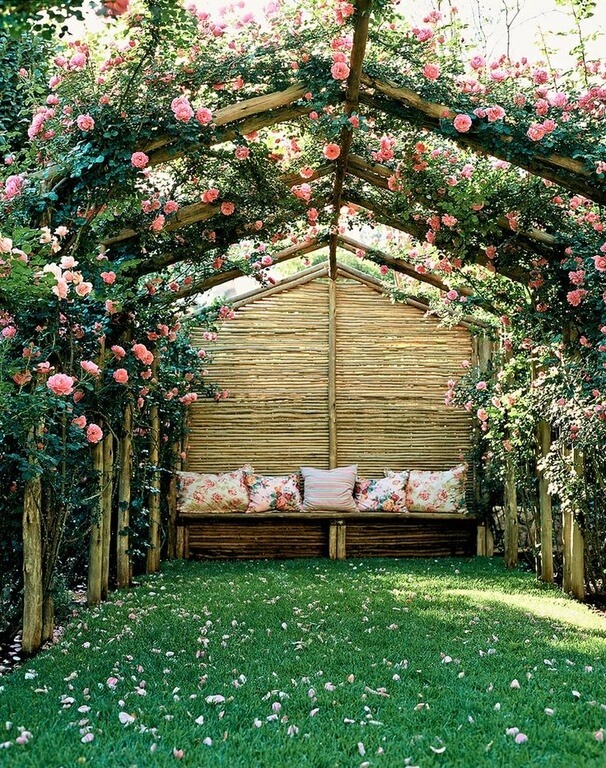 This idea is perfect for an eclectic or country garden. 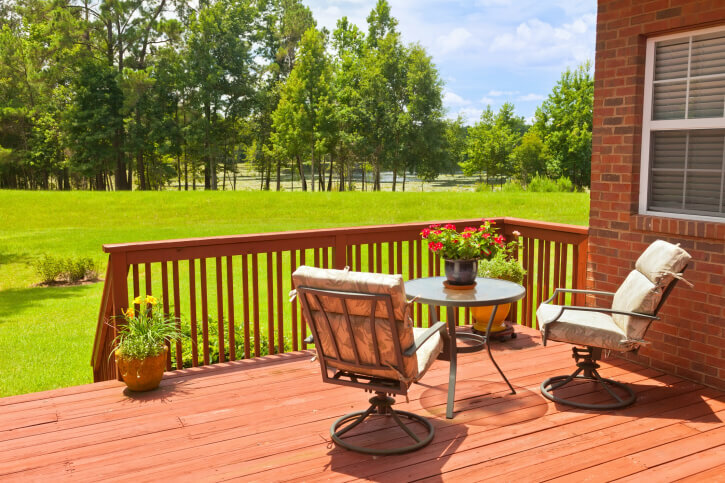 Even if your backyard is a little small, with just enough space for a patio, you don’t need to abandon dream of brightly colored flowers decorating your outdoor living space. Container gardens are easy to assemble, care for, and even bring inside before the first frost. 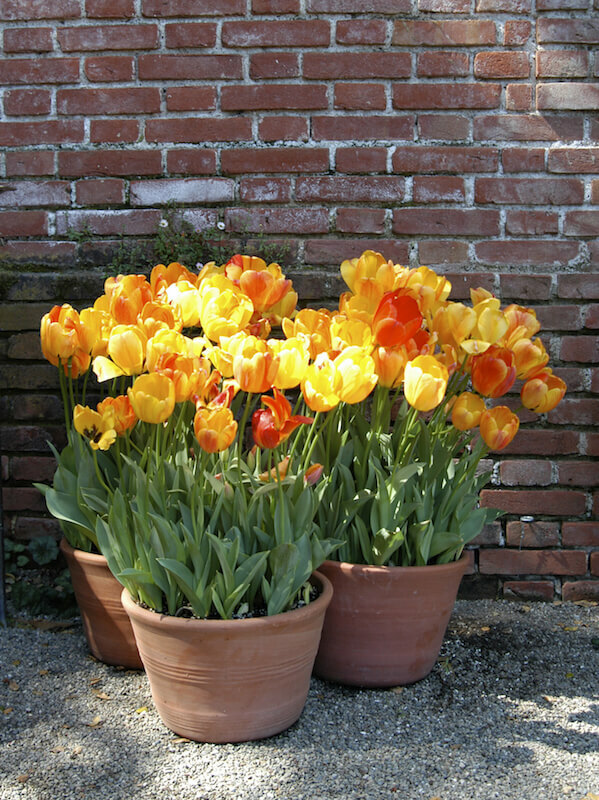 Beautiful red, orange, and yellow standard tulips dominate this small arrangement of three terra cotta planters. Choosing planters of different heights, textures, and shapes is a great way to add subtle texture to a small container garden. Vary the colors and materials as well. 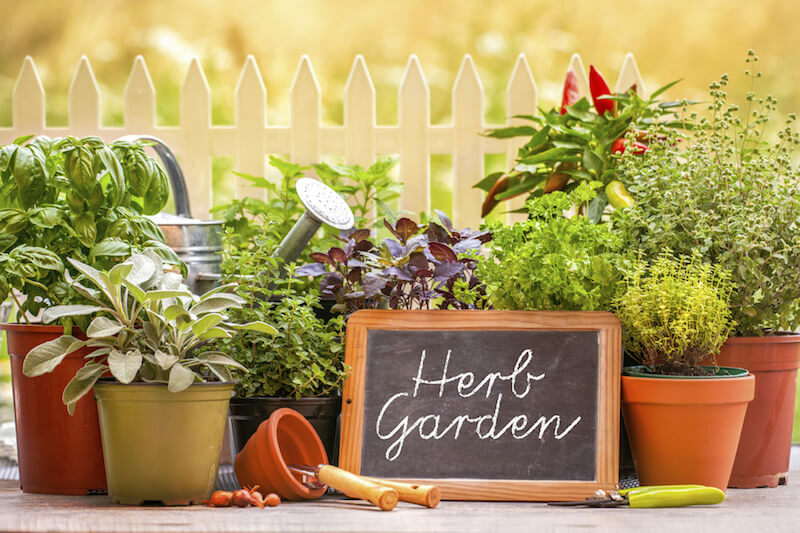 Herb gardens do especially well in container gardens, as it’s easy to keep the different herbs separate. 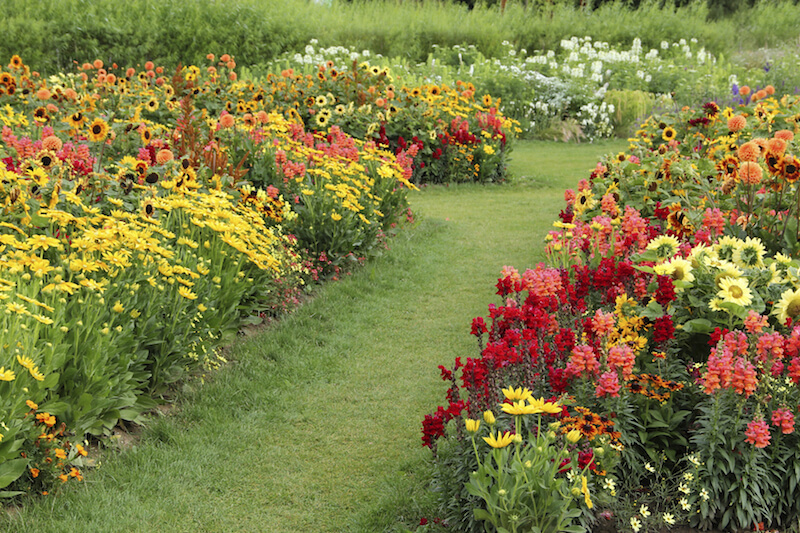 If you do have the space for showy displays of flowers, consider adding bold swaths of flowers in thick beds. They require some maintenance, but they’re totally stunning. 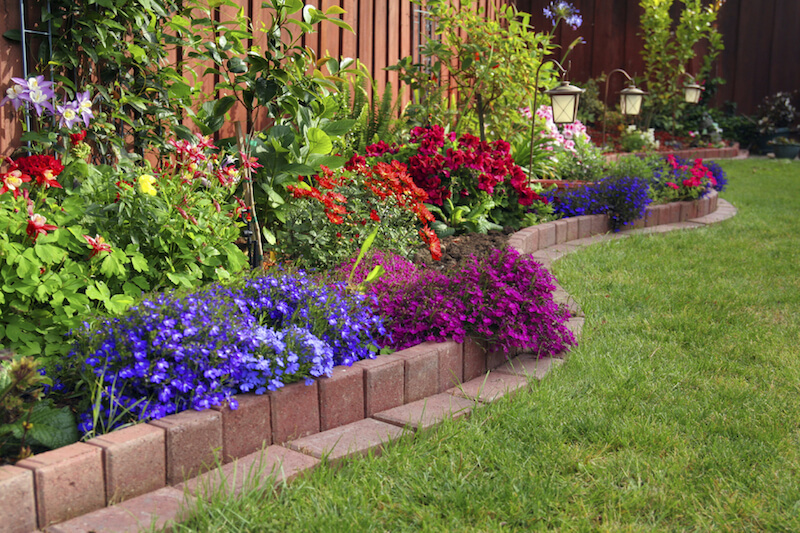 Explore the possibilities you have when you add a flower bed to your backyard. This lovely garden has dozens of colors of flowers packed into beds that slowly merge together, creating a quilt-like pattern of delicate flowers. 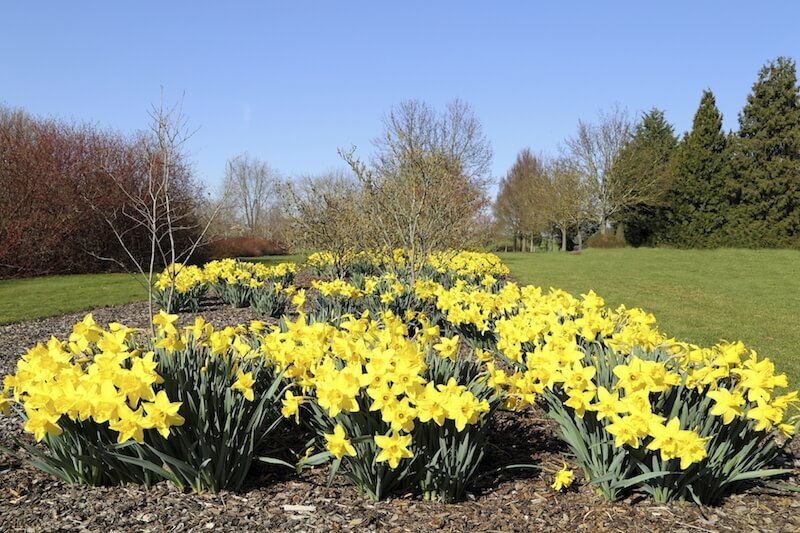 While not as densely packed, this flower bed filled with daffodils provides much needed color to this manicured lawn. 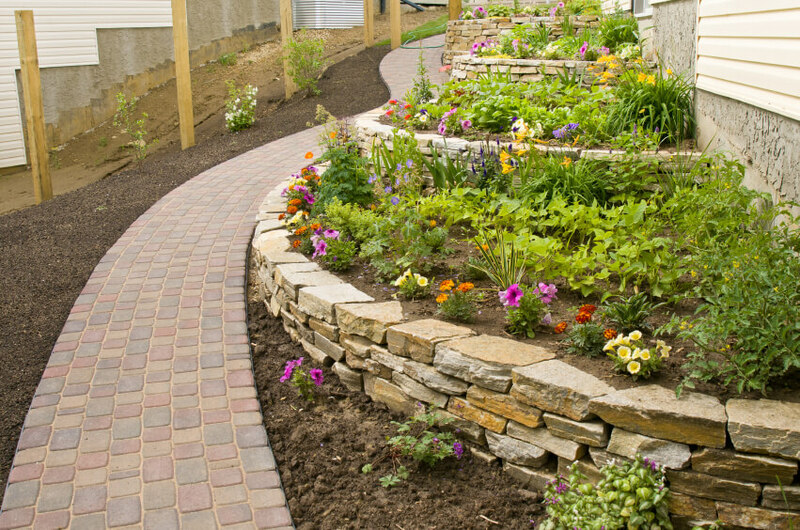 If you prefer a smooth edge, use pavers to easily define your flower beds. Then feel free to allow your plants mingle in an explosion of color. 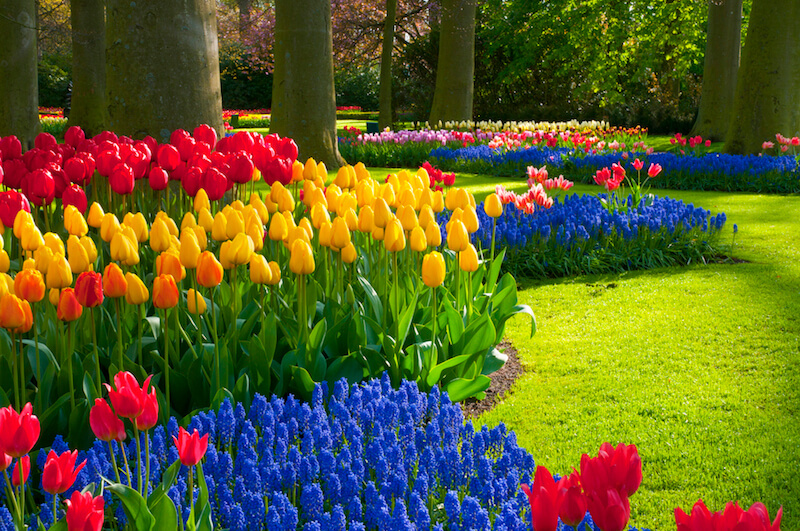 Tulips come in incredibly bright colors, and when paired with smaller flowers that are just as vibrant, create a blanket of beauty that has few rivals. 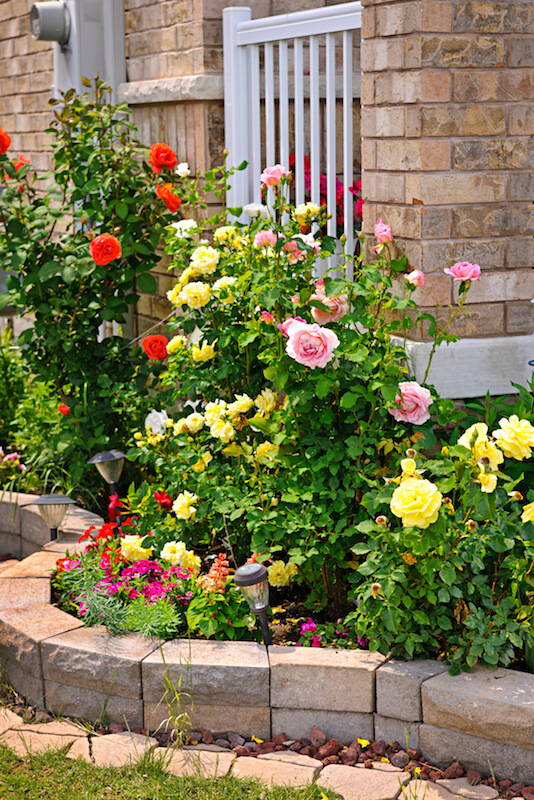 Roses are classic choices for gardens, as they come in many colors and have large, showy blooms and a lovely fragrance that everyone loves. They also come in many different varieties, from large bushes to climbing roses that look fantastic on trellises. Roses are traditionally beautiful. Learn how to incorporate them into your garden. 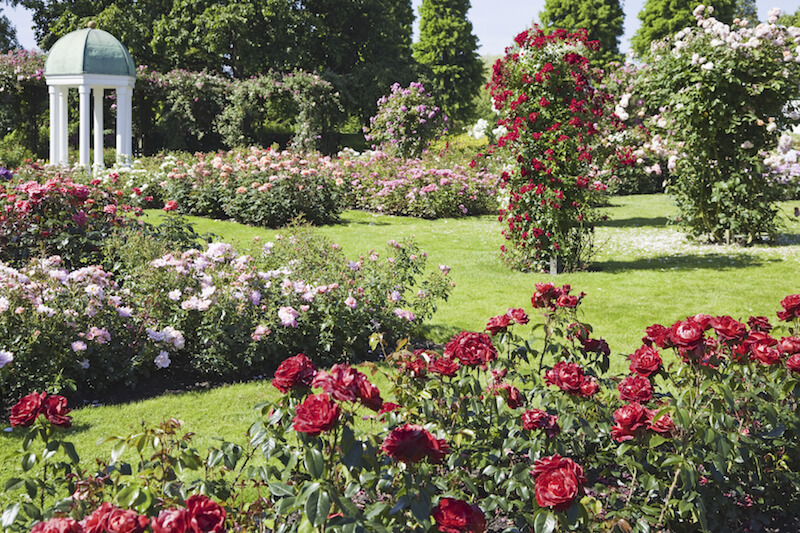 This thick garden is just filled with many different kinds of roses, creating a classic, and no doubt fragrant garden. 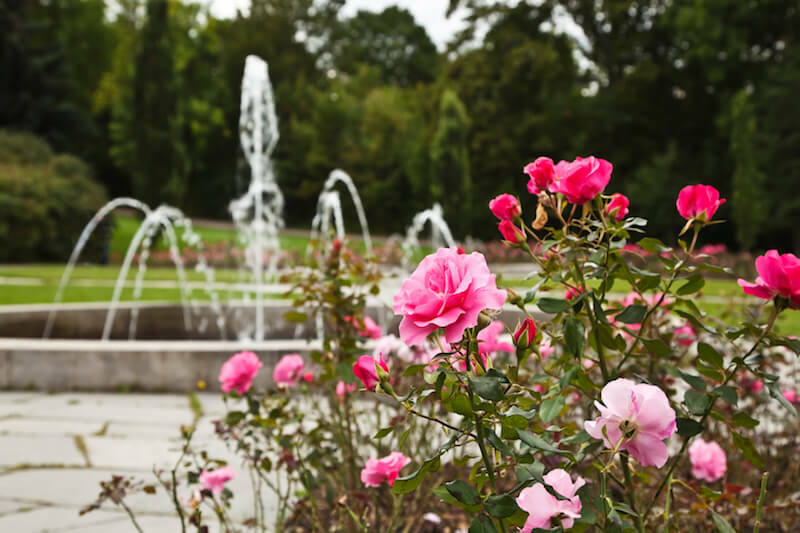 These beautiful magenta roses look amazing when placed in front of a large, showy water fountain in a plaza. Even in smaller planting beds, roses have a certain appeal. This display has light pink, red, and pale yellow blooms. 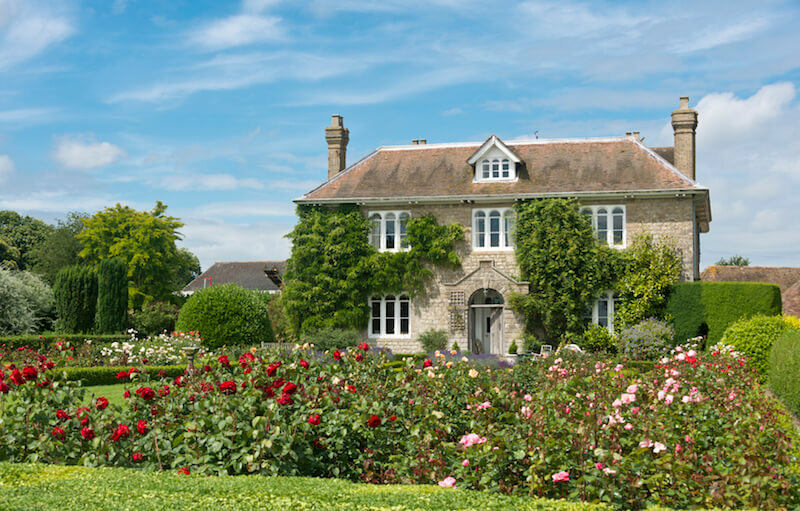 This country estate is filled with slightly overgrown rose bushes, creating a magical and beautiful display. If you’d rather start a vegetable garden, there are a lot of ways to make it easier on your knees and back. 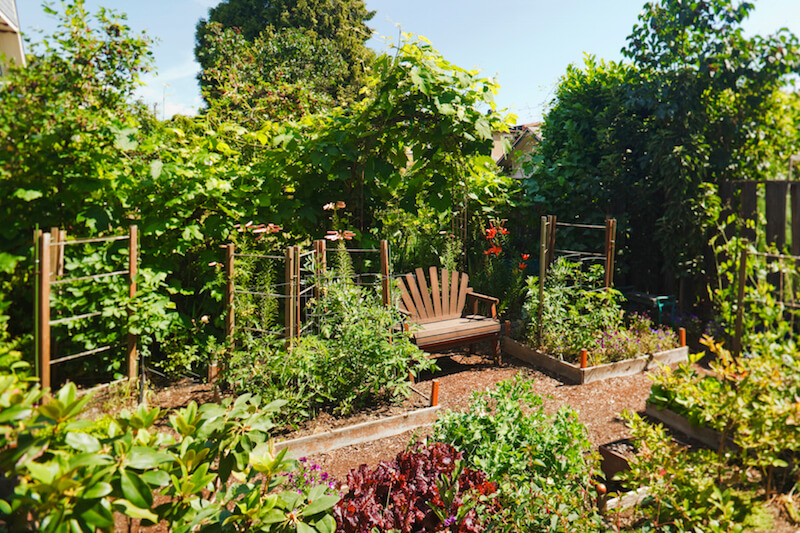 Vegetable gardens are rewarding in different ways than flower gardens, namely in that you can eat the fruits of your labor, rather than admire their beauty. Try growing your own vegetables! 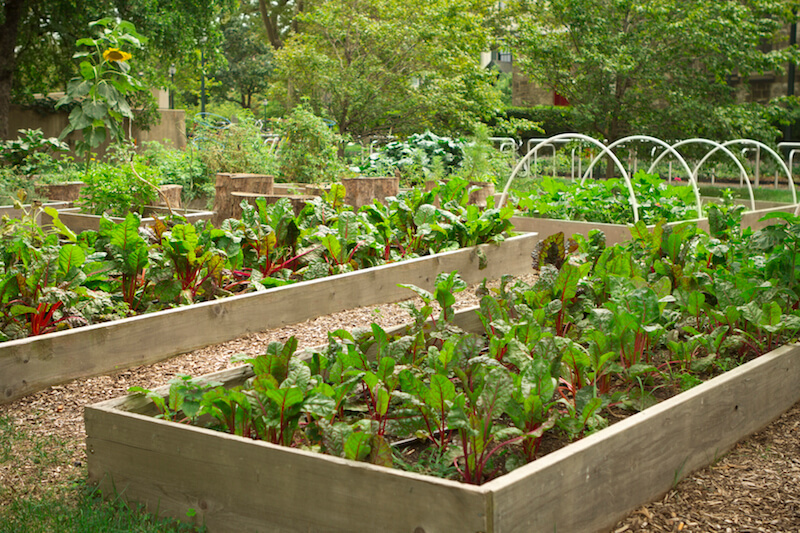 Vegetable gardens come in all shapes and sizes. Learn how to add them to your backyard here. 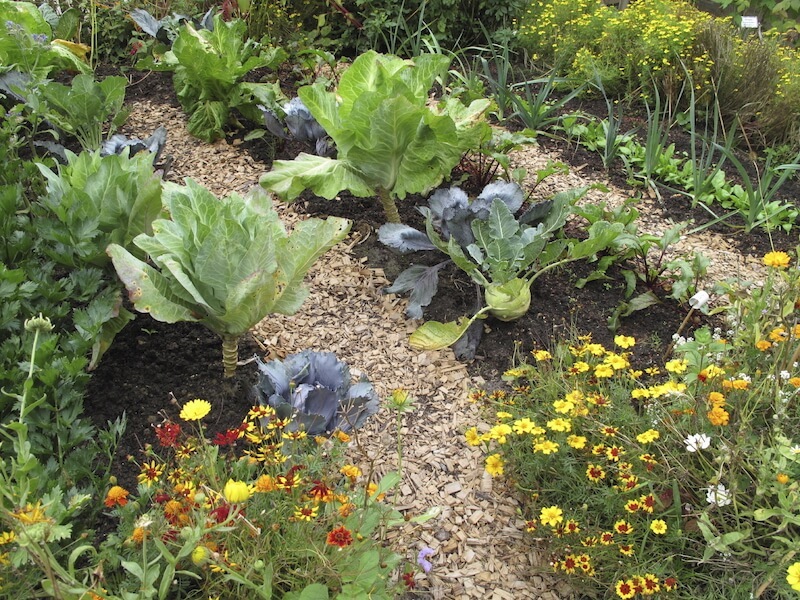 This is an example of a classic vegetable patch with mulch between the rows of vegetables to ward off weeds. Some small flowers are complementary to vegetables, and keep pests away. If you prefer, you can add small planting boxes to keep your plants corralled and separate. Add cages for taller plants like beans and tomatoes. These raised beds make it easier to keep certain plants separate and the soil free from weeds or volunteer plants. Not all gardens need to be rife with flowers to be beautiful. For those with severe pollen allergies, a simple green garden with bushes and ornamental trees is infinitely preferable. If you have allergies but still love a lush garden, shrubs may be a great choice for you, so you can still enjoy your outdoor space. Just like with flowers, shrubs and bushes come in so many different textures, heights and shades that you can create a varied display easily. 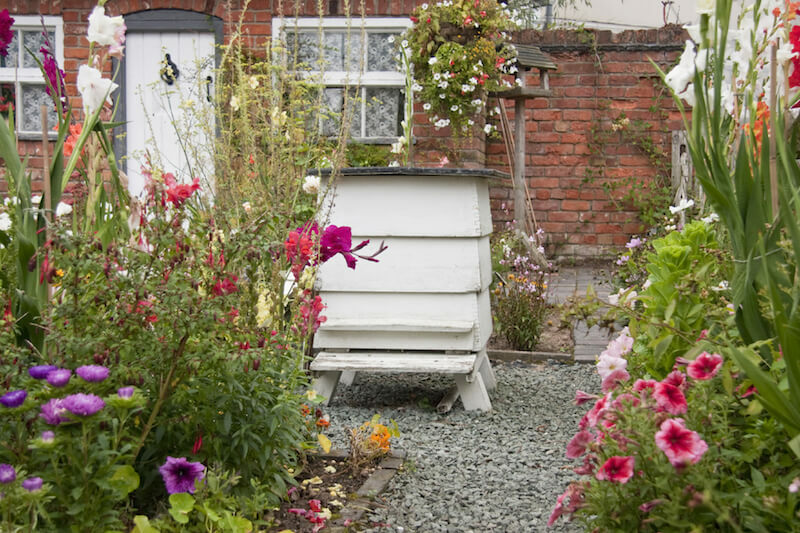 As mentioned above, small yards can also have beautiful flower displays. You’ll just need to be clever about the way you plan out your displays to maximize the beauty while not sacrificing function. 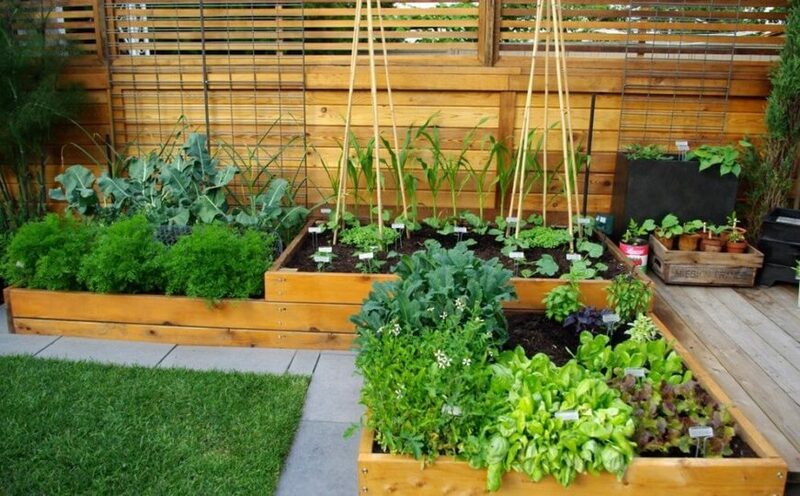 Small gardens are perfect for vegetable gardens or flower beds, and are super manageable. 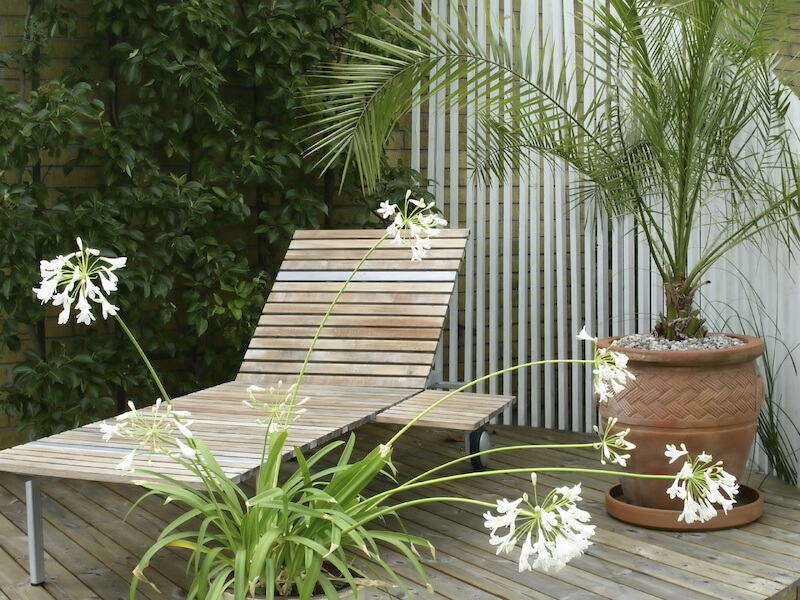 Check out all the ways to incorporate them into your backyard! This garden is packed around the patio, leaving the rest of the yard for play. Of course, if you have the space, you can really go all out with your designs. 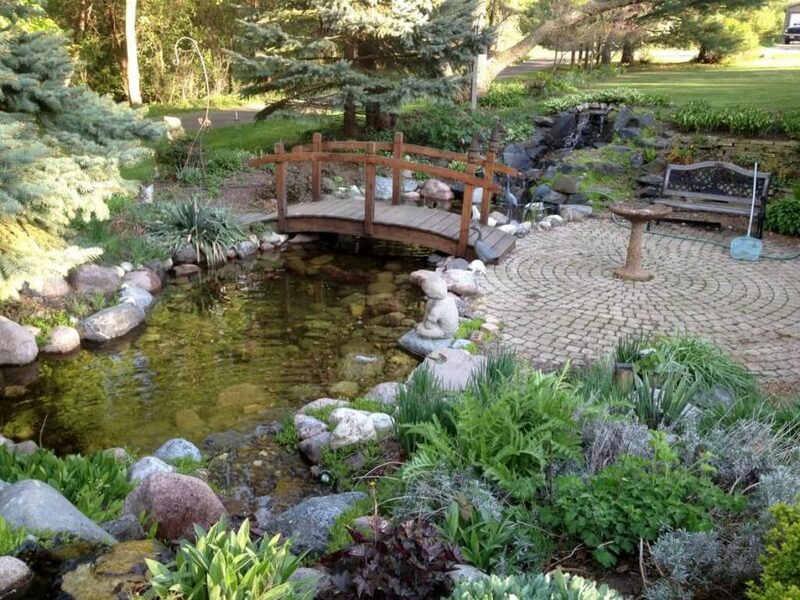 Add a pond, statues, larger trees, a pathway… it’s up to you! For those with spacious backyards, a large garden is a way to make a statement. 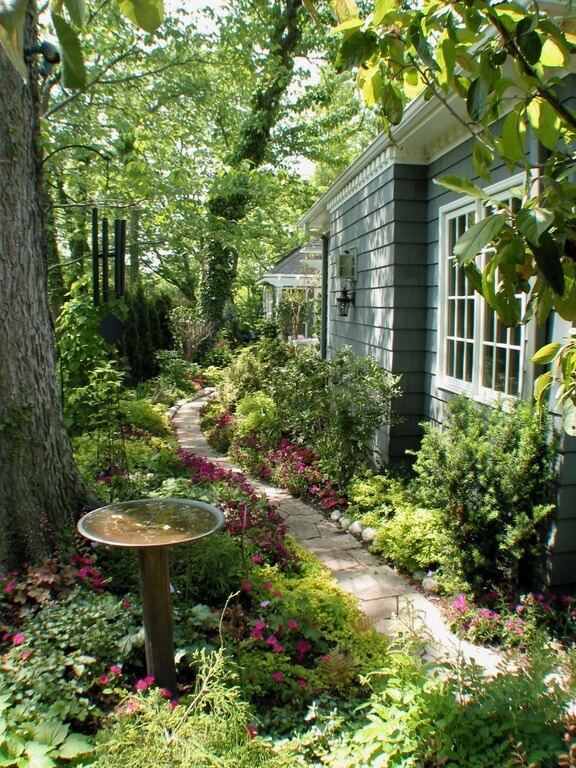 Check out all the ways to design a large garden! This garden extends into the distance, never seeming to end. 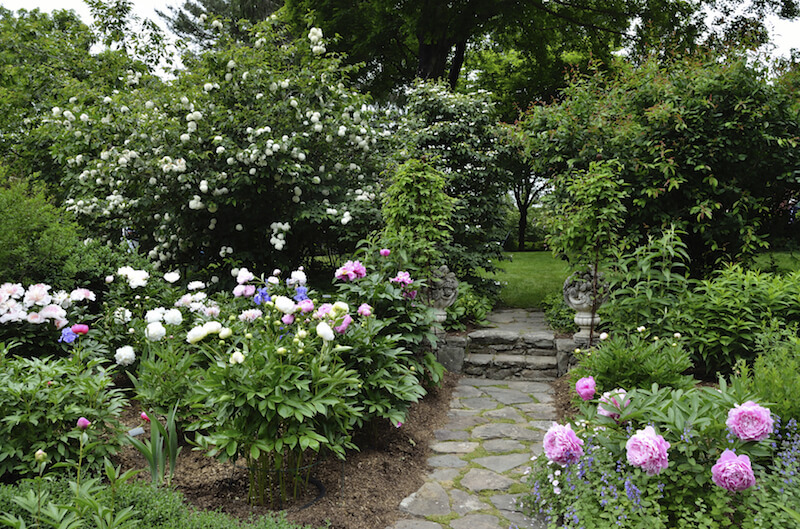 A pathway of grass winds through the thick displays of ornamental trees, shrubs,and flower beds. A simple gravel path winds through this thick garden and off into the distance. 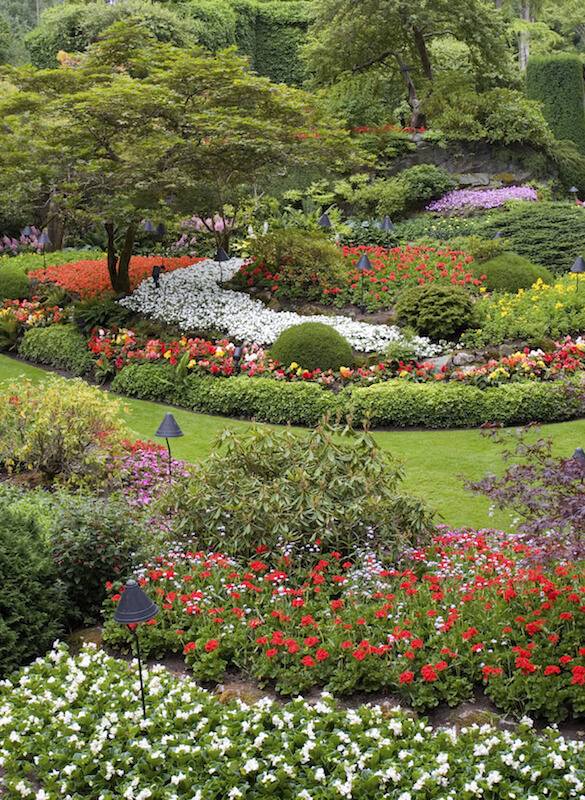 Vibrant color is center stage in this garden. Yes, most gardens do have plants, but there are a few that don’t, like some types of zen gardens. Either way, if you choose to add plants to your garden, you’re sure to have more maintenance than grass-only or zen gardens. There are so many different ornamental plants that you can combine to make your own unique garden. Check out all the ways other gardeners have designed their gardens! This contemporary garden is packed with dense grasses and plants, but not many flowers. The result is a mostly green, but relaxing garden with just a hint of fragrance. Large flagstones make up a pathway through this densely populated garden that includes shrubs, grasses, trees, and water-loving plants. 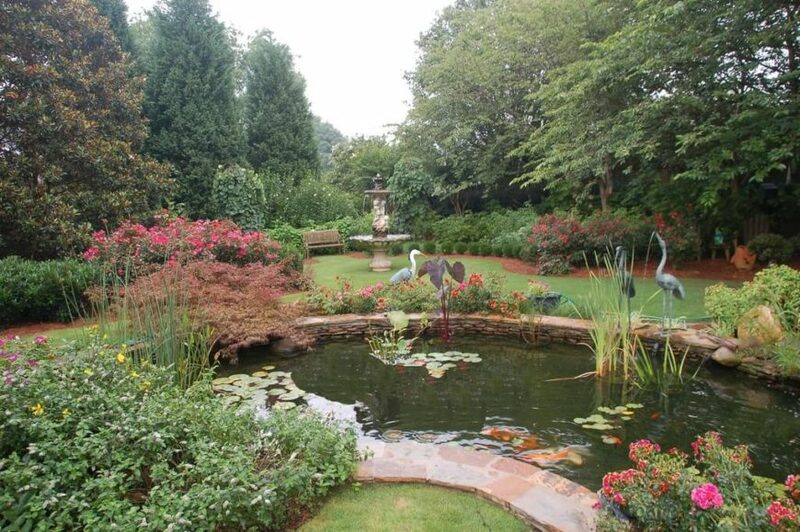 This garden is dense as well, filled with flowering ornamental trees and flowers with large, showy blooms. 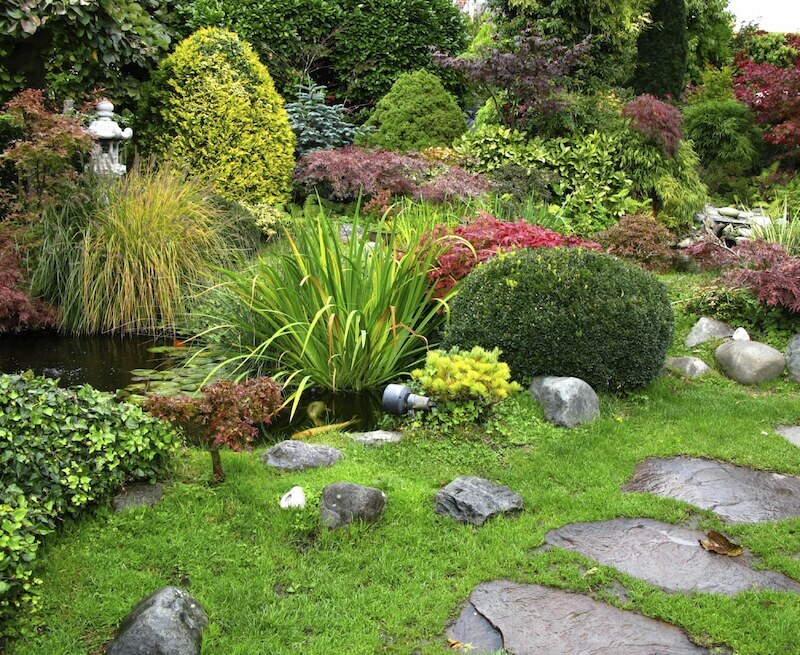 Rock gardens, or Alpine gardens, favor landscapes with hills, lots of large rocks or boulders, and naturally growing plants found in those environments. 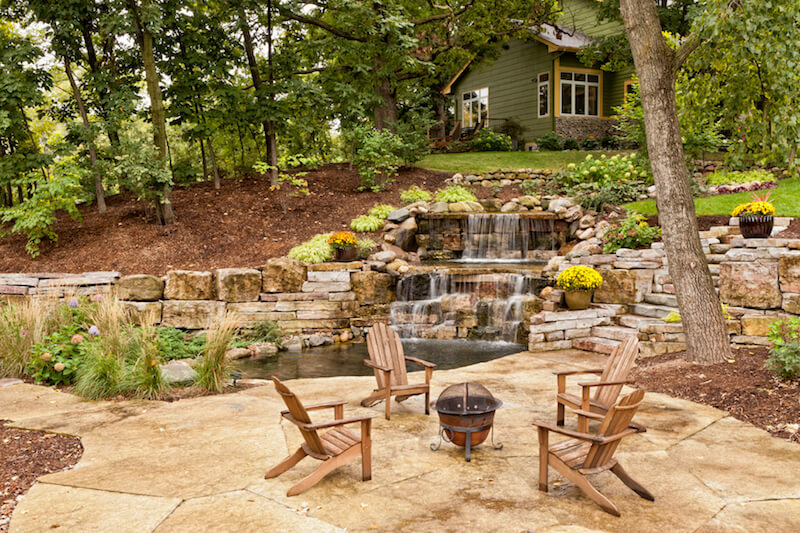 Have a hilly backyard? 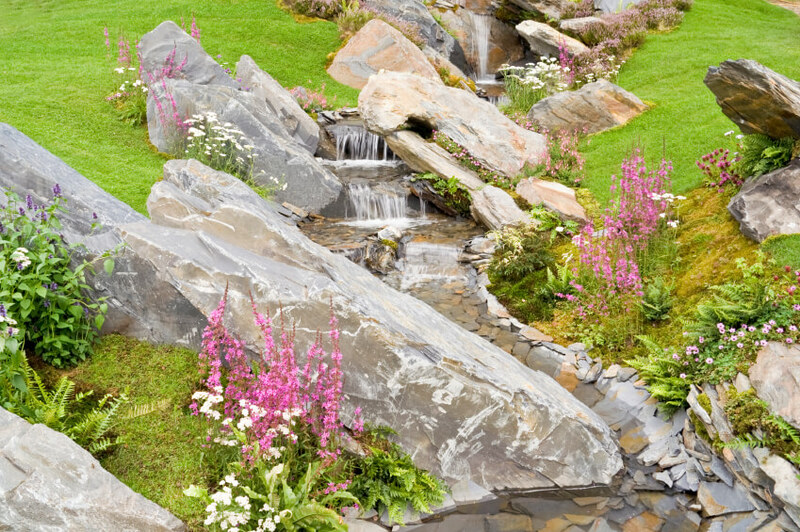 Learn how to utilize rocks and hills and embrace your alpine garden! 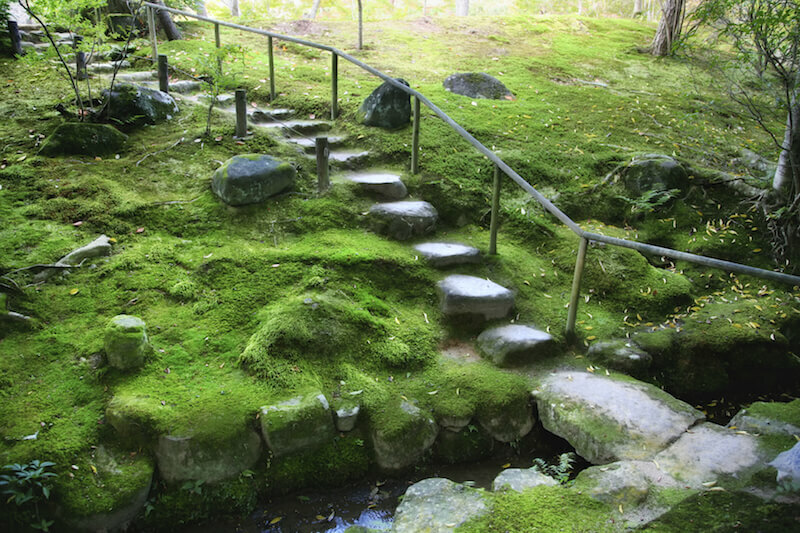 The rocky landscape of this garden is covered in moss with a few small trees. The stone steps and pathways are marked with a railing for stability. 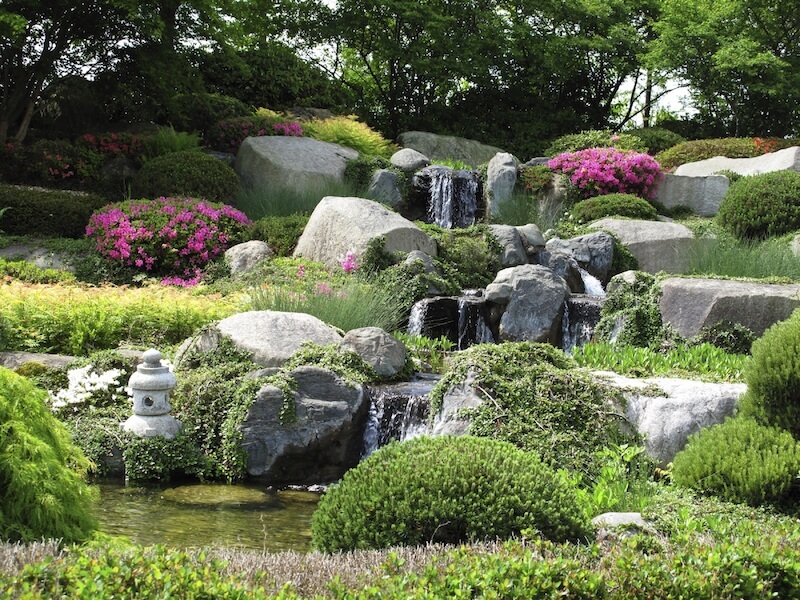 The enormous boulders in this garden are used to facilitate a lovely multi-tiered waterfall. The land between is filled with bushes, water-loving plants, and some flowering shrubs. 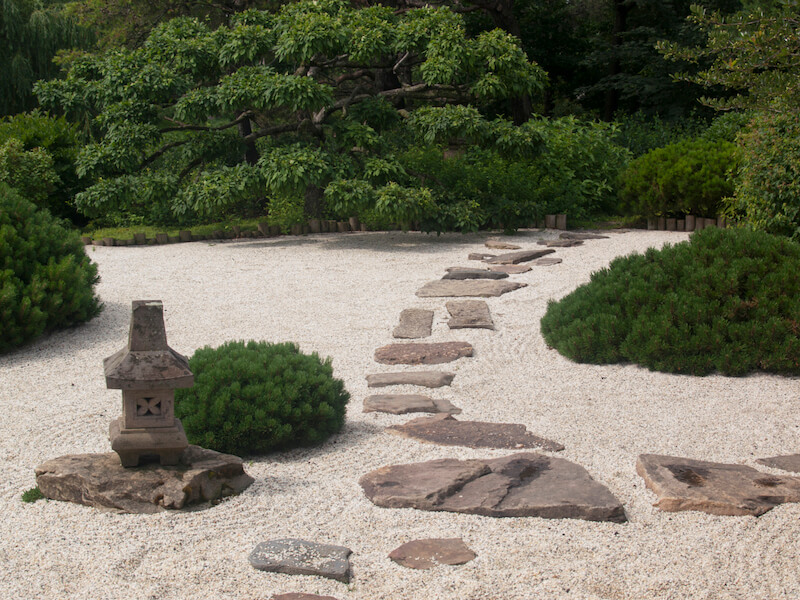 This zen garden focuses namely on sand and stone, but has a few patches of sturdy, thick shrubs. 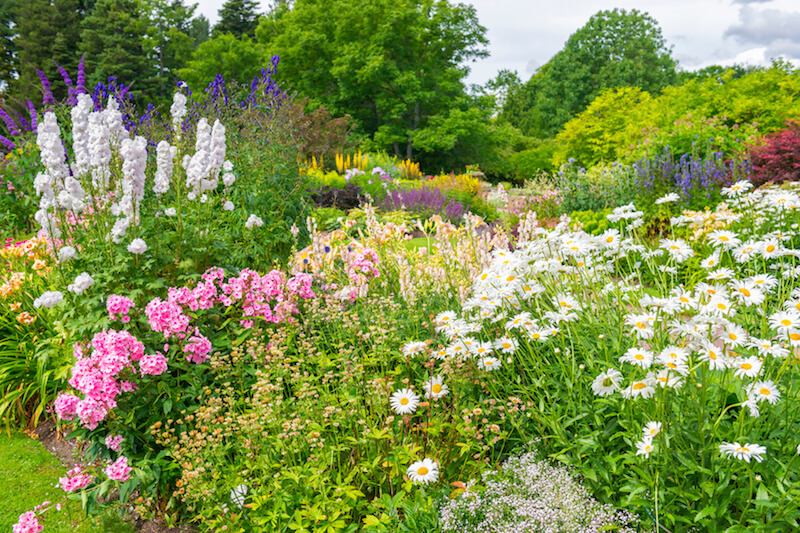 Perennial gardens are filled with plants that live two or more years, meaning that new bulbs or plants won’t need to be planted every year, like in annual or biennial gardens. 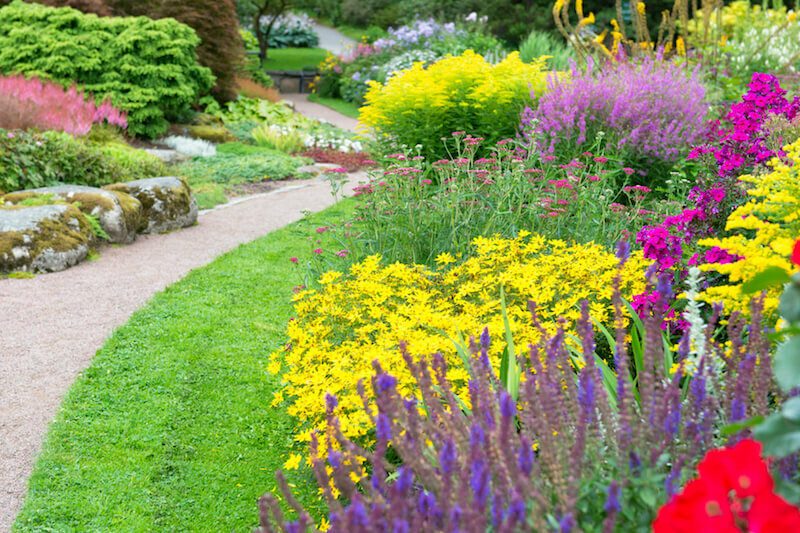 Perennial gardens will flourish year after year. 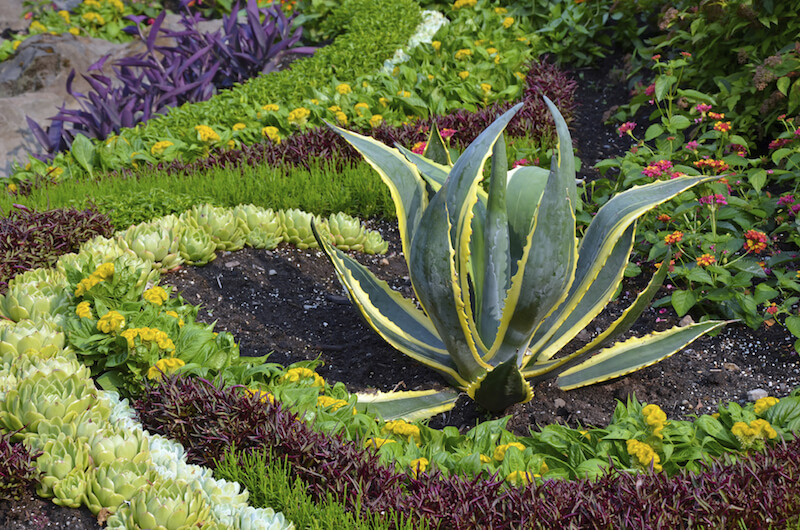 See more colorful perennial garden designs. 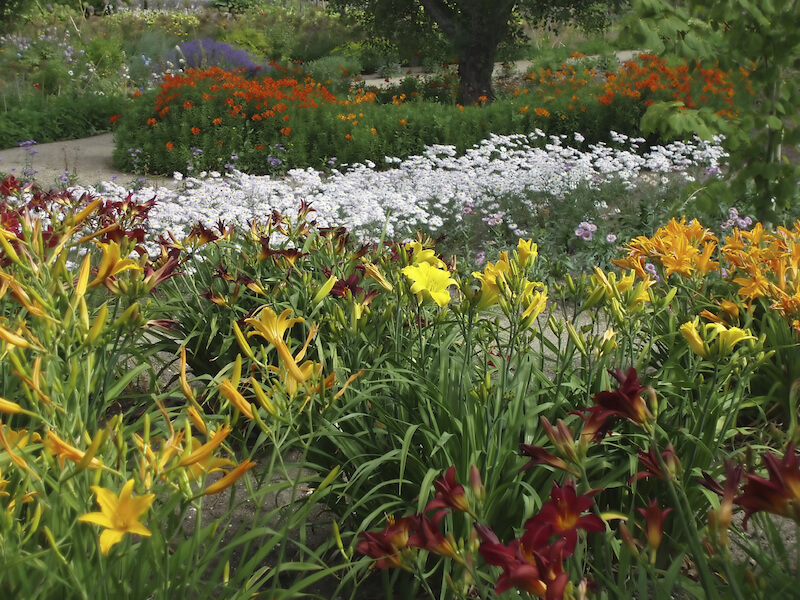 A colorful garden with lovely daylilies, white daisies, and an assortment of other tall flowers. Rows upon rows of daisies and cone-shaped flowers in salmon and red. 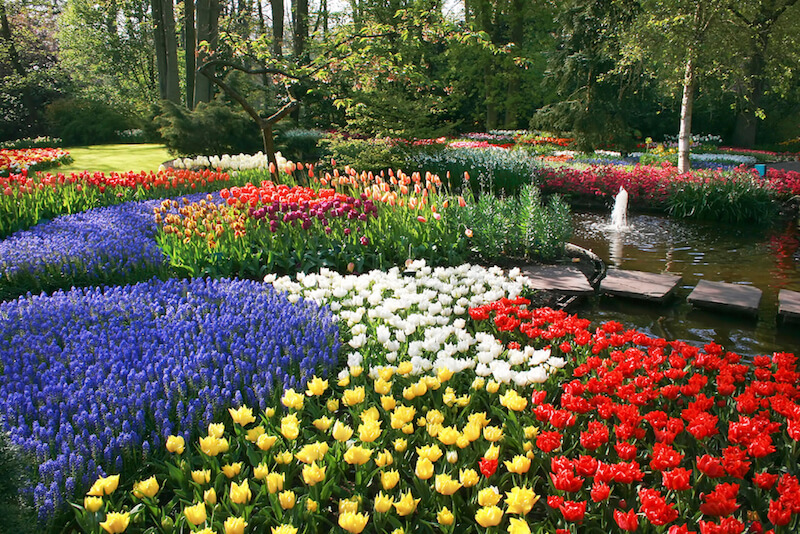 Thick planting beds filled with many different kinds of flowers, and featuring a variety of colors and textures. 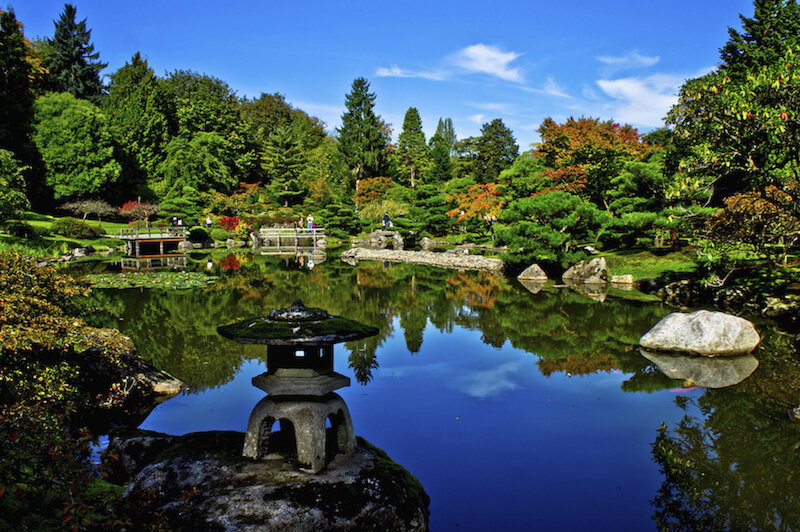 Japanese gardens are known for being meticulously planned out and for having a structure based on scenes. As you walk through a Japanese garden, you are meant to take in each individual scene as a whole before moving onto the next section. They also tend to favor a natural, slightly overgrown look. Some Japanese gardens, particularly Zen gardens, feature stones in the place of water features, but these rocks are meant to represent water. 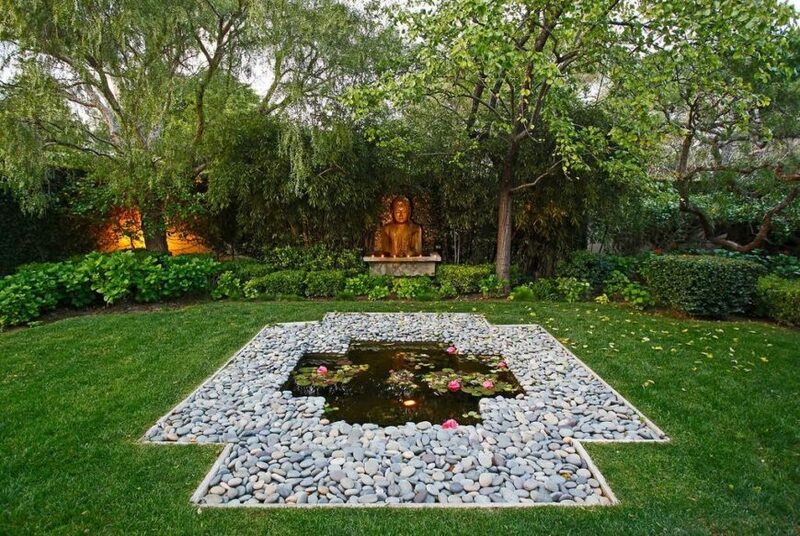 Love the idea of a peaceful meditation garden? Check out more ideas! 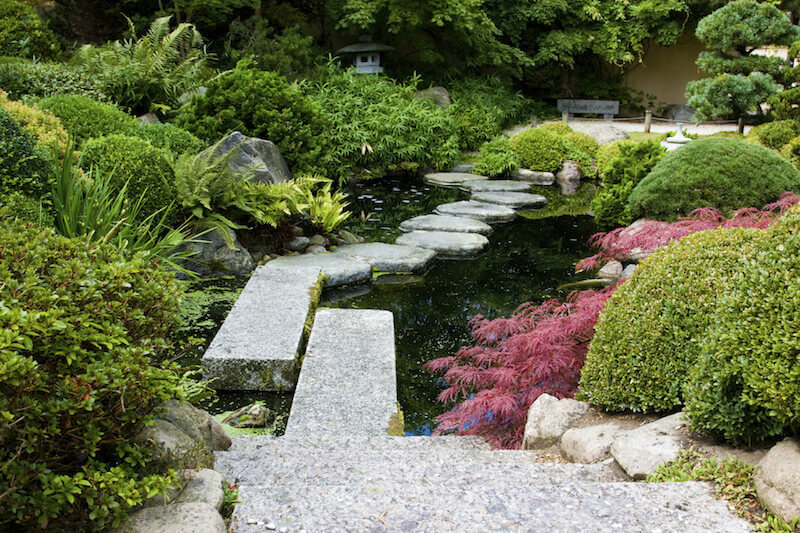 Large, flat stones are placed into the water to form a path across to the next section of this lovely Japanese garden. 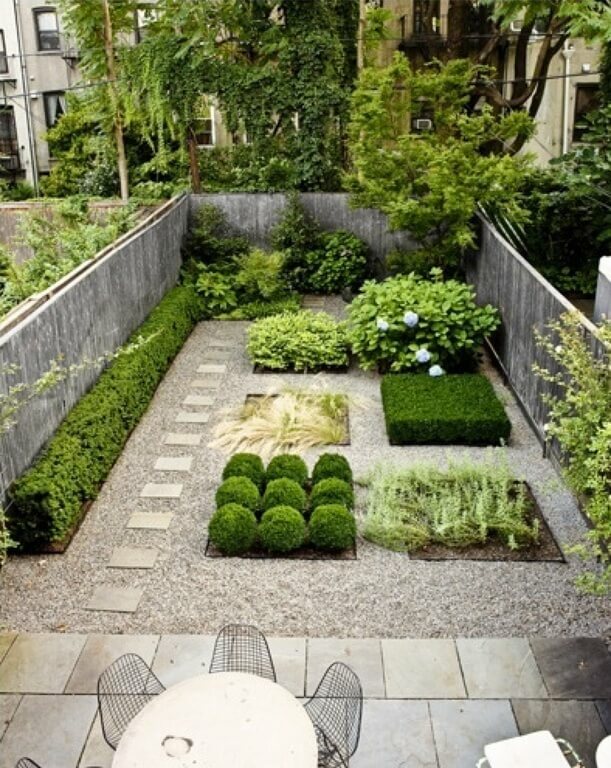 A similar effect is achieved with this garden, although it is meant to look more refined and less natural. This view shows a massive swath of this Japanese garden from across a large pond. Trees densely populate this large example. 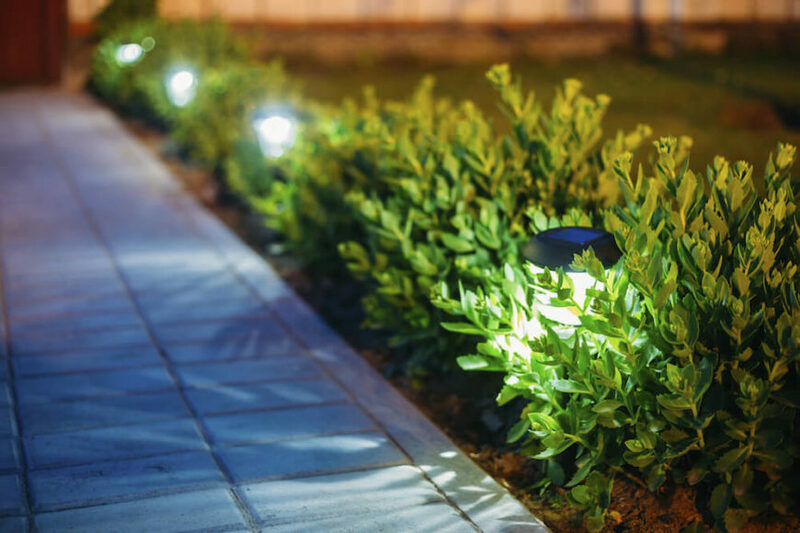 If you plan on spending a lot of time outdoors during the evening hours, you may want to invest in some lighting options to ensure you or your guests aren’t tripping over plants or squashing more delicate plants. Gardens need light. 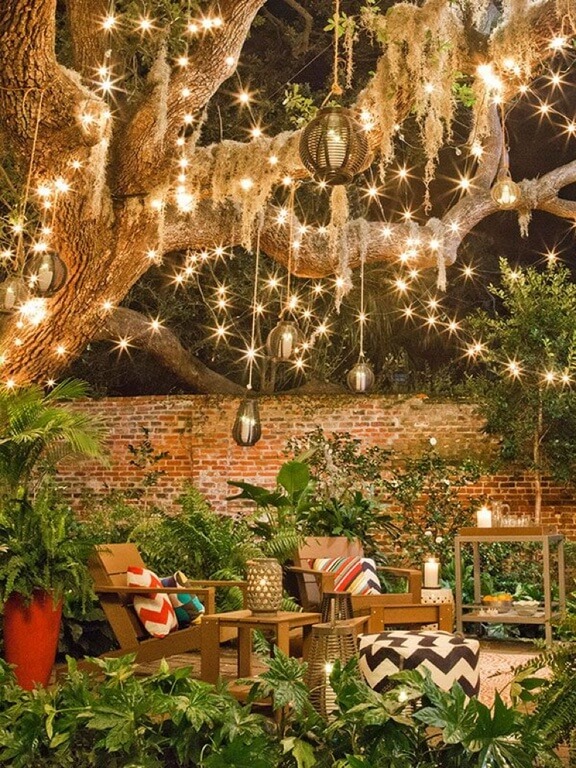 Find more creative ways to incorporate lights into your garden. Small lights hidden in short hedges provide light along a walkway, illuminating the path through the yard. These are typically solar. 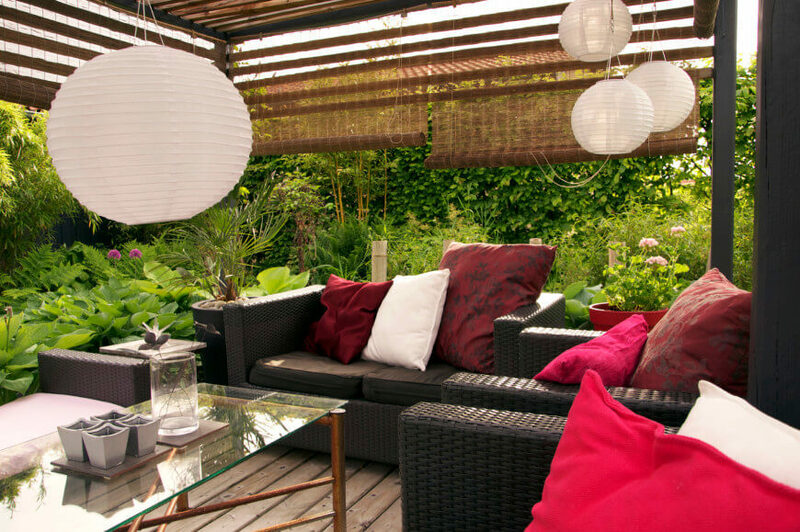 Or, opt for larger lanterns around the yard. These give off much more light than smaller varieties, but are more visible during the day. If you’re looking for something low maintenance that can survive in dry climates, a succulent or cactus garden might be just the thing for you. 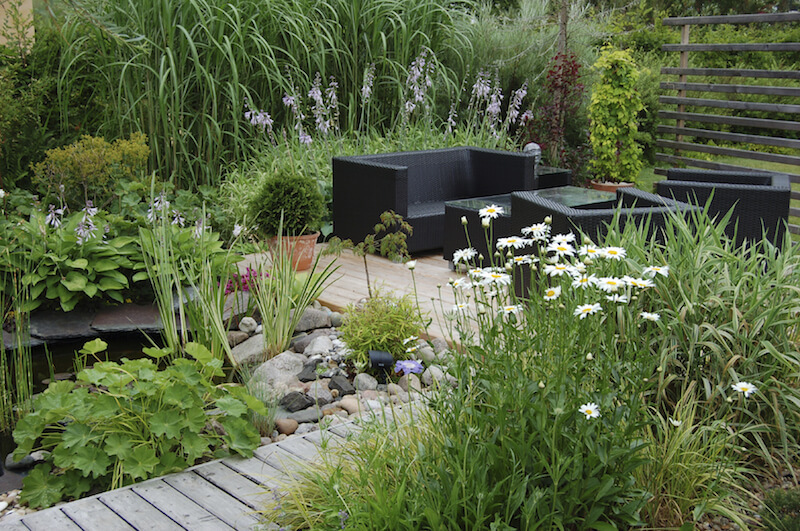 Love low maintenance gardens? 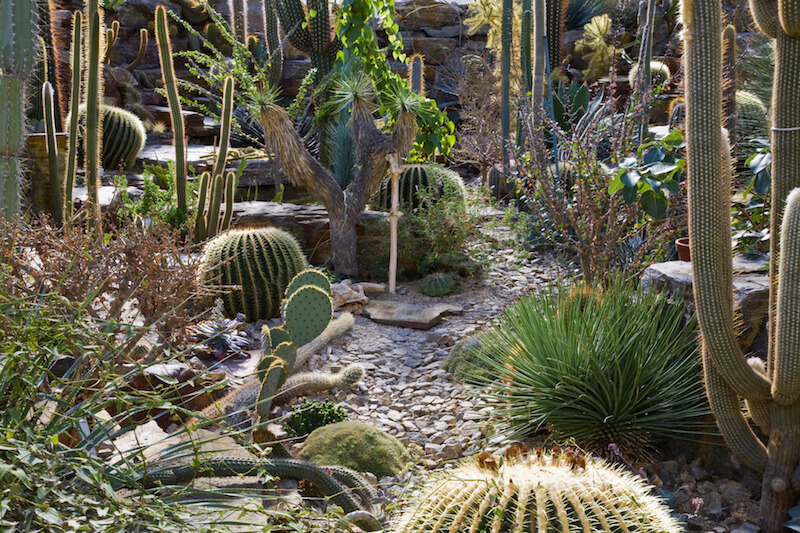 Find out why a cactus garden might be the perfect solution for you. 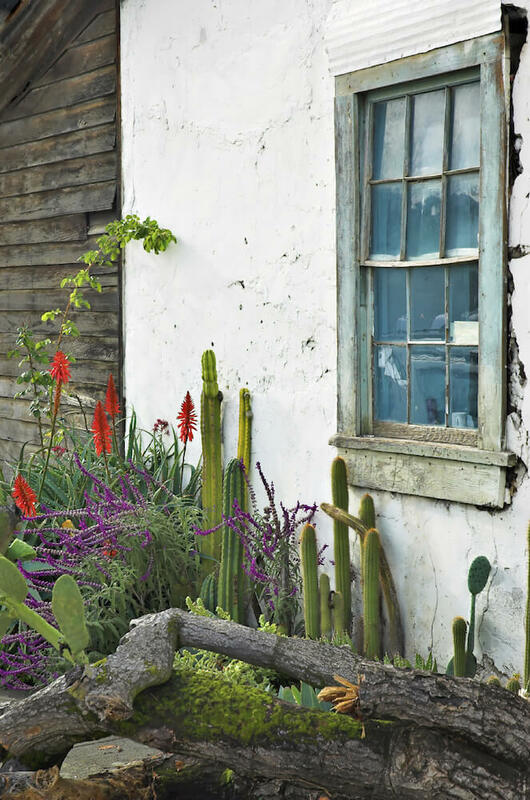 Taller varieties of cacti are matched with flowering varieties and a few moss-covered logs. This southwestern garden has all kinds of different varieties, and is sure to be a low maintenance garden. This is a more manicured and planned garden filled with color and geometry. Topiaries require regular care to ensure they keep their shapes, but are a wonderful way to really make an impression in your garden. 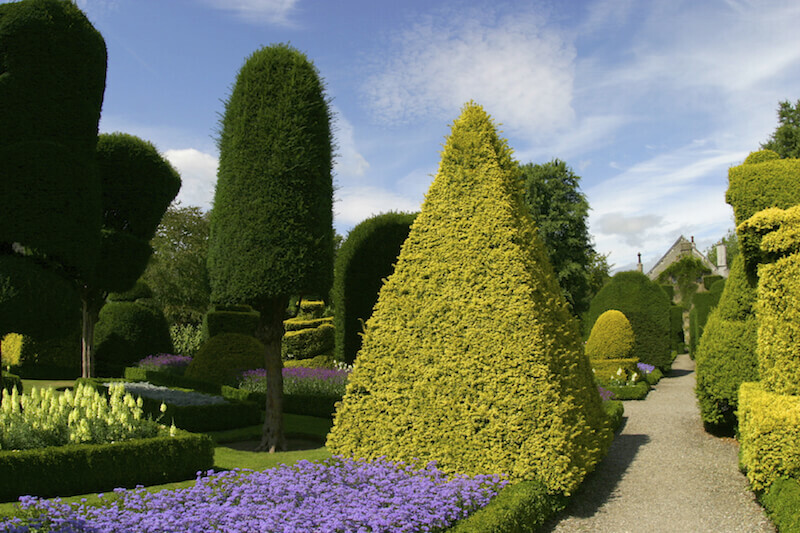 This pyramid shaped topiary stands out amongst the many different shaped topiary in this garden. Even hedges can be transformed into topiary art. 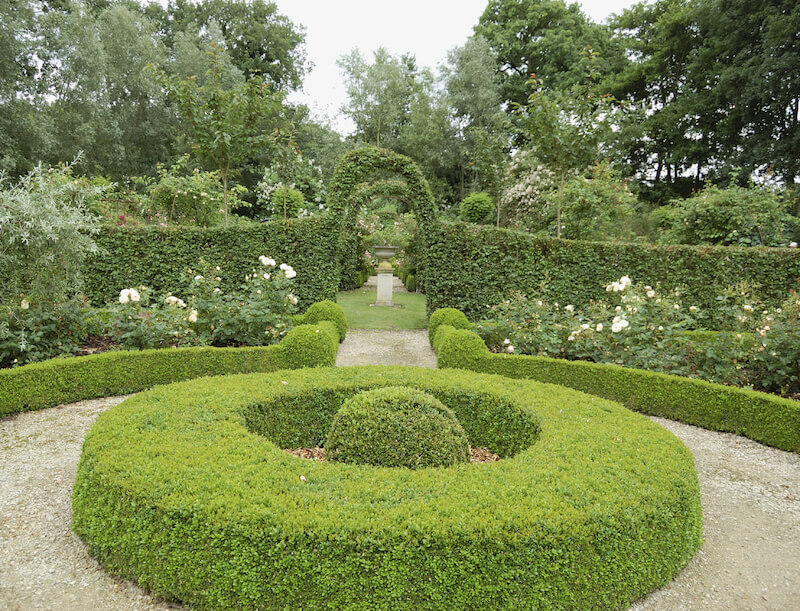 This garden has arches formed out of the hedge walls. 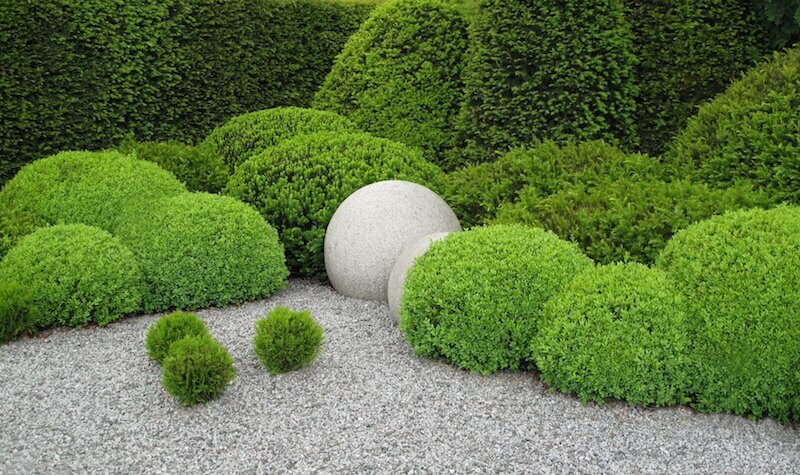 Each of these hedges is shaped into little topiary balls that match the concrete ones in the center. 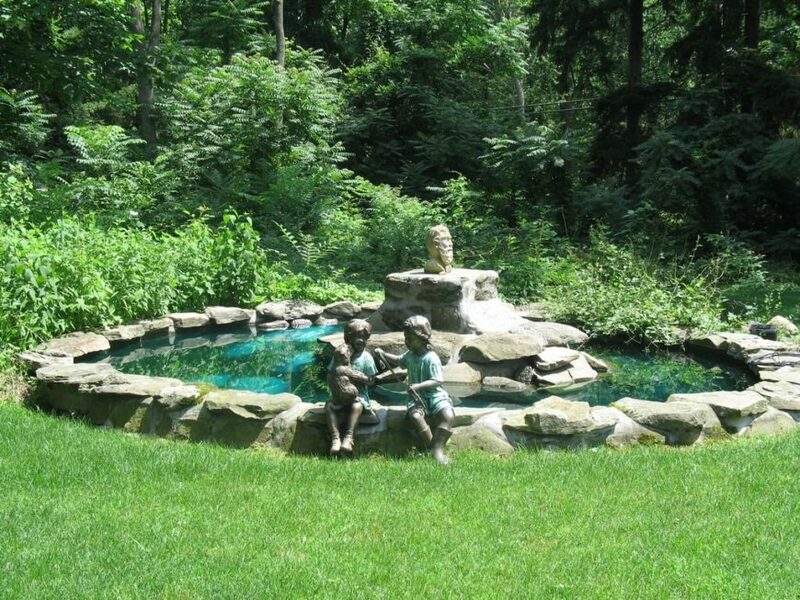 Water features come in all shapes and sizes, and some are more functional than others. 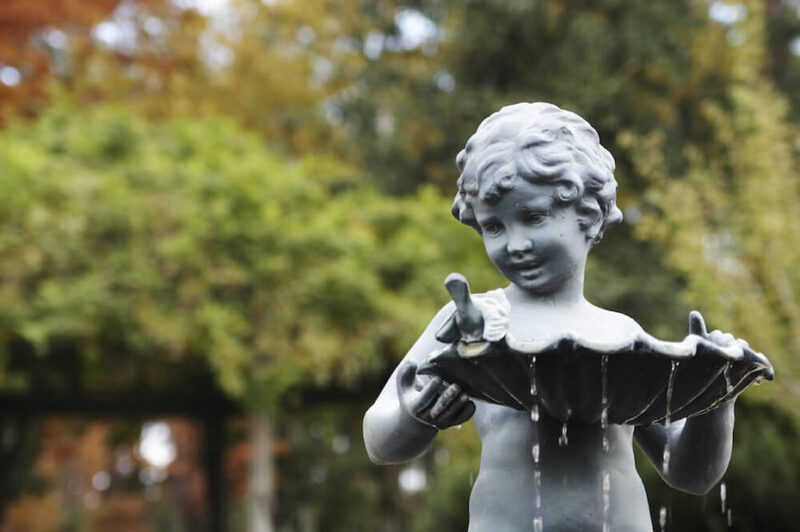 Whether you want to use your water feature for recreation or maybe a little white noise to relax to, we’ve got you covered. 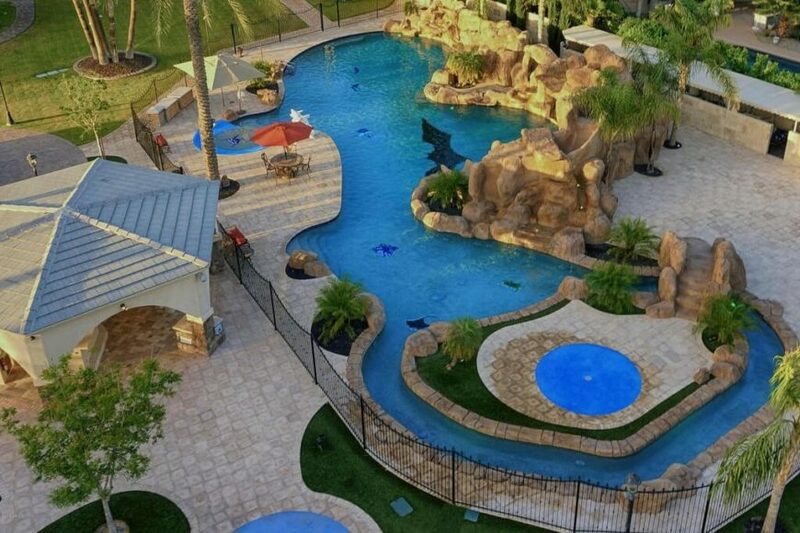 Swimming pools are the largest water feature you can add to your backyard, and definitely the best option if you’re looking for recreational fun. 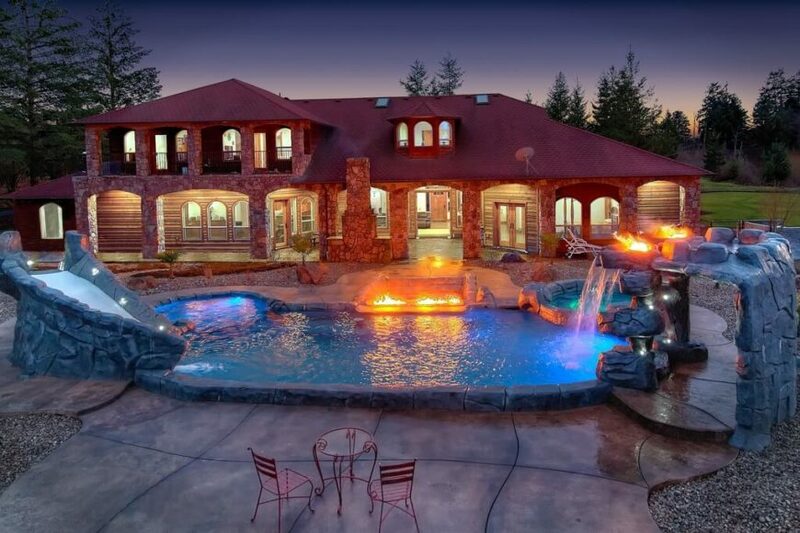 This massive swimming pool is elegantly landscaped and is plenty large enough for a pool party! A more narrow swimming pool flanked by a row of large palm trees. Patio furniture along the side closest to the home rounds out the design. This freeform infinity pool takes up the majority of this home’s backyard, but also includes an attached jacuzzi. Water parks are among the most luxurious backyard recreational pools, and they require three things: a water slide, a waterfall, and a lazy river or cove for relaxing. These are pricey, and the ultimate in luxury. 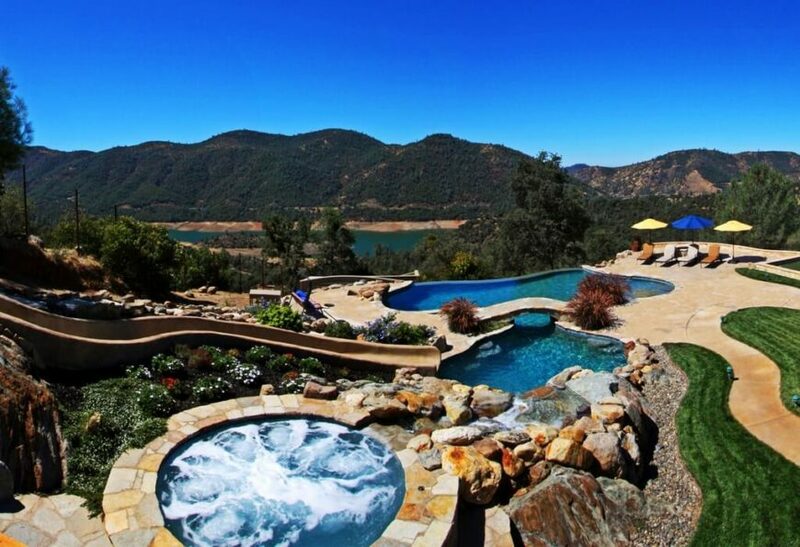 Check out some of the most incredible residential water parks! Ponds are on the opposite side of the spectrum from water parks. They’re meant for decoration, not for play, and typically are used to set a relaxing mood with the soft trickle of a small fountain or waterfall cascading in to them. 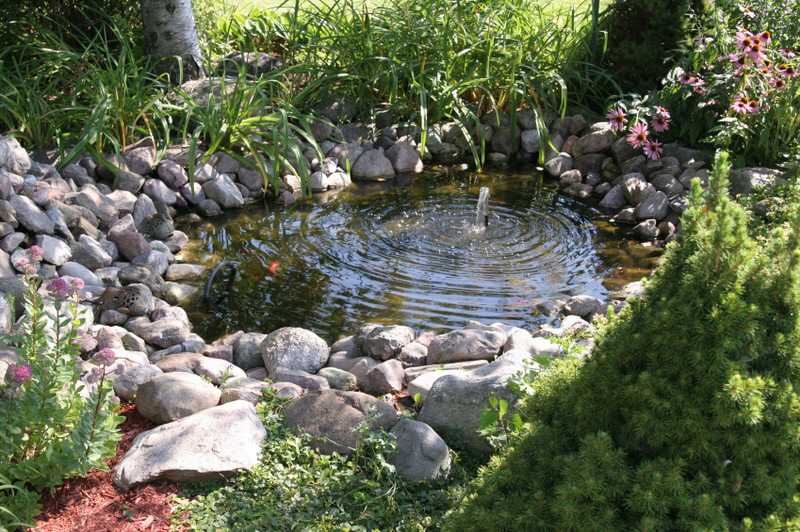 A small fish pond with a bubbler at the center, keeping the pond aerated and suitable for fish life. 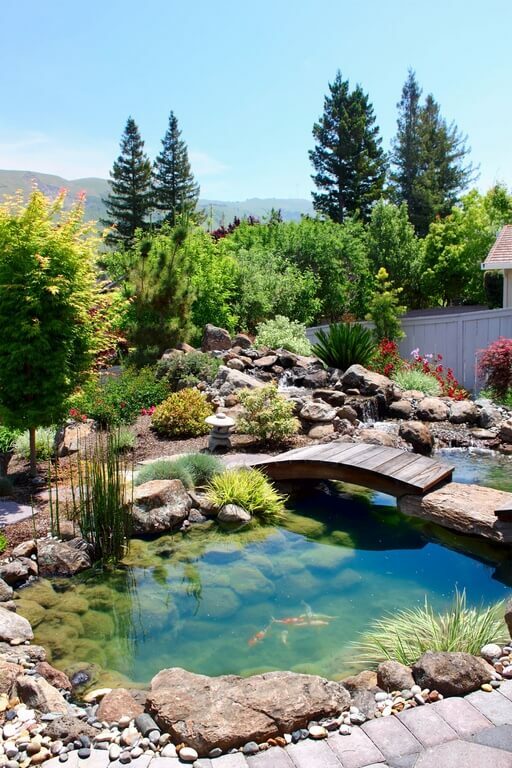 A more expansive pond complete with a waterfall and plenty of water-loving plant life. 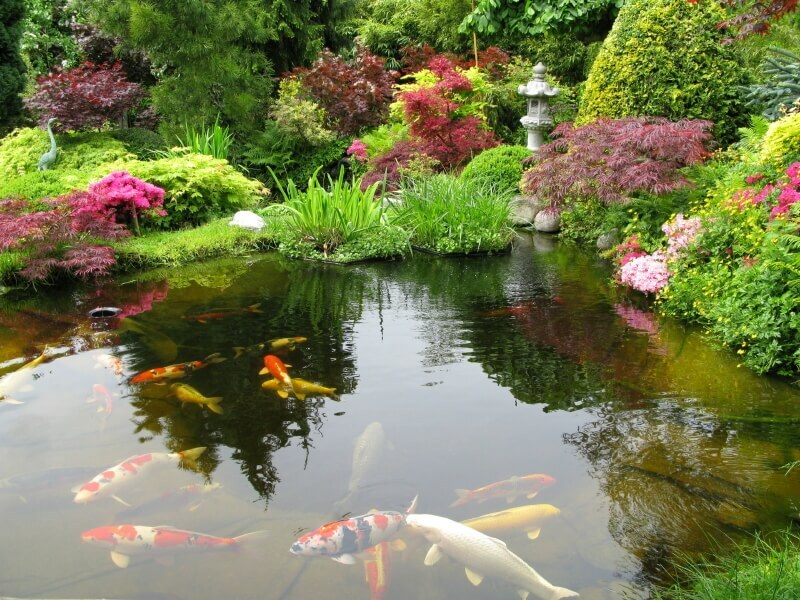 Koi ponds are popular in Japanese gardens. 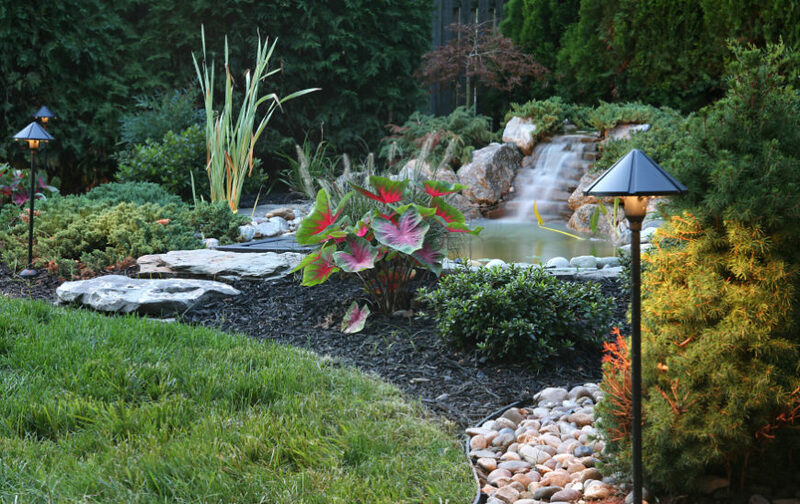 This one features Japanese maples amongst a host of water-loving grasses and a single stone lantern. 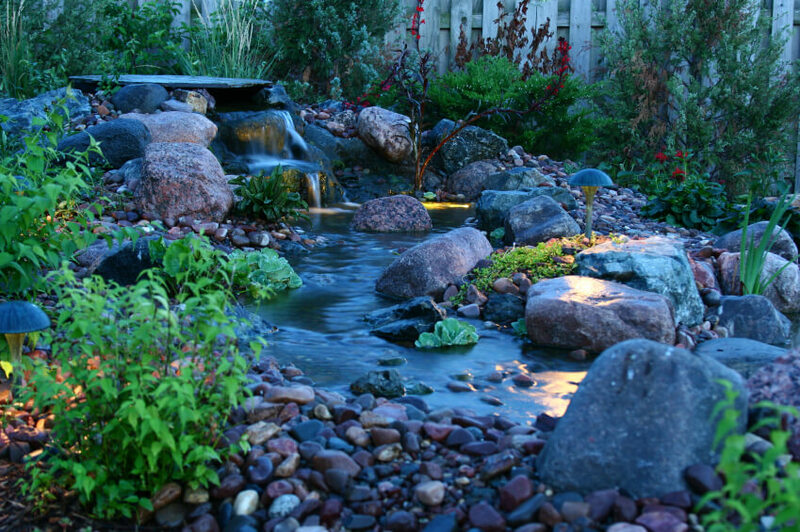 Waterfalls usually go hand-in-hand with backyard ponds, but many also involve natural or man made creeks. 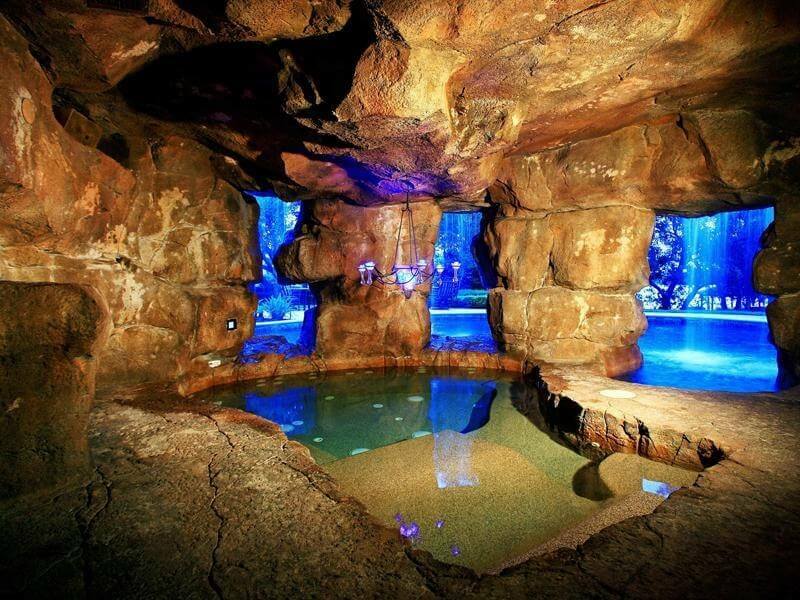 Either way, the gentle rush of water down the rocks is sure to soothe a stressed out mind after a long day at work. Large diagonal stones, boulders, and stone slabs are positioned over this waterfall, giving it a unique, if somewhat eerie look. 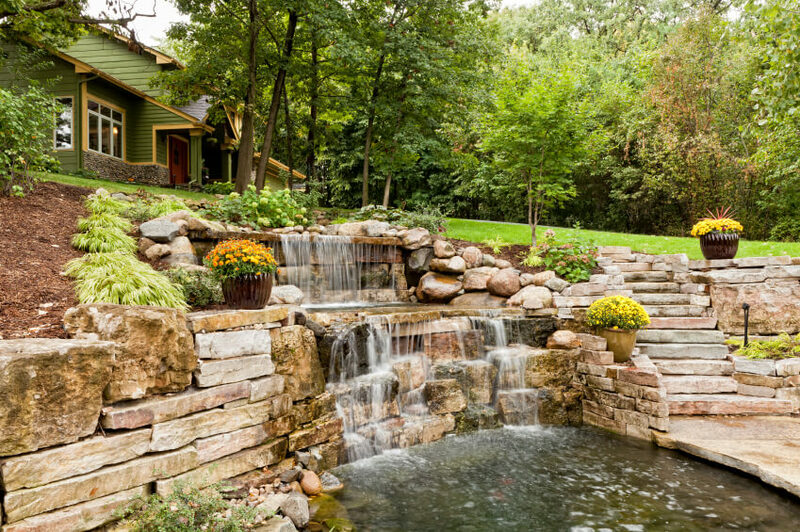 A large stone waterfall flows into a backyard pond with stepping stones leading up to the bank. 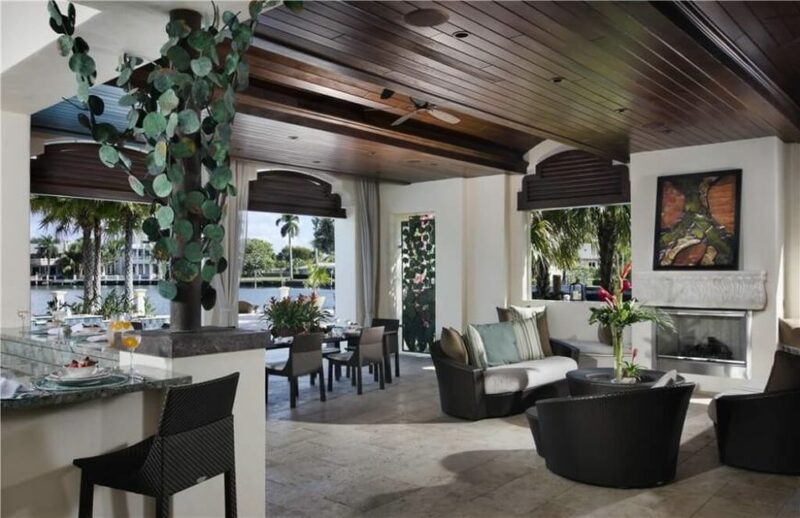 A massive backyard waterfall that leads down from the main yard to a lower patio that is surrounded by water. Flowers, water features, and shrubs are all well and good, but putting them together with accessories that enhance the style of your yard is important too. 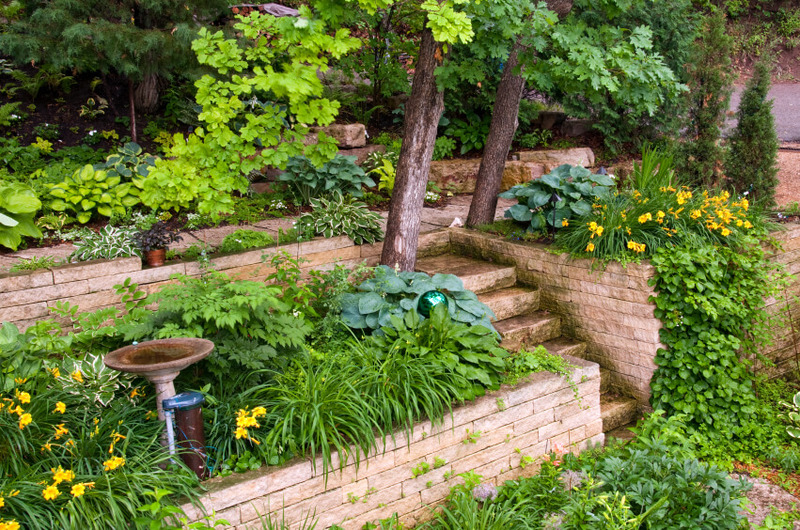 Retaining walls are typically associated with terraced gardens, but are usually used in hilly areas to prevent soil runoff during severe rainstorms. 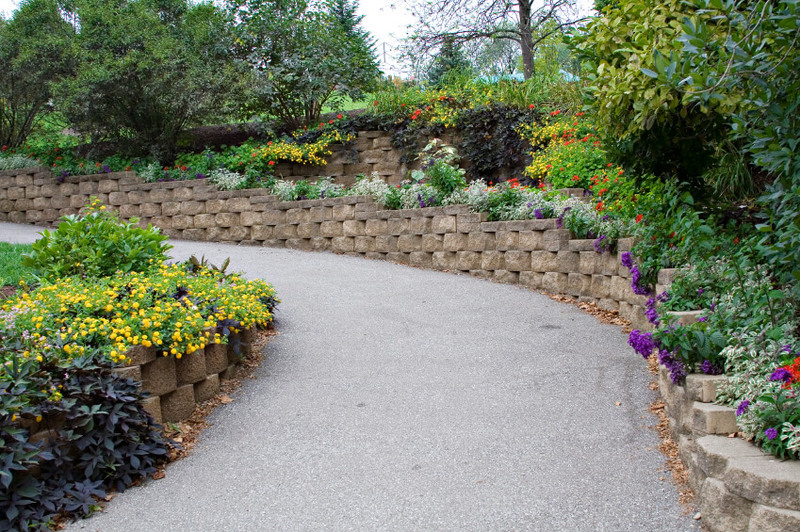 This winding retaining wall is made out of stacked stone bricks and is decorated with flowers and plants all the way up. 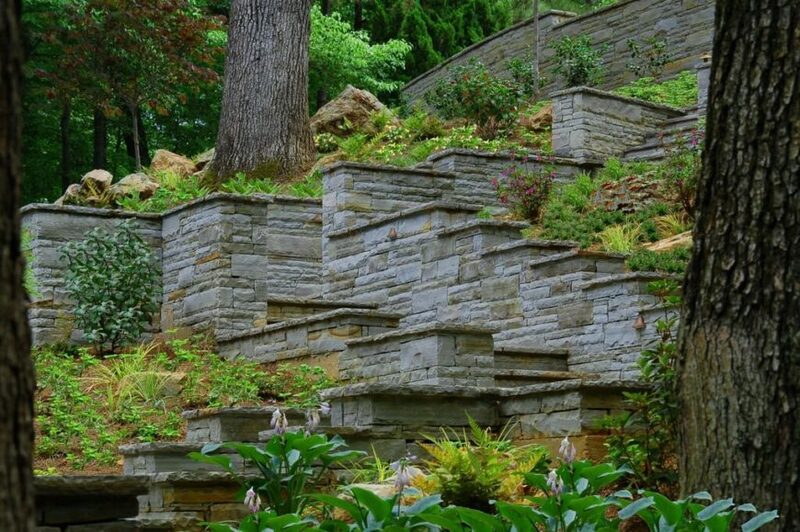 Check out all the different retaining wall materials here. 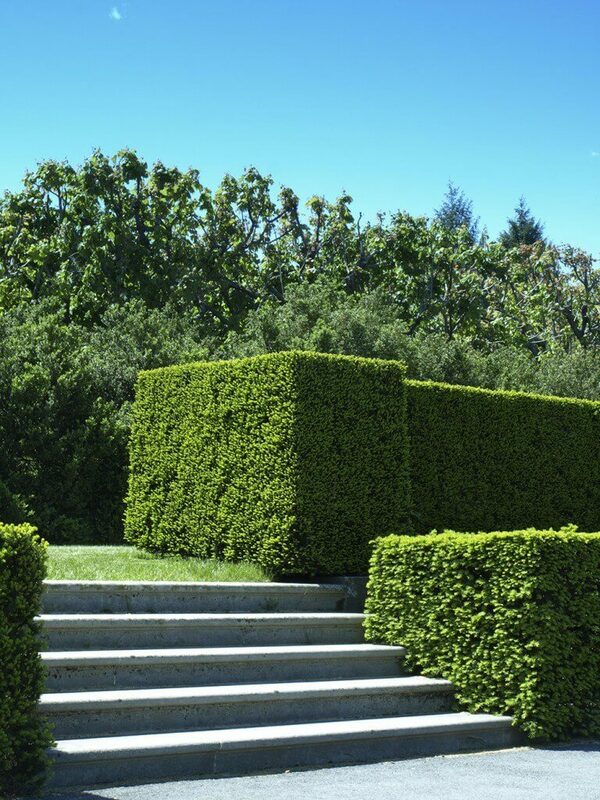 Hedges are a really fantastic and versatile landscaping choice. 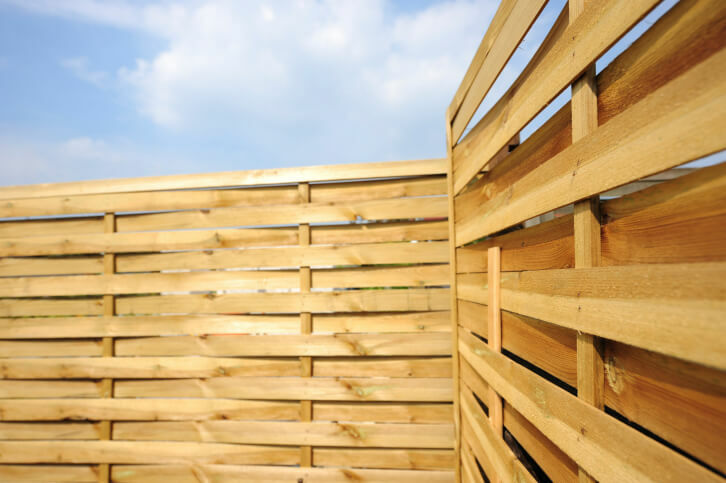 You can grow them high and turn them into a privacy fence or screen, use them to punctuate other landscaping, or even shape them into mazes or topiaries. These meticulously trimmed hedges are perfectly level and follow the stairs down to the sidewalk. 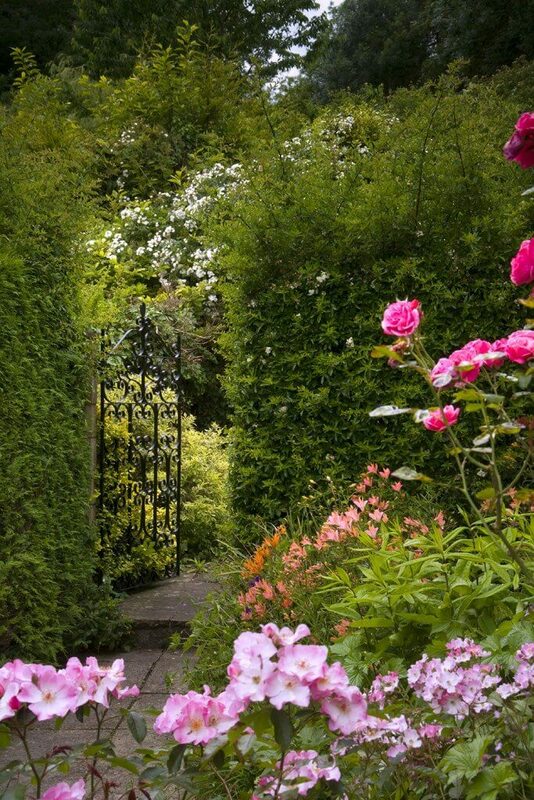 This is a great example of garden hedges used as privacy fences or screens. 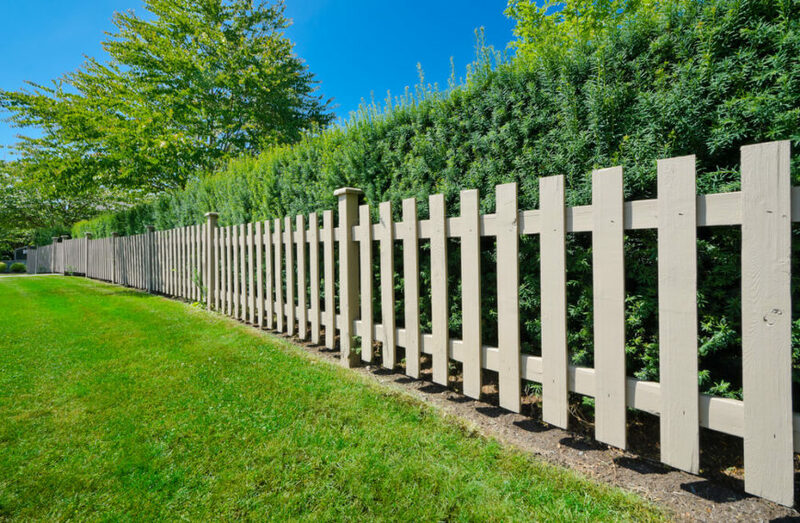 An old wooden picket fence is hidden inside of these enormous hedges. This hedge has a fence hidden inside, which has a lovely wrought iron gate that seems to appear almost out of nowhere. And what is a garden or backyard without a proper walkway to tour by? 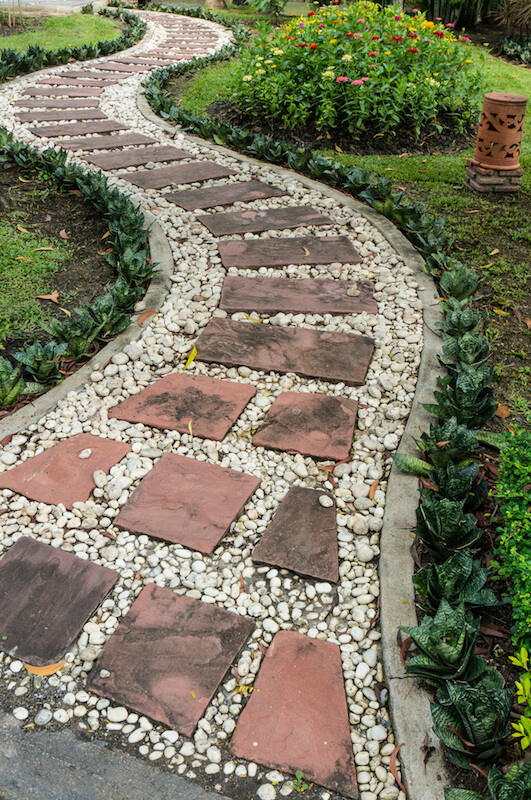 While your smaller garden may not need more than a few flagstone stepping stones, larger gardens may need more extensive walkways or paths. 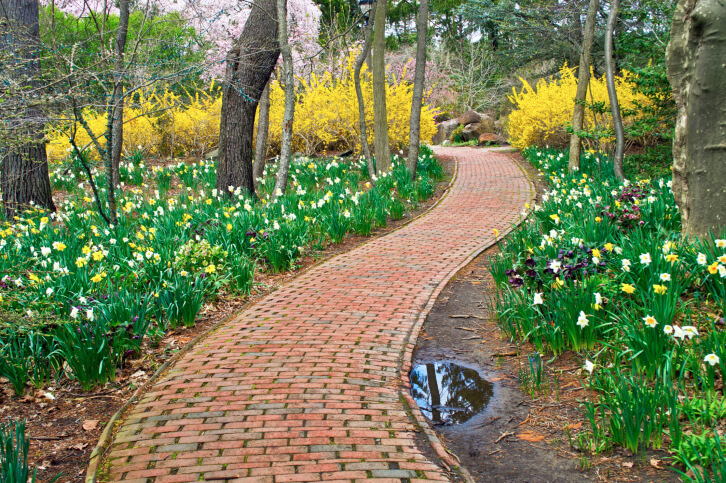 This brick walkway appears to be woven together as it passes by large beds of daffodils and through a wall of bold yellow flowering bushes. 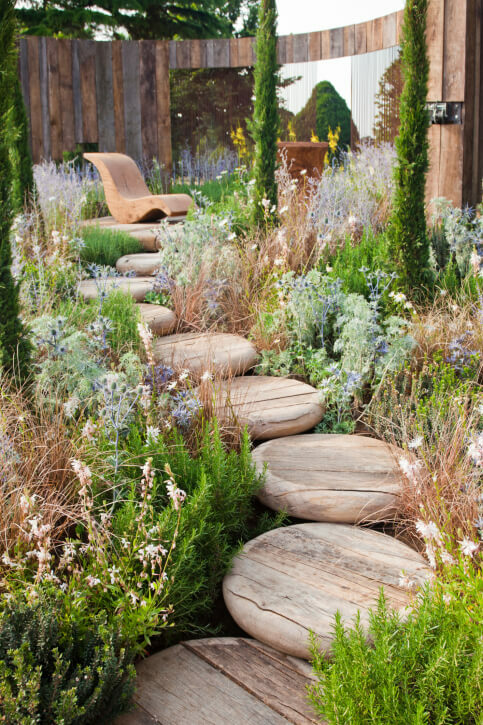 These smooth, rustic stepping stones carve a pathway through dense ground cover landscaping to a patio. 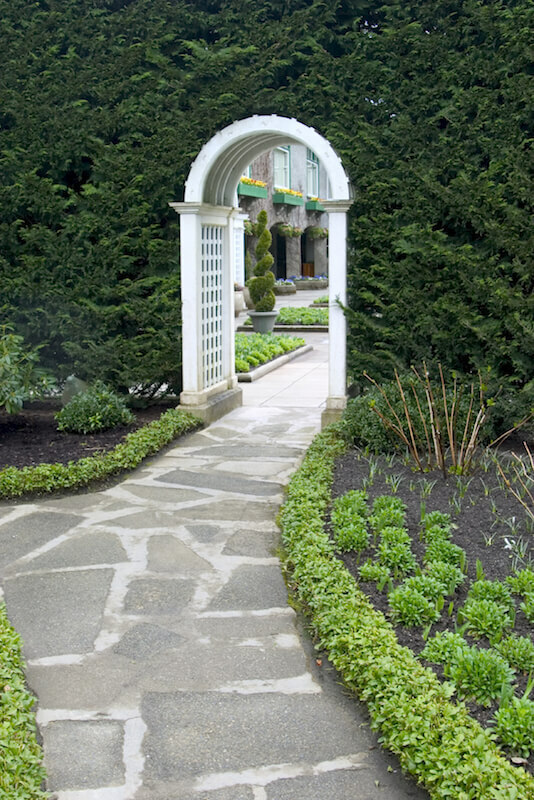 This lovely and subtle stone pathway winds its way through a more forested garden with large, mature trees. 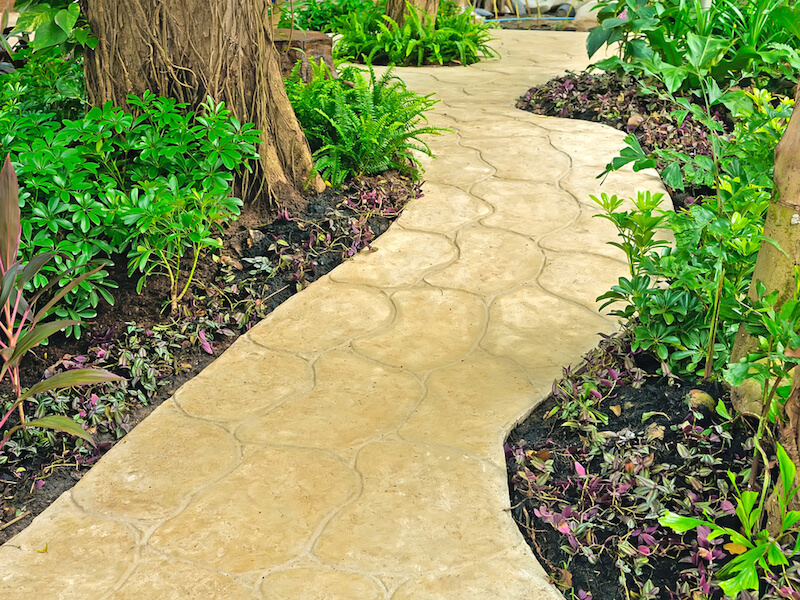 For an easier install, place stones along the pathway, then fill in the gaps with rocks or pebbles of your choice. Maybe gardens aren’t really your thing. Maybe your backyard is meant to be recreational area for the kids to get a little fresh air, or to practice to go out for the basketball or tennis teams. 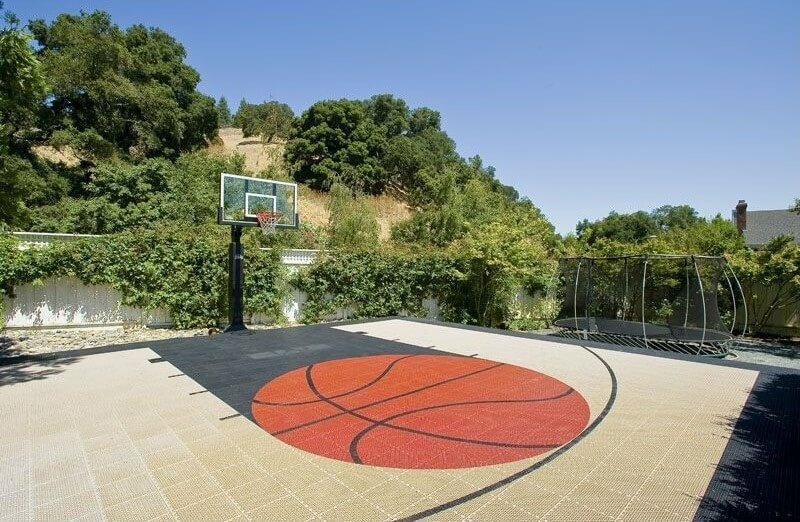 If you have a large enough backyard, a full sized court for your favorite sports might be in order. 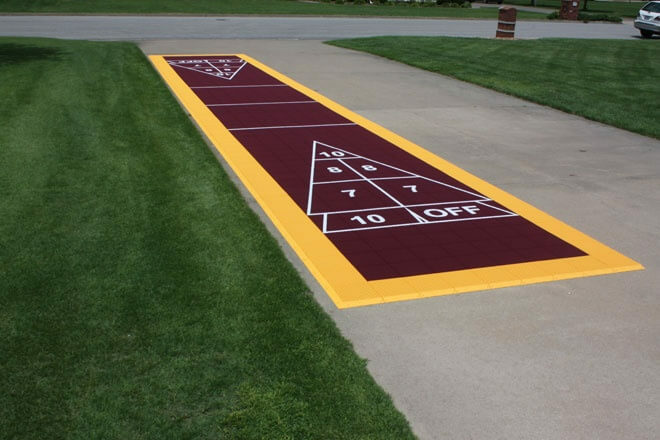 Check out how other homeowners have incorporated sports into their designs. 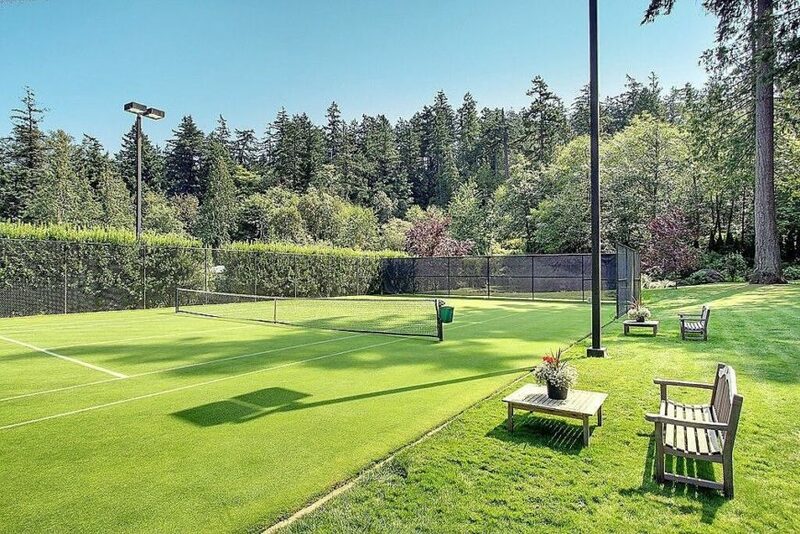 Tennis courts are really only something you can put in your yard if it’s large enough to be regulation sized. But if you can, you get a lot of time in on your favorite sport! Love tennis? 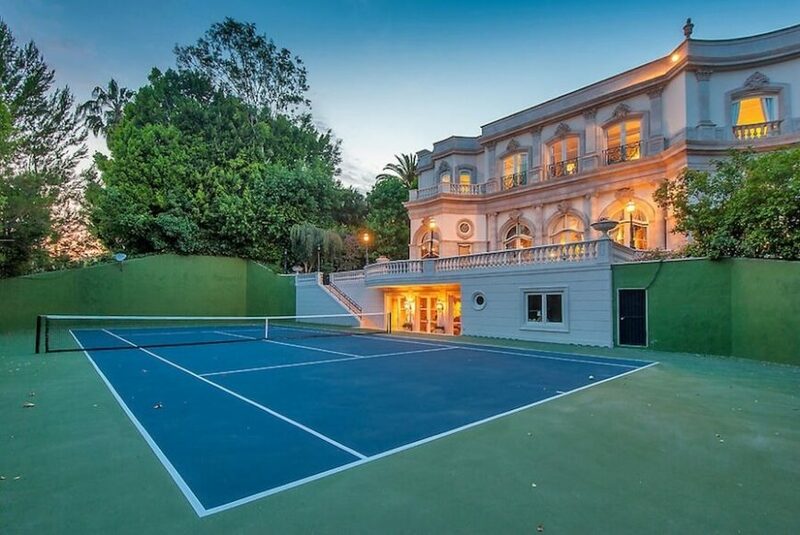 Check out more residential tennis court ideas! 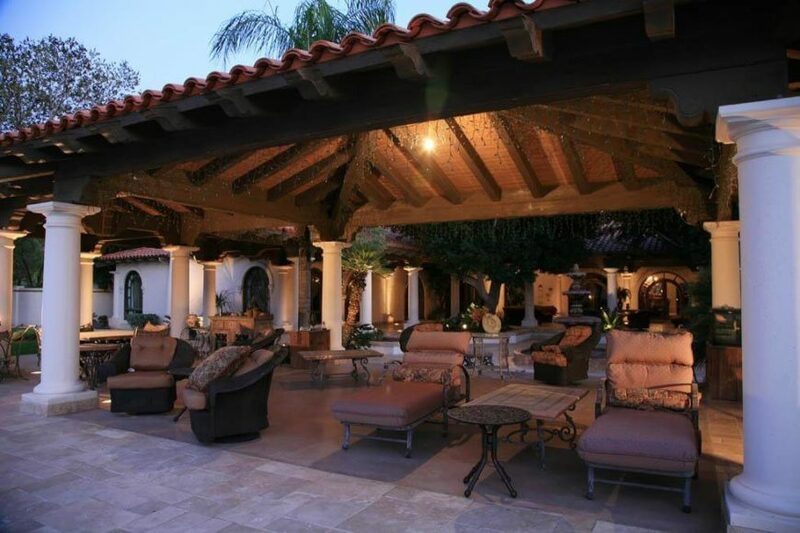 This lovely home has a truly massive backyard, with enough room for a combination basketball/tennis court and a pool! 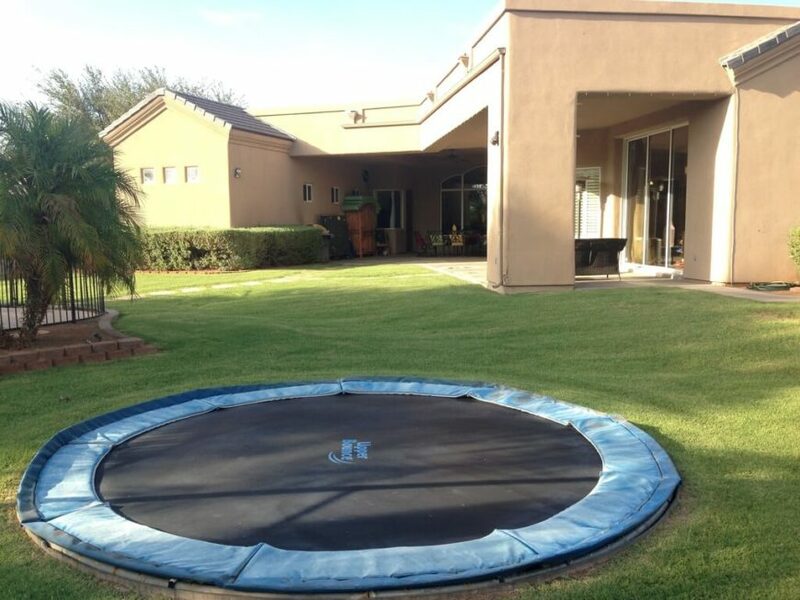 Trampolines are a lot of fun for kids. Check out more trampoline ideas! 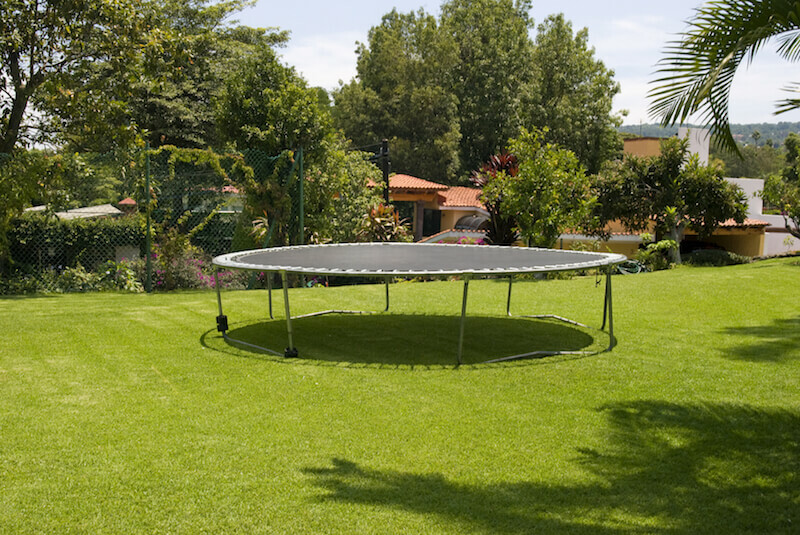 A simple above ground trampoline without netting. Older kids and adults may not need netting, but it’s a great idea for younger kids. 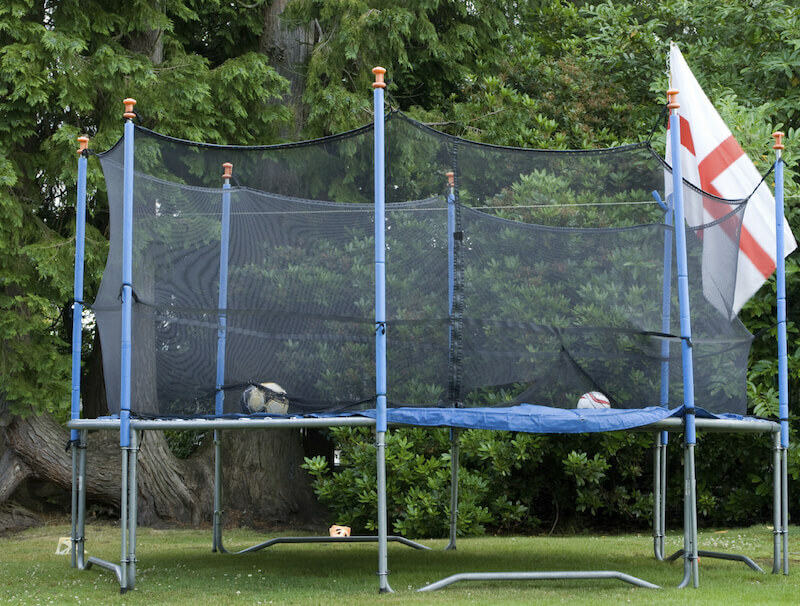 Adding netting is also a great way to turn a trampoline into a soccer arena. 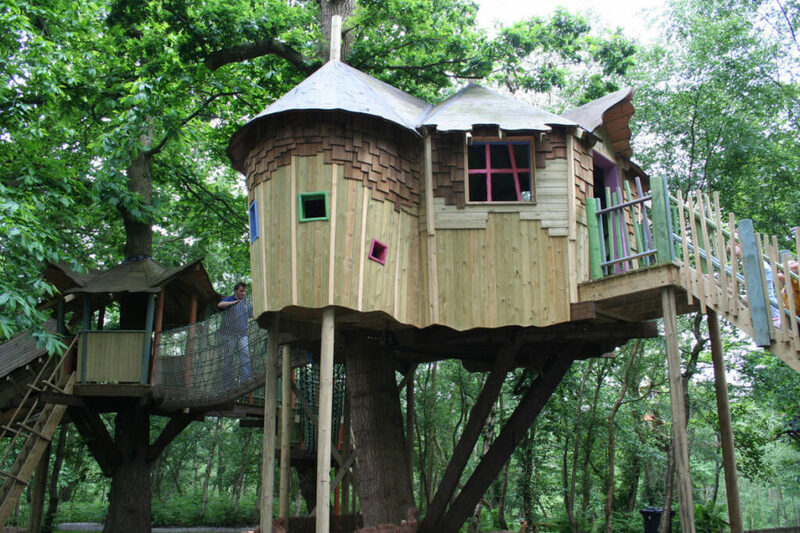 When it comes to getting younger kids outside to play, nothing works better than a little bit of imaginative play. 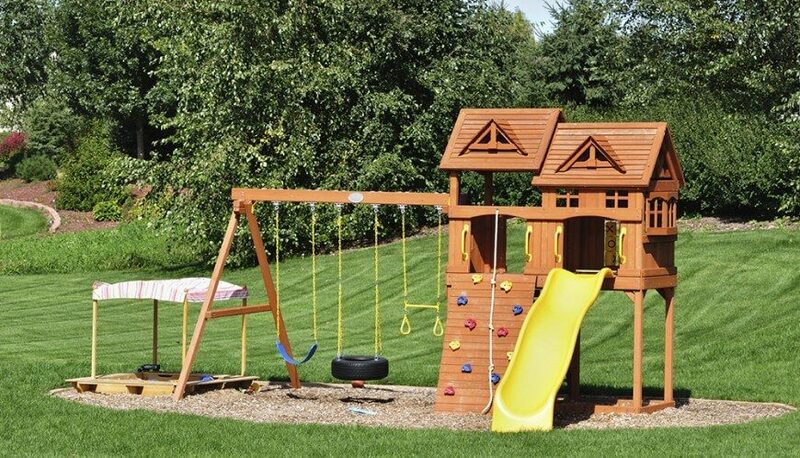 To get their imaginations going, providing a playset that could be anything goes a long way. 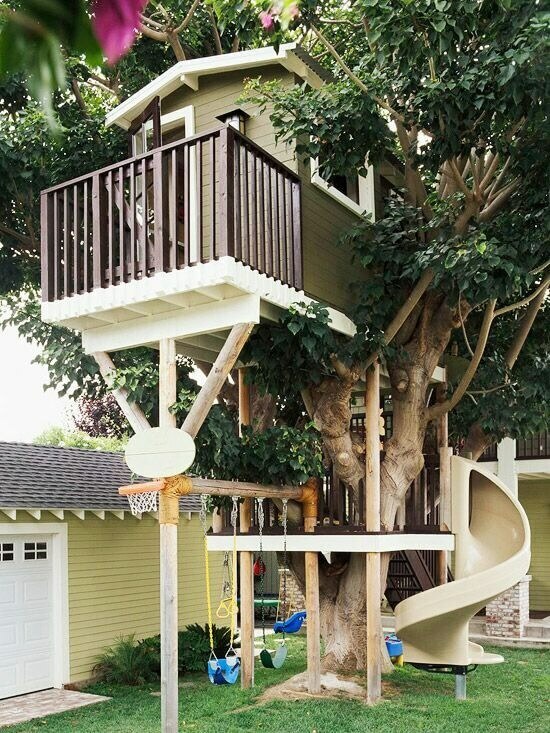 Better still if it has activities like swings, slides, or a sandbox. 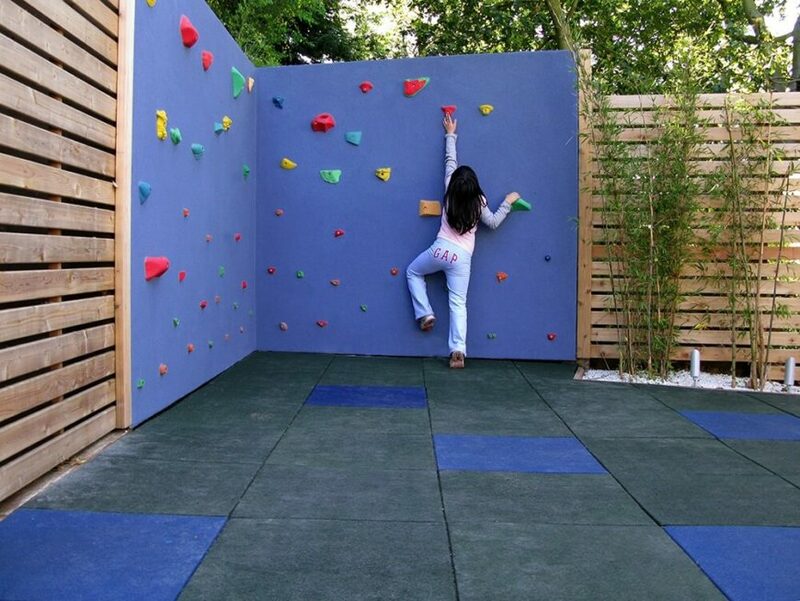 This playground has a little bit of everything, from a rock climbing wall, swings, a tic-tac-toe board, and even a sandbox. While this isn’t necessarily just for kids, having a designated spot to do yoga can aid in relaxation and overall wellness. 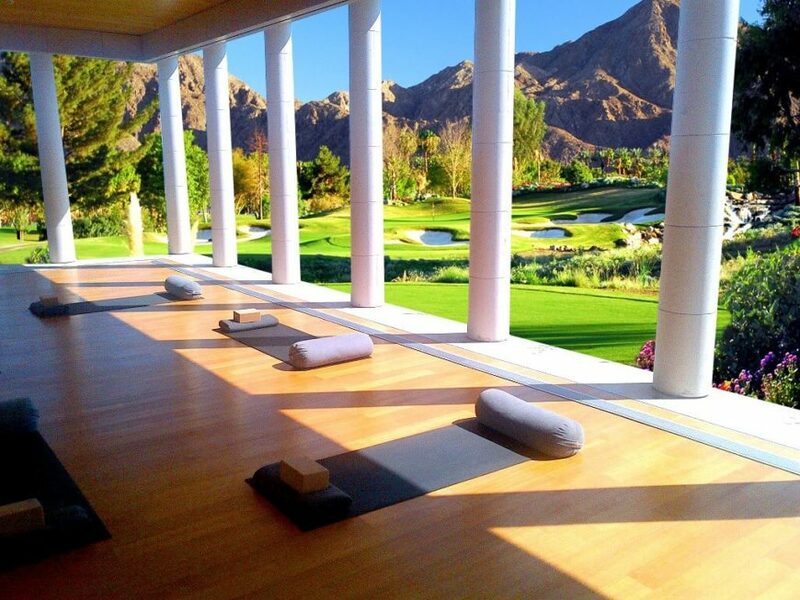 This custom yoga studio features plenty of doors that can be opened to let in a nice breeze. See more of this home here. Designed by Blue Forest. 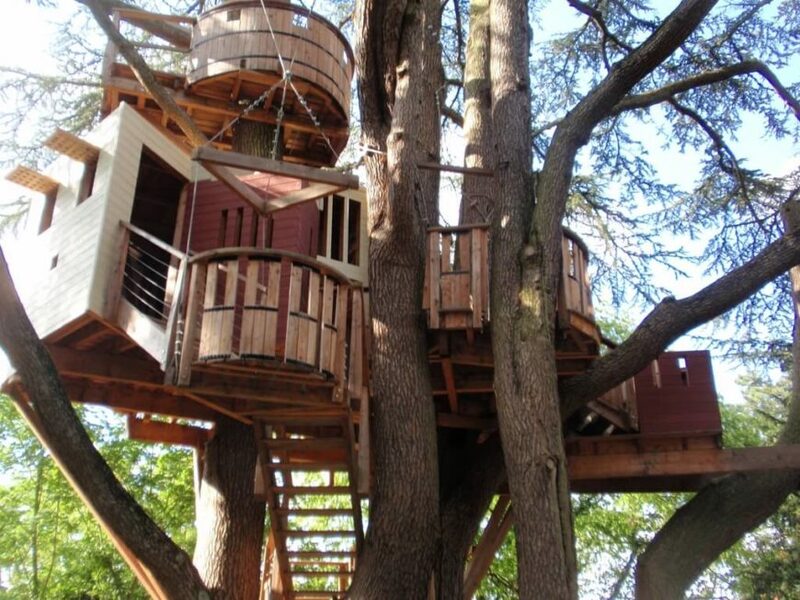 There’s nothing we wanted more as kids than a tree house, and these are the best of the best. They have everything your kids will need to really get imaginative. 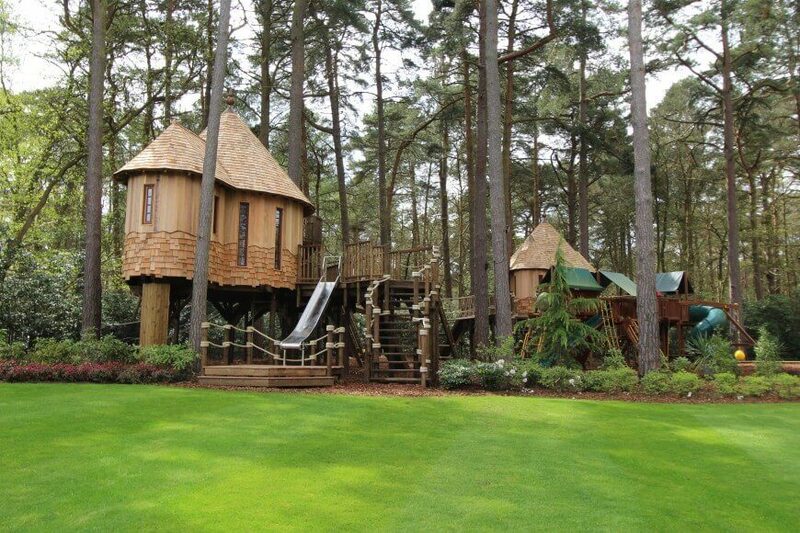 This incredible treehouse is two separate treehouses connected to a massive playset. See more of this home here. Designed by Blue Forest. Adding a bit of color and rope bridges to a treehouse really allows the kids to branch out and find new ways to play. Go for mini-golf! 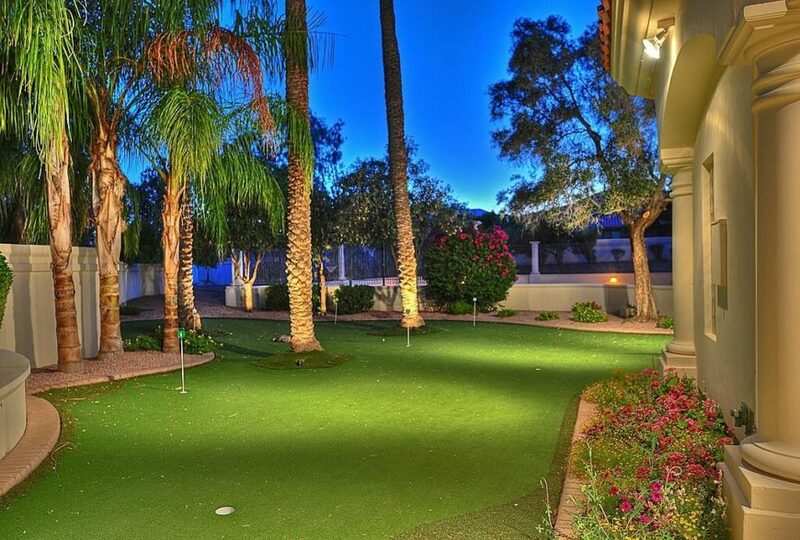 If you or your kids are avid golfers, your own personal putting green might be the perfect way to laze away an afternoon. 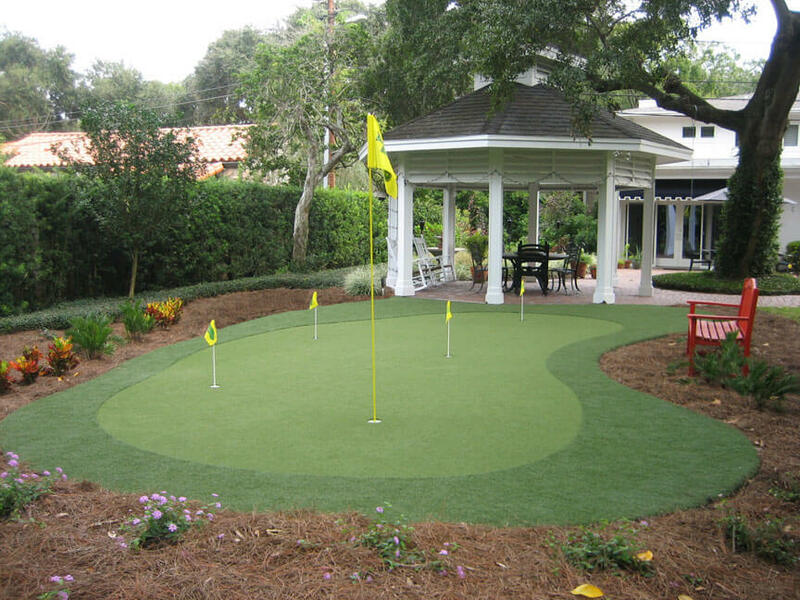 This small putting green is near the gazebo and a brick walkway. 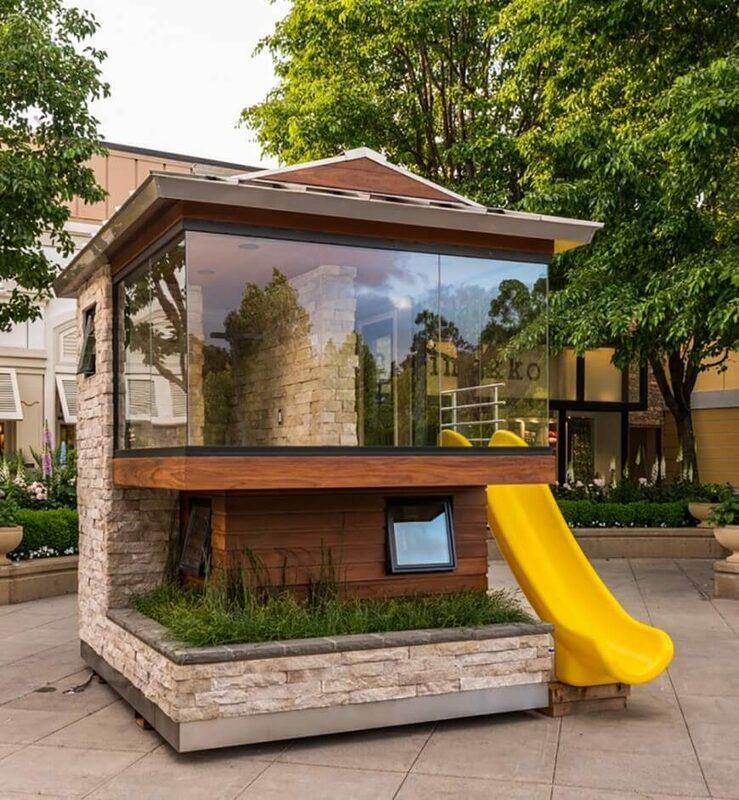 Playhouses are traditionally considered to be great for little girls, but any playhouse can be used for imaginative play for both boys and girls. 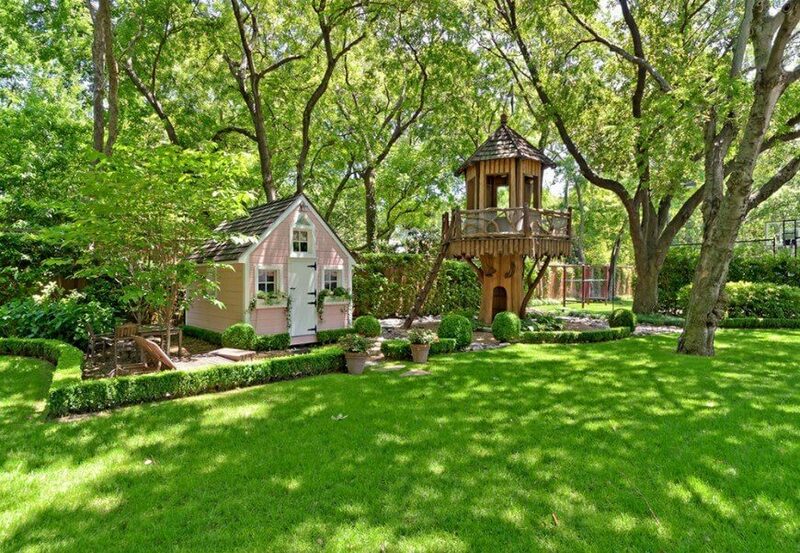 Want your kids to have a fairytale playhouse? Check out more ideas! 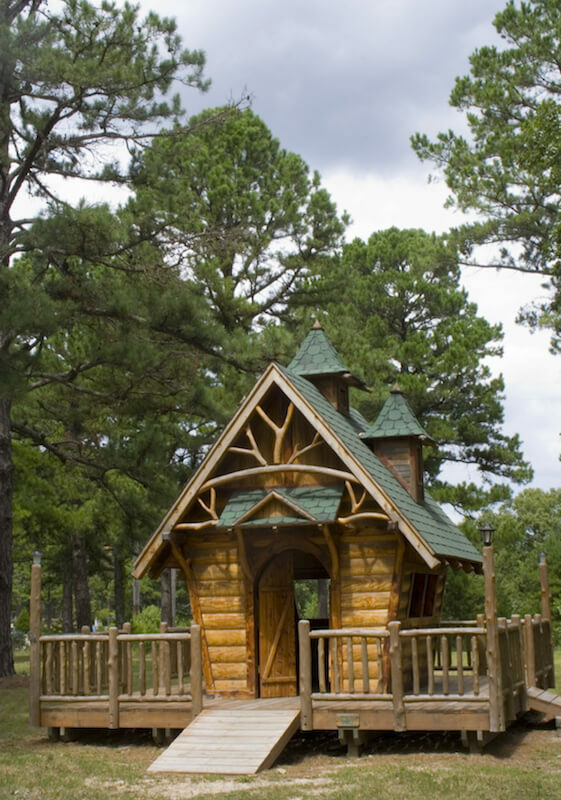 This play house is designed to look like a luxury log cabin, and has great details including decorative branches. 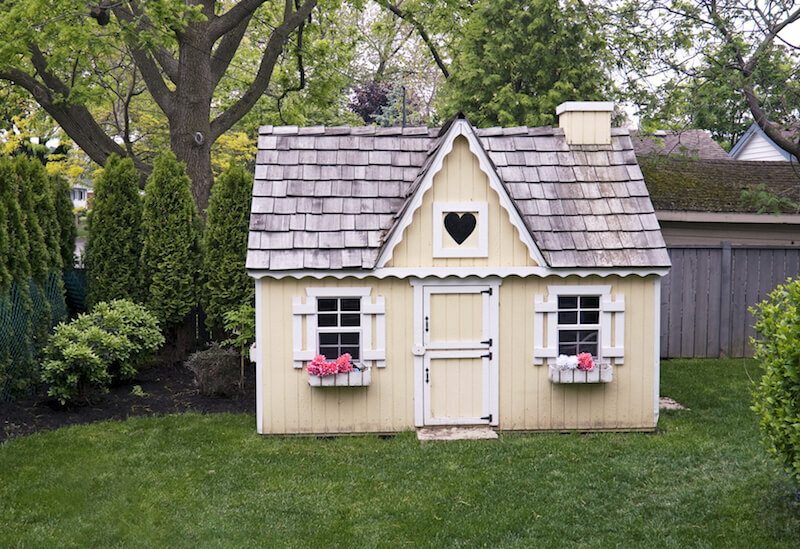 A more traditional cottage style play house that’s perfect for imaginative play. Everybody loves a good swing! Whether it’s a full swing set, a tire swing, or even a rope swing, they can keep your kids occupied for hours–and get them moving! Swing sets are a bundle of fun. Find more great swing set ideas! 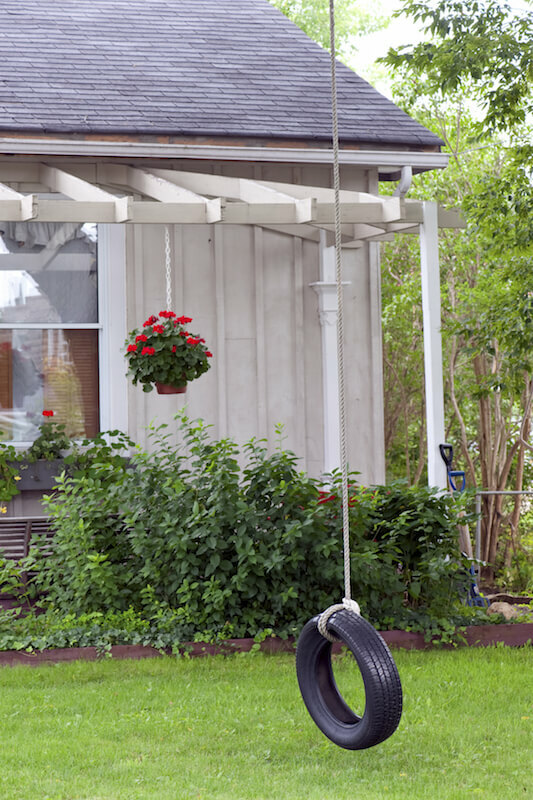 A simple tire swing is budget friendly and still loads of fun. 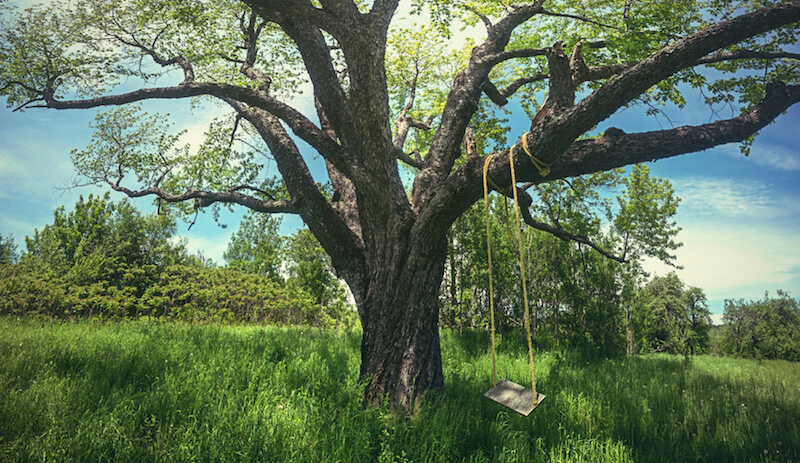 Rope swings, hung from a sturdy branch of a mature tree, are a classic way to swing while enjoying the summer breeze. If your child is interested in astronomy, you can set up a stargazing station for them. Find more great ways to get your kids outside and interested in astronomy! 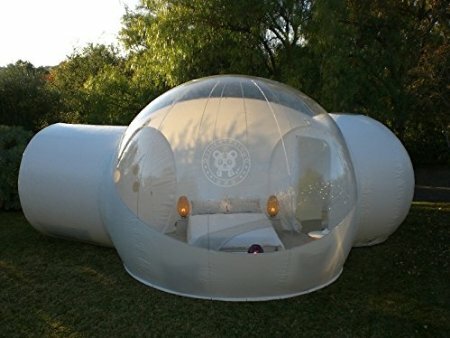 This bubble tent is a great way to start stargazing without being bothered by bugs. The clear top means you can lay down and still spot constellations. Learn more here. Don’t forget your telescope! 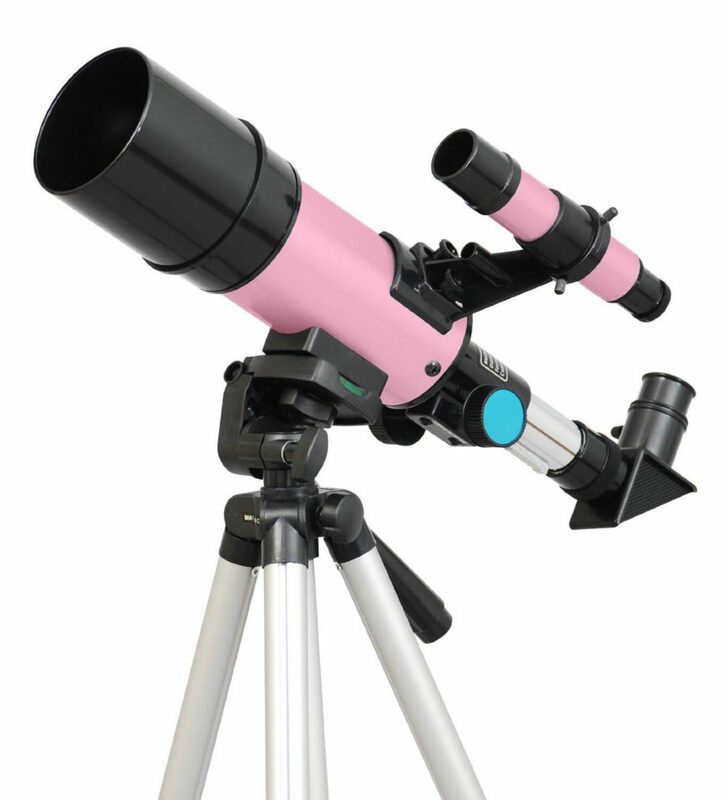 A proper telescope is something every young astronomer needs! Learn more here. 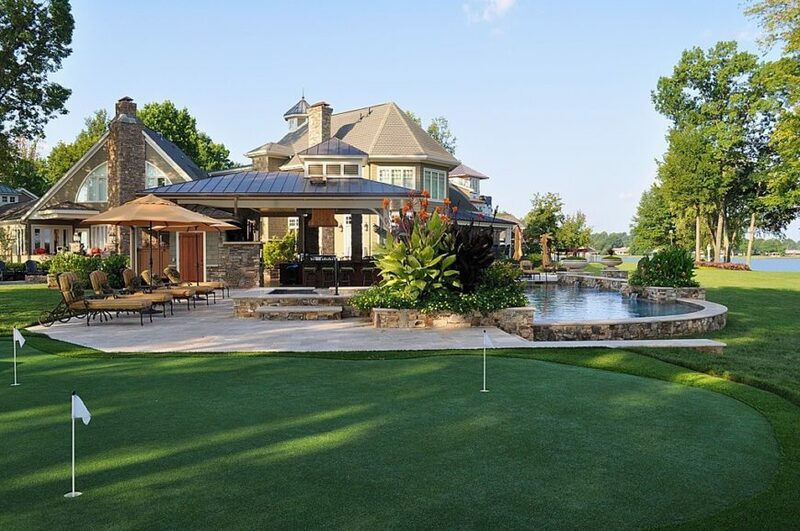 While the kids are at play, you and your spouse can relax in the backyard. You just need the right equipment. If all you need is a cozy chair or a bit of shade to get relaxed, you are in luck. There are so many great products available to match any design style. 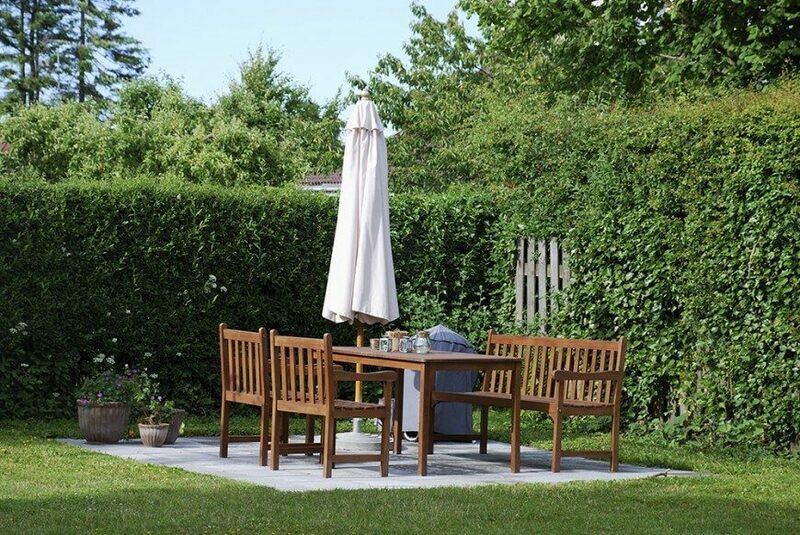 Seating – patio seating sets may consist of a patio set (table, six chairs, and a parasol), or may include picnic tables, chaise longue, and sectionals are also popular. 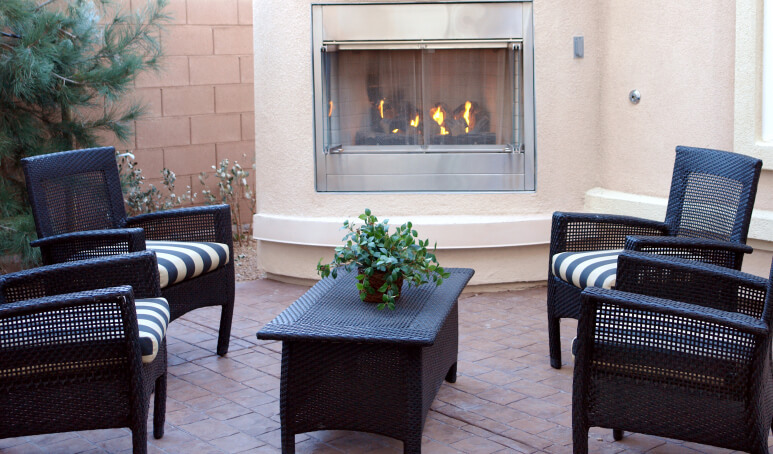 Temperature control – these pieces include parasols, heaters, fireplaces, and even fire pits. 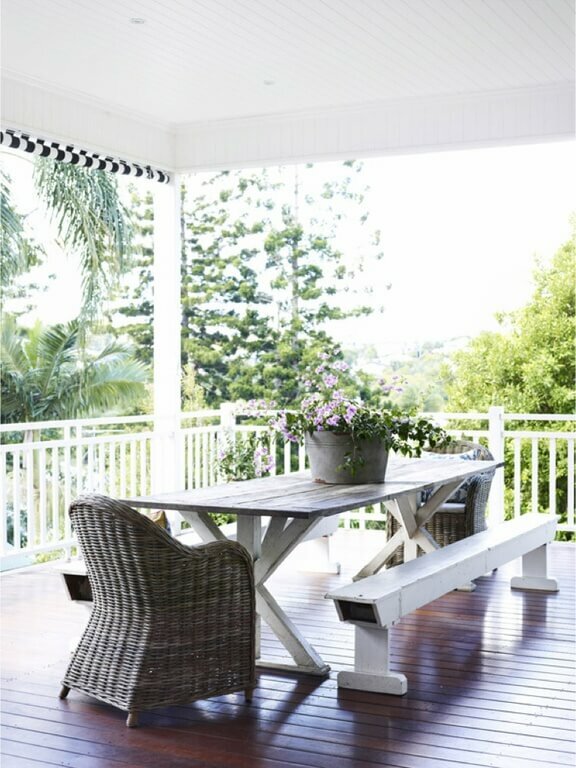 Tables – dining sets are typically placed on patios as additional seating and as a eating area. 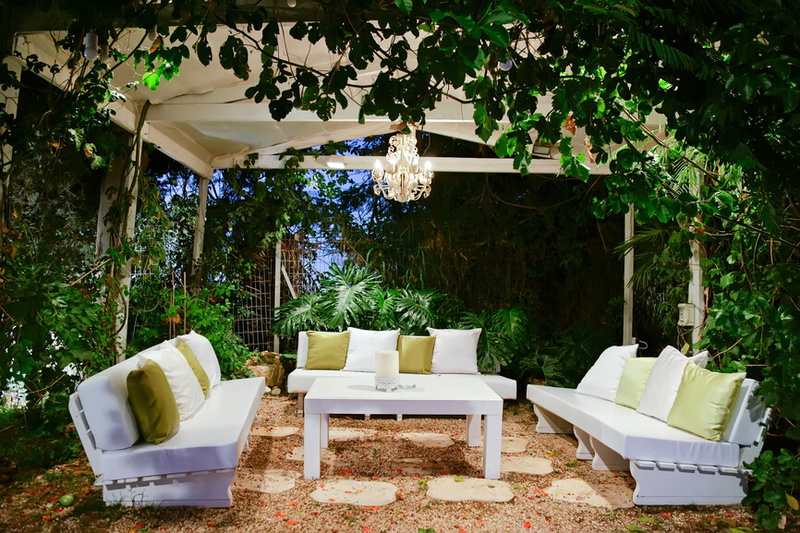 Find more great furniture ideas for your backyard! 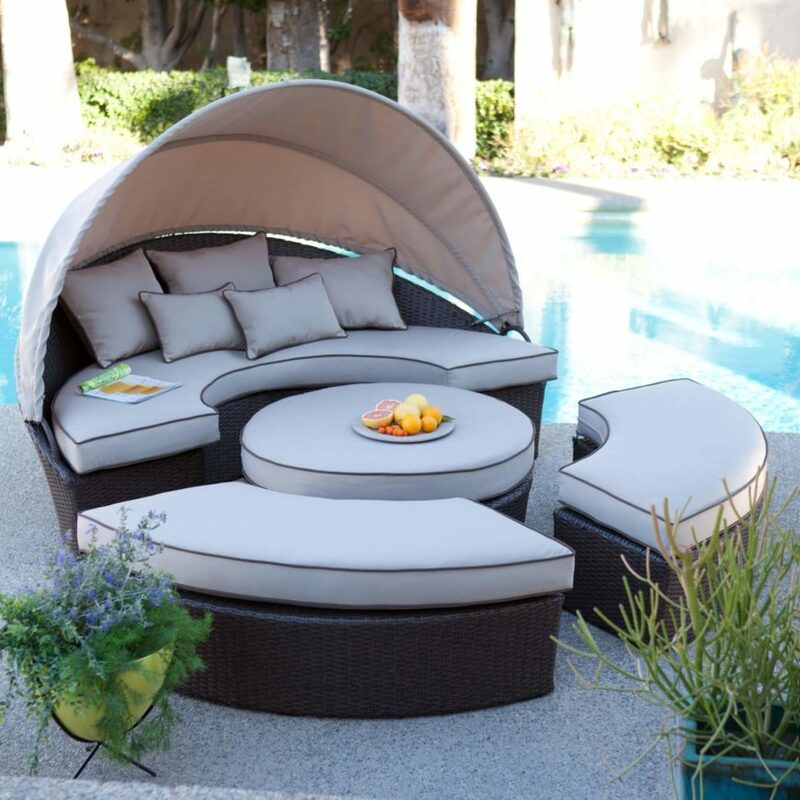 This incredible poolside set can be pushed together to form a lounge bed, or pushed apart to form a coffee table and three bench seats, one of which has a shade. Learn more here. Maybe you like to relax away the stress of the day with a soak in the jacuzzi. The jets and hot water are sure to soothe away any muscle discomfort. Check out more luxurious and bubbly hot tub ideas. A traditional jacuzzi with several unique seats to accommodate any person’s favorite jet positions. 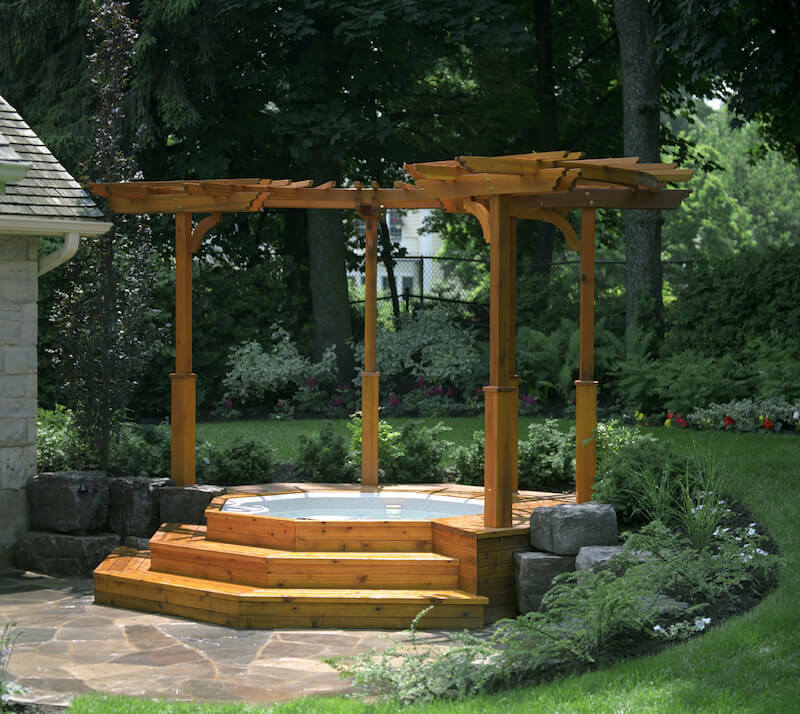 Or, combine your pergola with a nice hot tub for a classy dual threat. If you’re big on entertaining outside and love to cook, an outdoor kitchen might be an ideal way to add outdoor functionality. And we’re not just talking about a grill. Sinks, warming drawers and countertops are just a few things your outdoor kitchen might have! 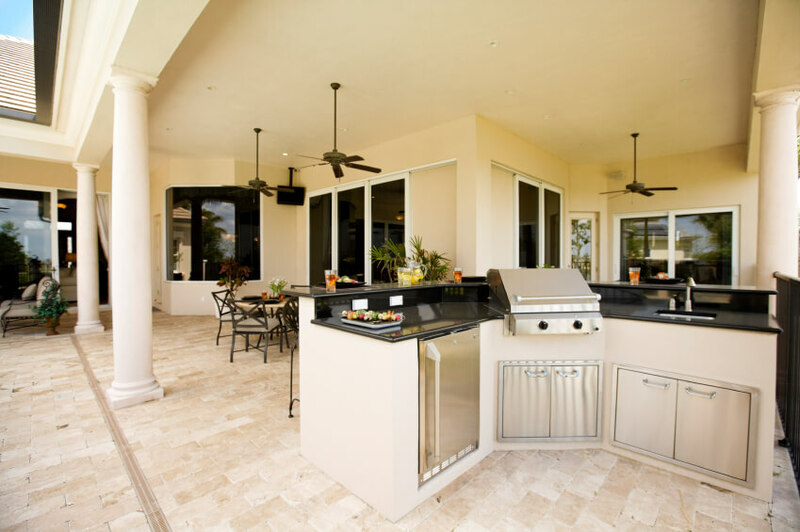 This outdoor kitchen is positioned at the edge of the covered patio and looks back into the dining room, so that the chef may interact with his or her guests. 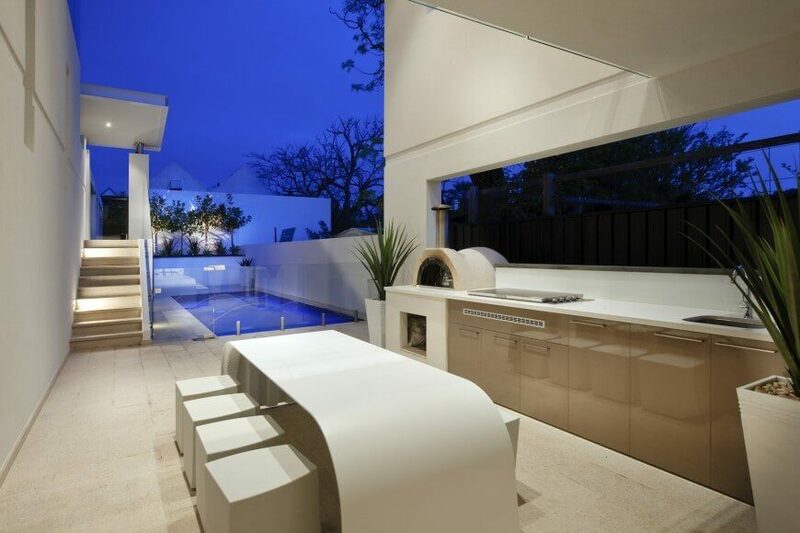 This simple outdoor kitchen embraces a modern design scheme and has a wood-fired oven. See more of this home here. Designed by Daniel Lomma Design. 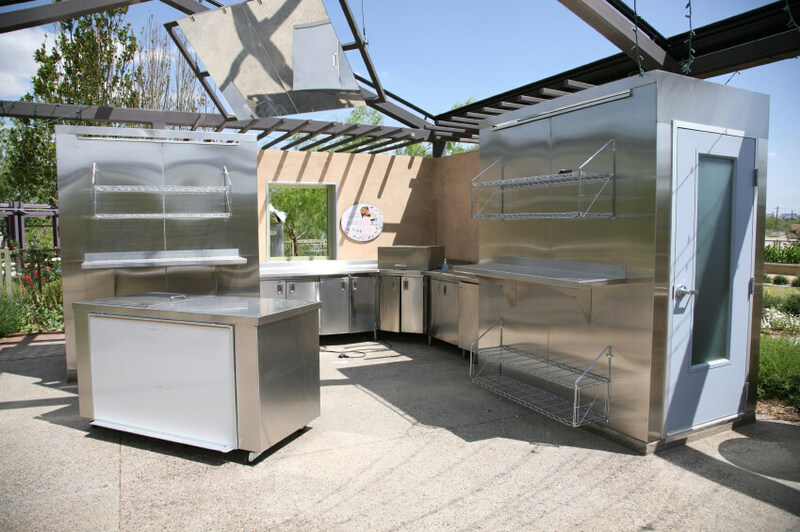 This is a serious outdoor kitchen, complete with stainless steel counters,racks, and a walk-in freezer. Fire pits are a classic outdoor entertainment piece that most patios aren’t quite complete without. Whether you’re having a bonfire late at night or simply enjoying a small fire to relax by, fire pits are budget friendly and perfect for entertaining. This fire pit is unusual in that it is partially open on one side, which isn’t recommended. 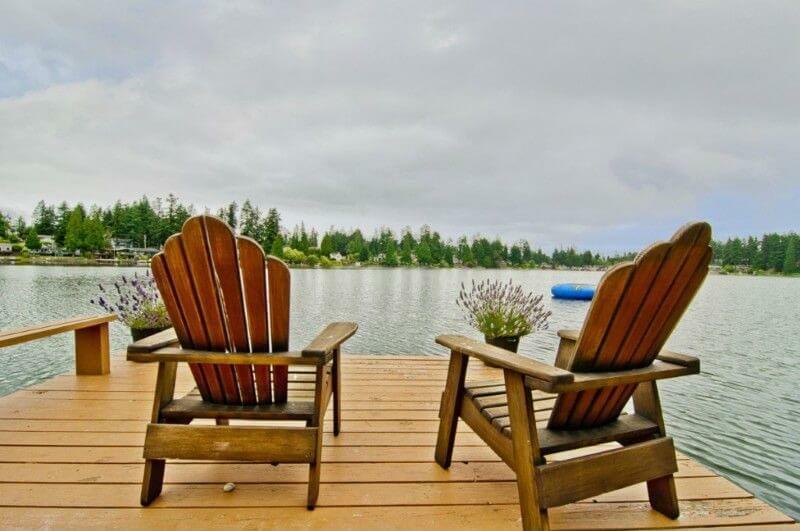 Two sturdy rustic chairs are positioned on this side, overlooking the view of the lake. 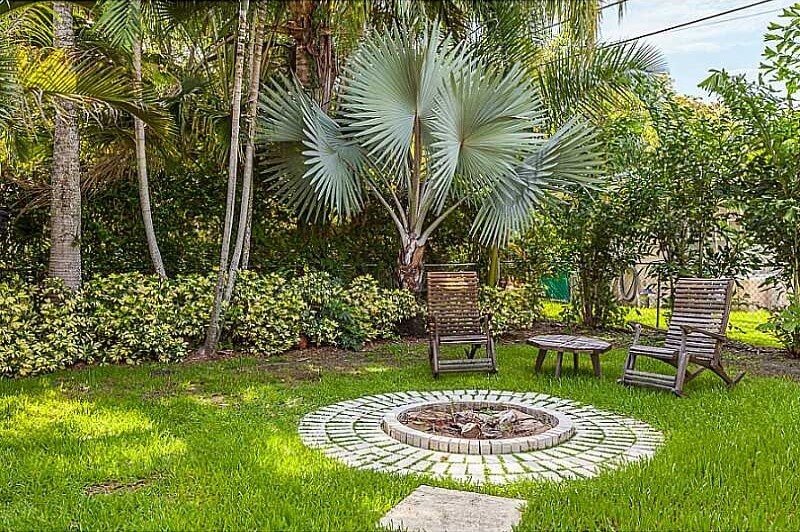 This fire pit is located on a small pond-side patio down the hill from the home. It’s small, but easy to move around or into storage during winter months. 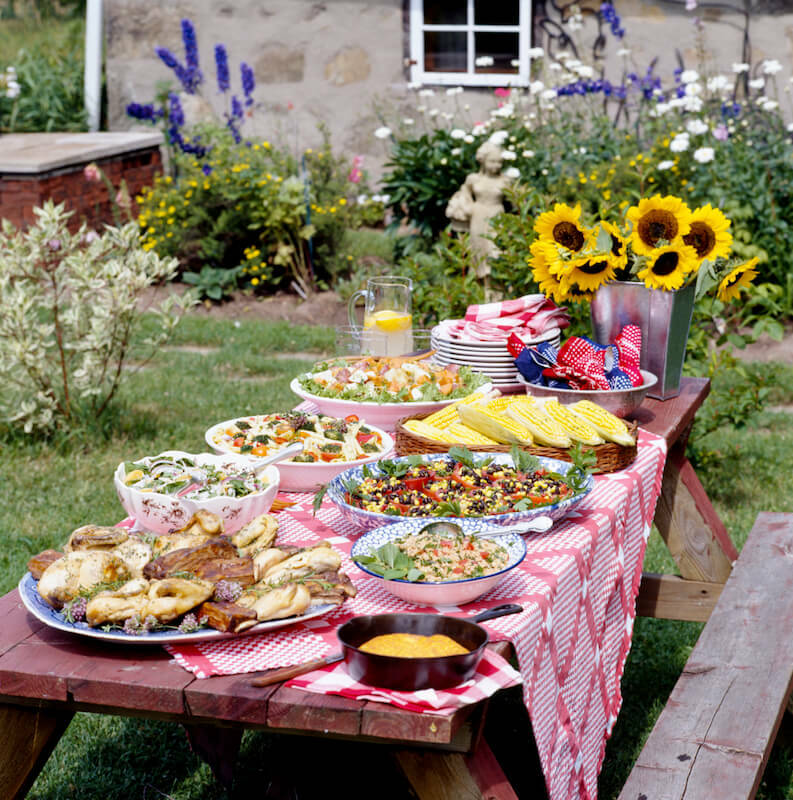 Picnic tables are an awesome idea for large families, as it enables them to take their meal outside and enjoy it as a family in the garden. They’re budget friendly and are even a pretty simple DIY project, if you’re so inclined. 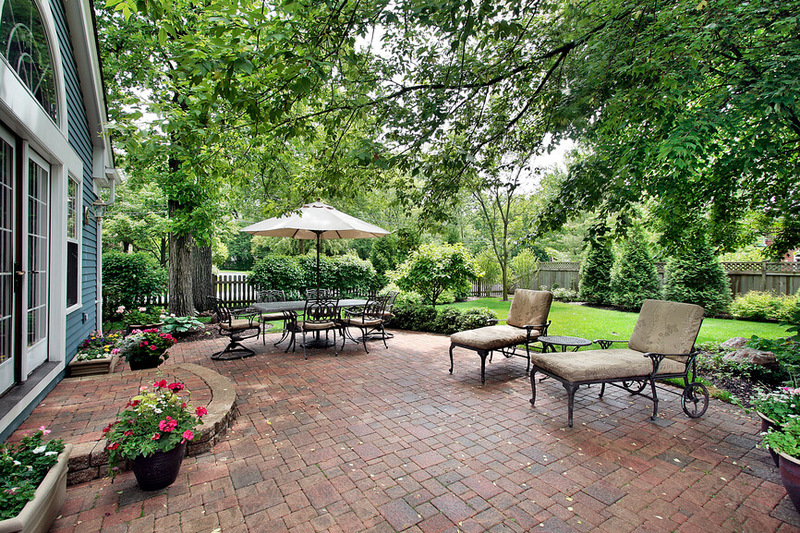 Check out fabulous backyards complete with a picnic area. This all wood picnic table is dressed up with a checkered table cloth an loaded with a meal fit for a large family! 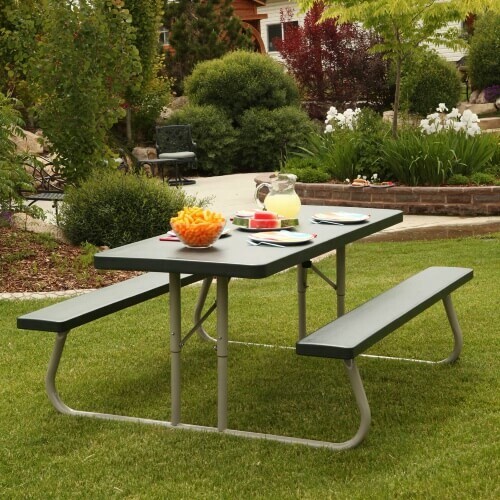 This is a simple, budget friendly aluminum picnic table that is easy to set up and looks great anywhere in your backyard. Learn more here. 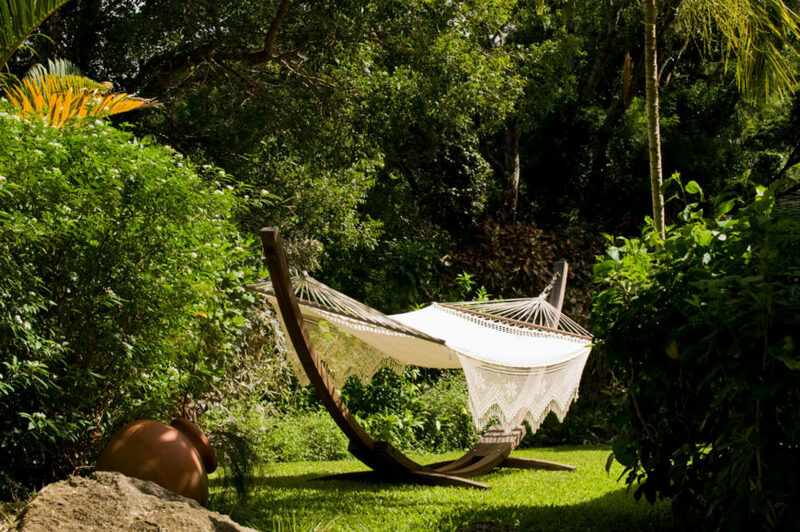 There’s nothing quite like a nap in the sunshine while swinging gently in a hammock. There are dozens of different kinds, from hammocks that hang from an attached stand, or ones that you can simply tie between two trees. Kick back and relax with one of the many different kinds of hammocks. 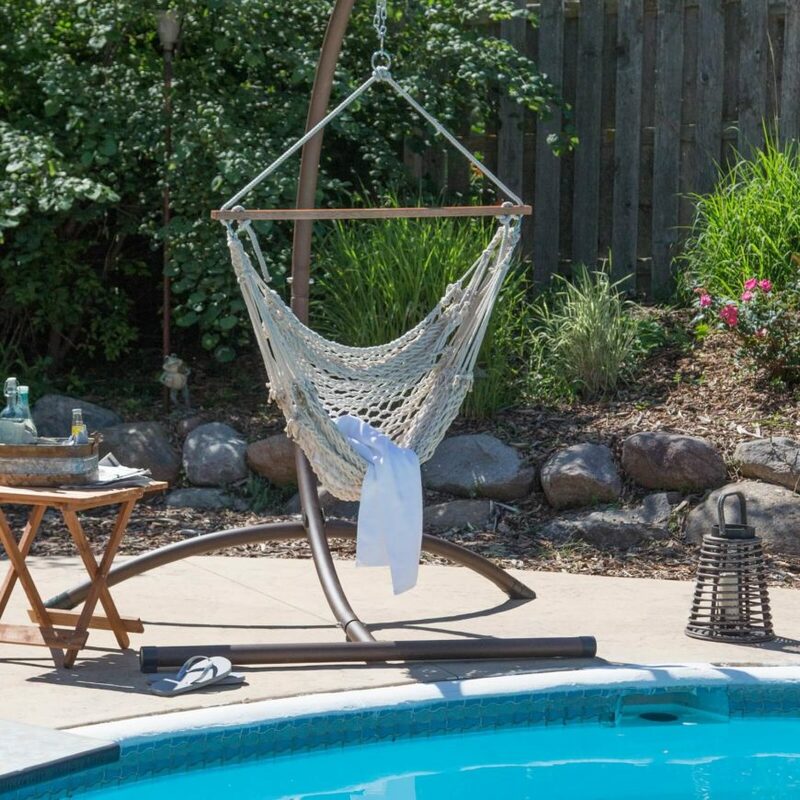 A hammock chair complete with a sturdy stand by the side of the pool. The open weave is perfect for feeling the breeze and drying off after a dip in the pool. Learn more here. This lovely crocheted hammock is strung between the two ends of a half-circle wooden stand. 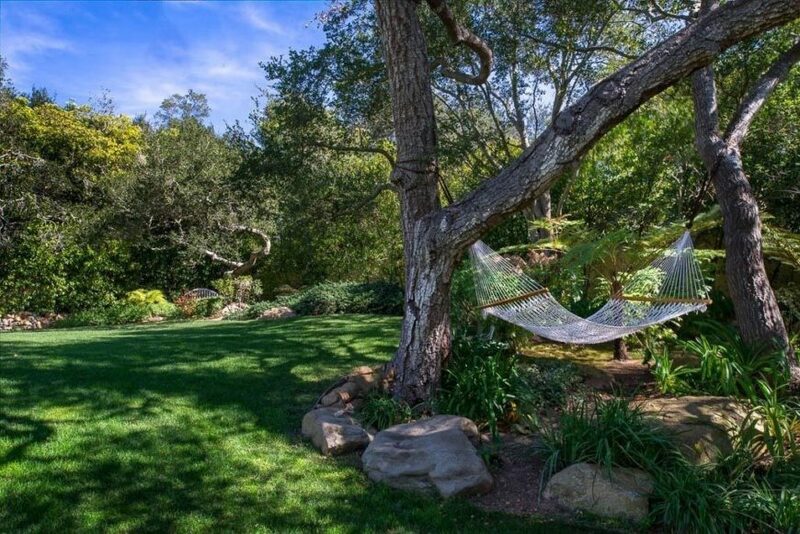 The hammock sits in a secluded part of the yard amongst the trees. 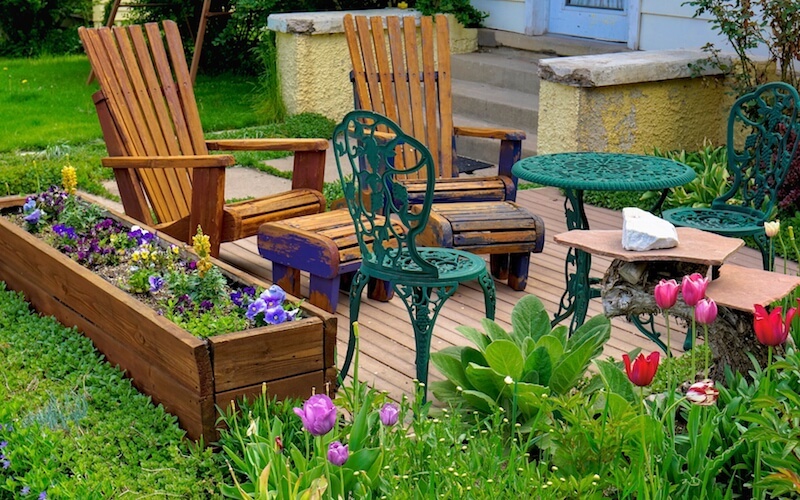 Adding a simple bench is a cost effective way to add seating to a garden or patio, and there are tons of different kinds, so you can pick the one that best meets your budget and style needs. 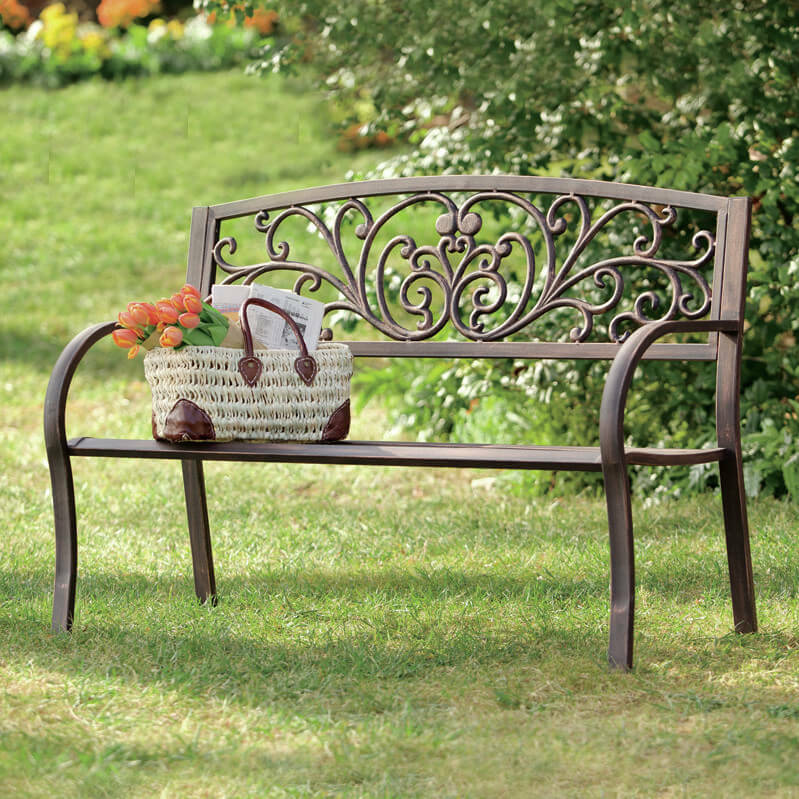 An elegant wrought iron bench with scrollwork decorating the backrest. This piece is perfect for any patio area or garden. Learn more here. 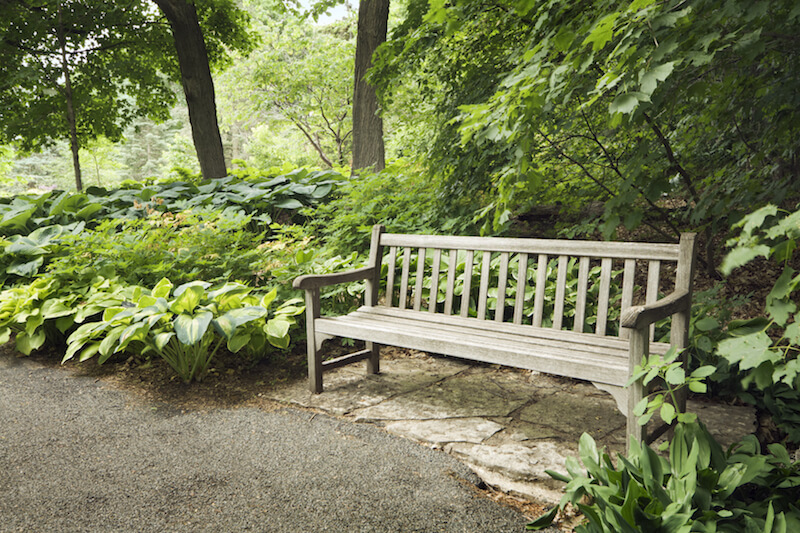 A simple wooden bench tucked just off the pathway into the trees and thick plants. Adirondack chairs are fantastic for lounging around and relaxing. 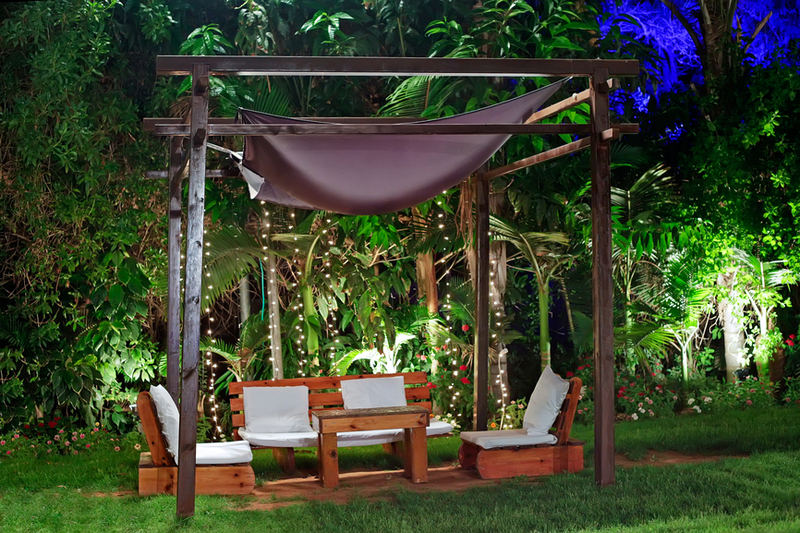 They work in any setting, from the garden to the poolside, and can be accented with cushions as needed. 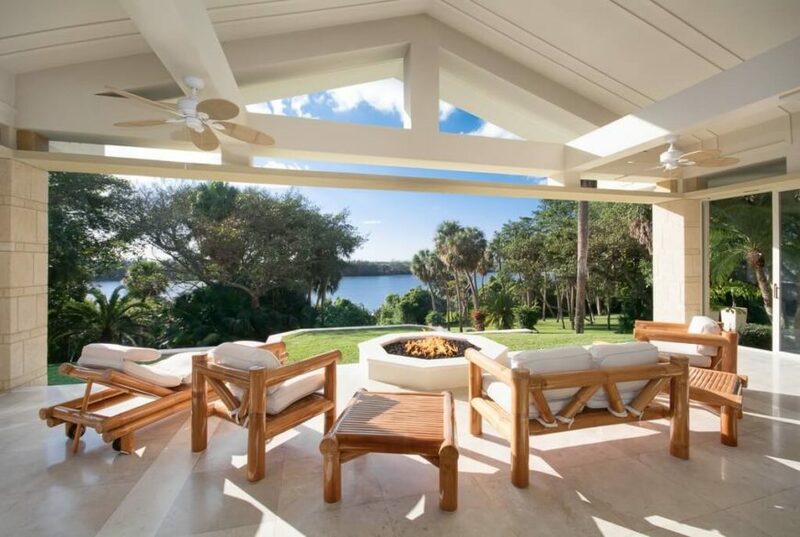 Check out more amazing adirondack relaxation spaces. 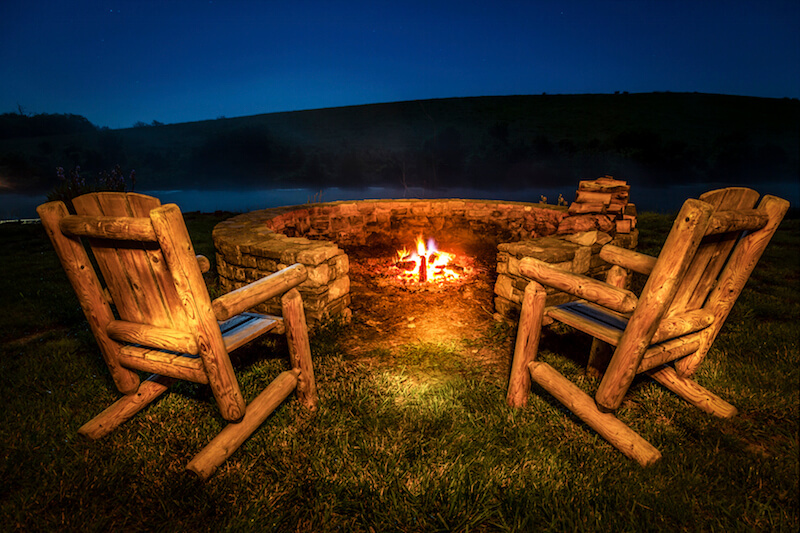 These adirondack chairs are placed around a fire pit, a perfect spot to relax in the evening. 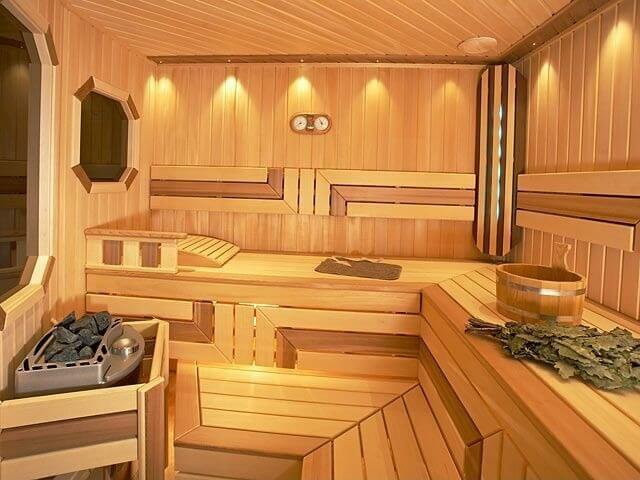 Having your own sauna might be your ticket to relaxation, particularly if you like to take a spa day now and then. There are a lot of different ways to add a sauna to your home or backyard. Heat things up with even more sauna ideas. 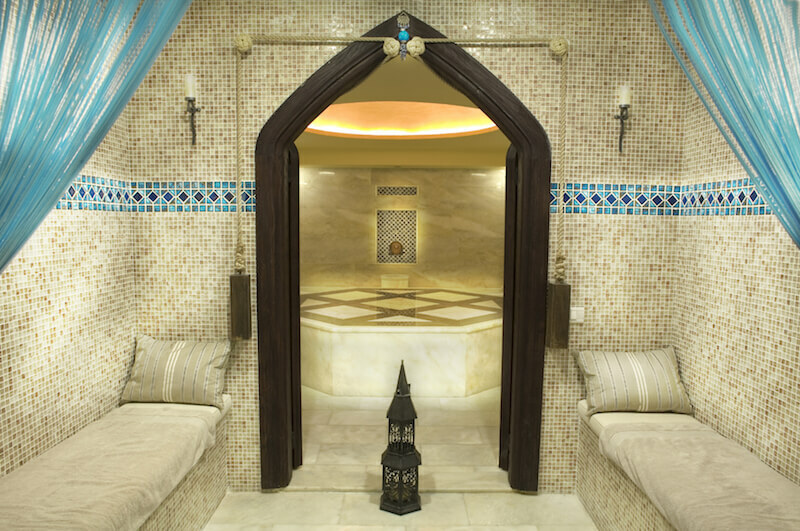 A Turkish style sauna with two separate rooms, including a section with padded benches. The sauna building opens up into a small bathroom area, with the actual sauna booth in the corner. If you happen to have a large outdoor dog, chickens, or are an avid bird-watcher, this is the section for you. Find the best dog house, get ideas for a new chicken coop, or take up beekeeping! If your dog happens to be an outdoor dog, or even if they just like to spend a lot of time outside in the summer running around your fenced in yard, you should ensure they have a shelter to relax in. Find more great ideas for Fido’s special outdoor space. 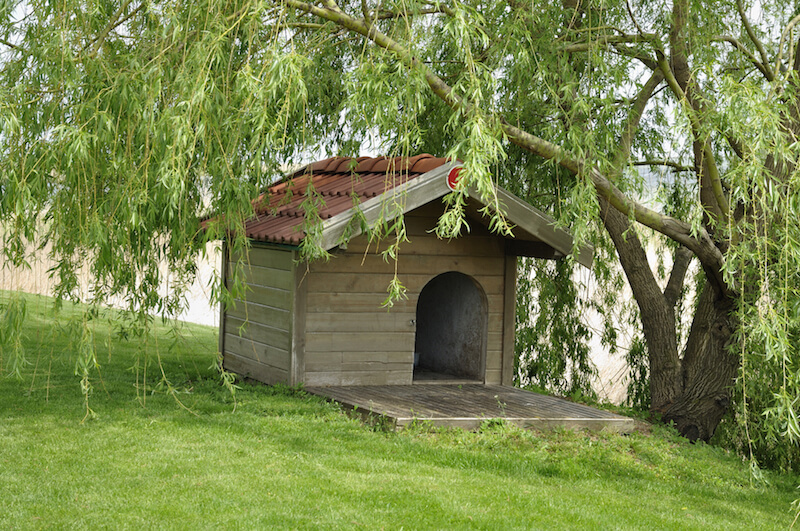 This adorable dog house is simple, but tucked underneath a willow tree on a hill, protected from most weather. 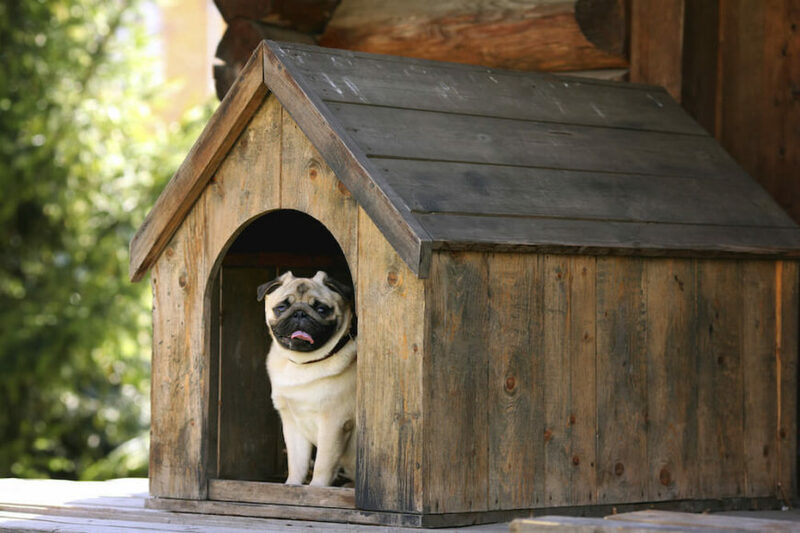 This is a smaller dog house perfect for small breeds, like the pug shown. It’s a rustic dog house, but sheltered on the front porch of this log cabin. 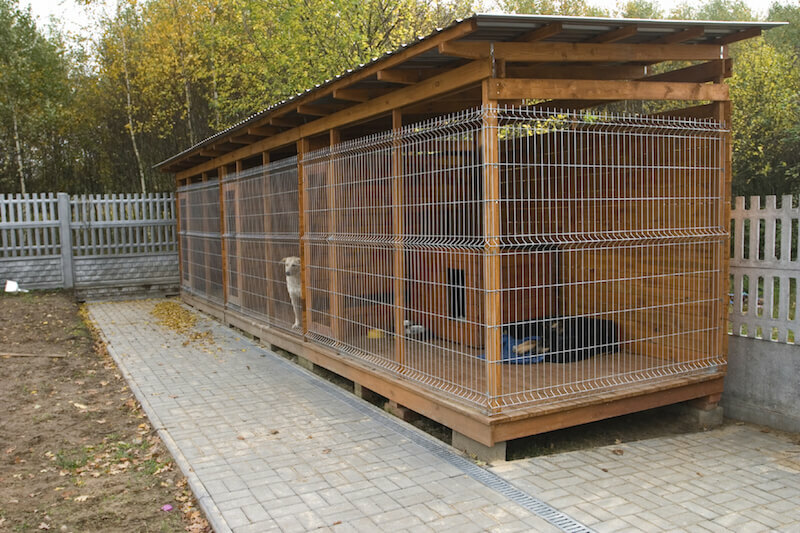 Kennels are another option for homeowners, although they tend to be less attractive than dog houses, and aren’t suitable for keeping the dog in for extended periods of time. 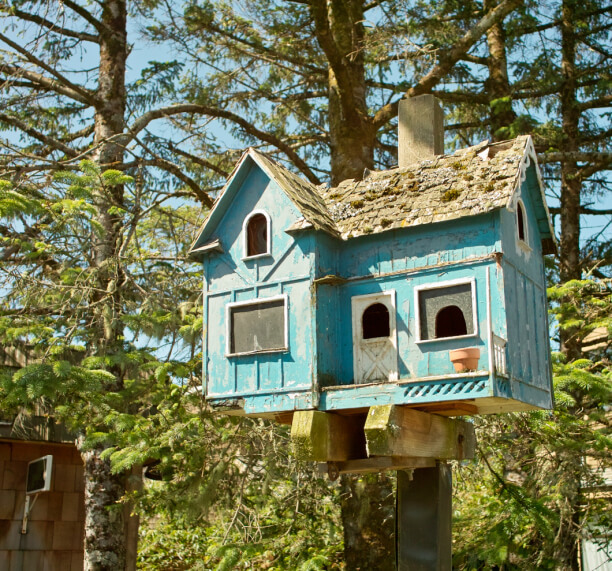 Bird-watchers probably have one or two bird feeders or bird houses in their yards already, but there are so many fantastic ideas that it’s hard not to just keep adding more to your yard. A light blue birdhouse designed to resemble a lovely English cottage. 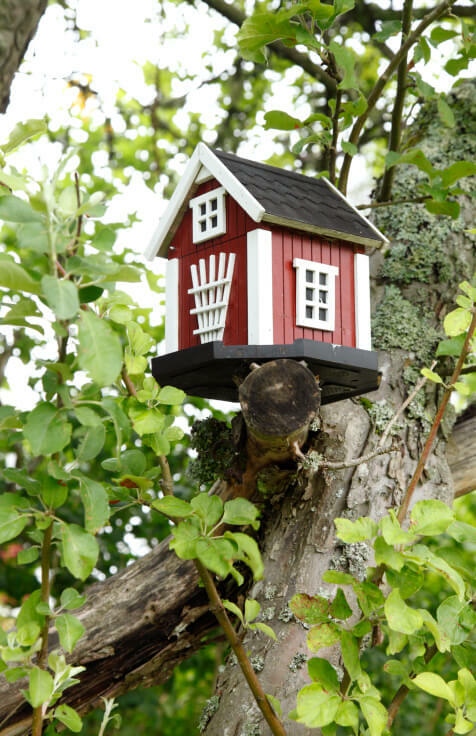 A crisply painted red and white barn-shaped birdhouse perched on a sawn-off branch in a mature tree. 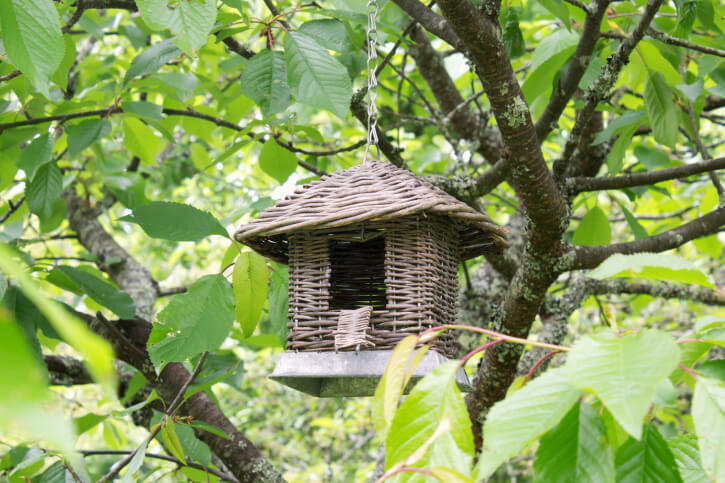 A hanging wicker birdhouse with a door large enough for larger species of birds to fit through. With all those birds flocking to your yard to build their nests in your birdhouses, you’ll want to add a bird bath. To keep your bird bath water from becoming stagnant, choose a bird bath with a fountain built in. Functional, clean, and definitely decorative. This bright blue ceramic bird bath is tucked into a thick field of flowers, including daisies, daylilies, and lavender. 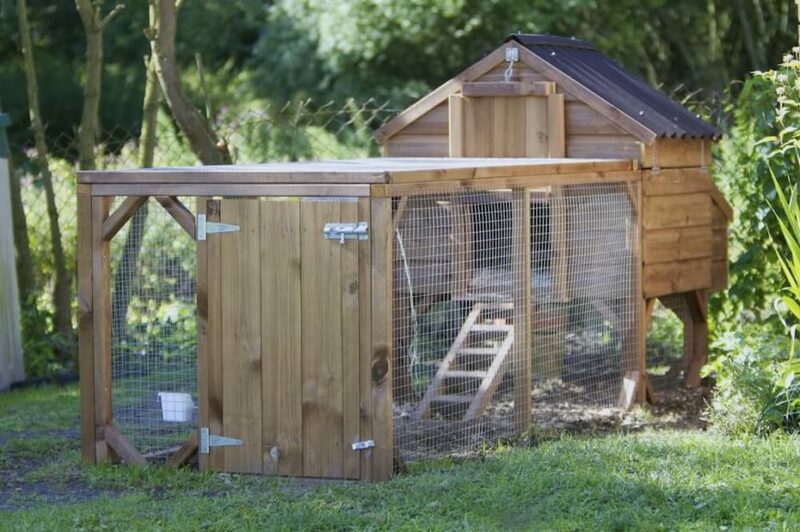 If you raise chickens, a new chicken coop might be on your list of backyard to-dos. Depending on the size of your flock, you might choose different options. Some, of course, are more decorative than others. 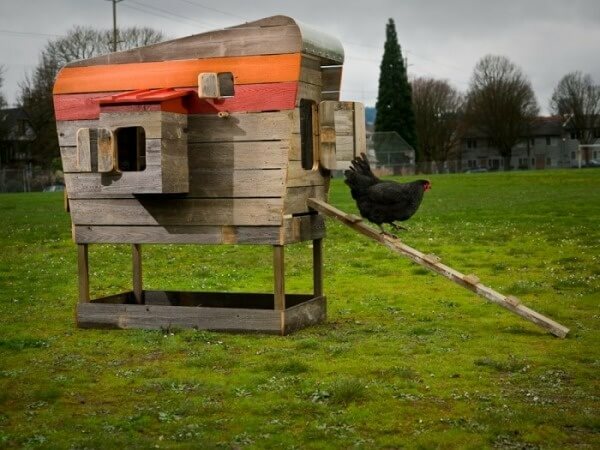 If you prefer to have an enclosure for your chickens, this might be a better option for your backyard. The wire enclosure keeps your hens corralled, and a cozy hen house at the back provides them with a nice spot to nest. 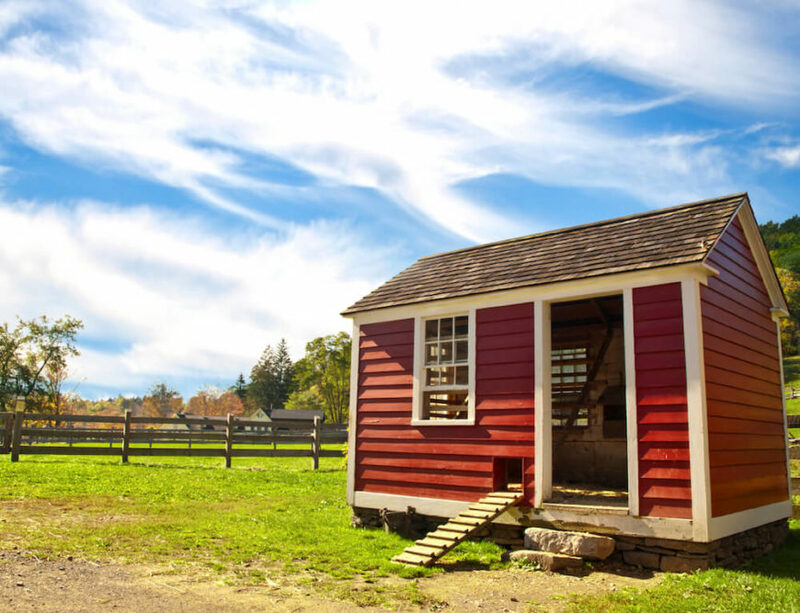 However, if you have a larger flock, you might need a large hen house, much like this barn-red one. The hens are free-range here, with no enclosure. 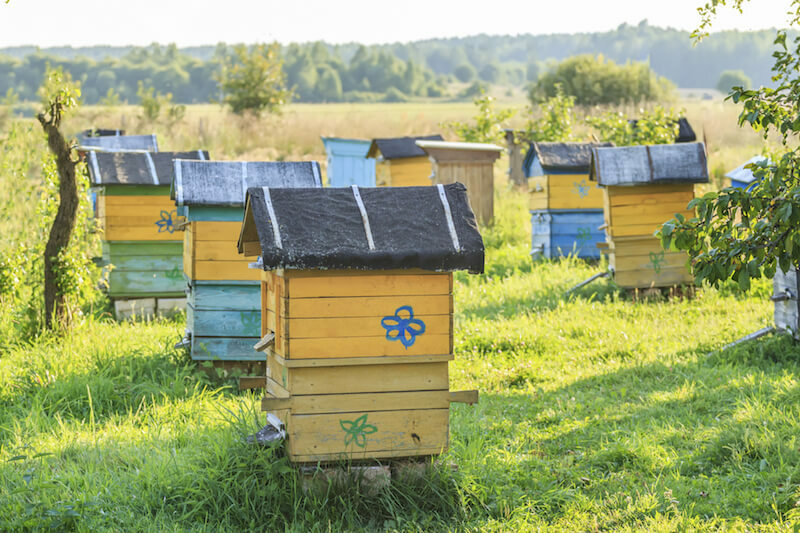 While we usually think of apiaries as large fields filled with bee boxes, the truth is that you can keep bees in your backyard. You’ll need a few lessons of course, beekeeping isn’t something you should just jump right into! Want to start raising bees? 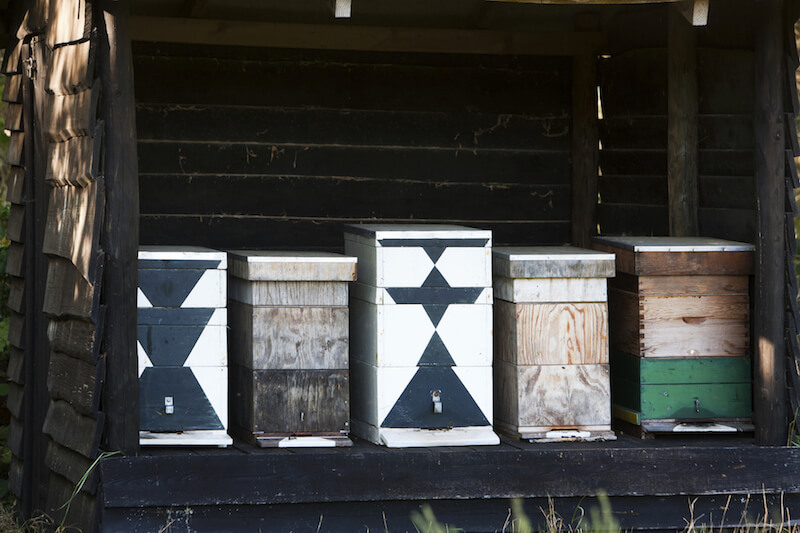 Check out some seriously amazing apiaries. A simple white bee hive in the center of a gravel patio in the middle of a lush, colorful flower garden. Another option is to have several bee boxes stored in an open shed, like this one. Decorate them as you please to suit your style and decor. These bold yellow, blue, and green hives are decorated with painted flowers to spruce them up, and located in a field far from the suburbs. And there’s so many more ideas to consider when landscaping your backyard. 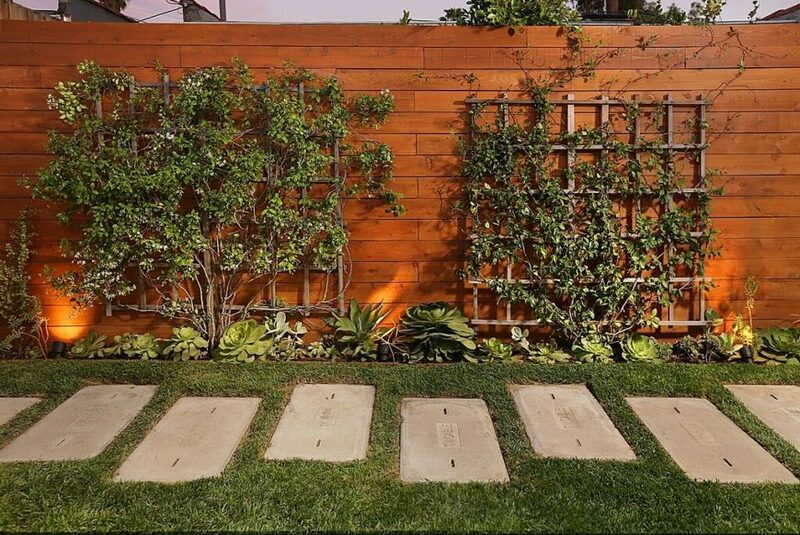 Beautification can come from many different landscaping objects, organic and inorganic. Mature trees provide shade and privacy, and there’s nothing quite like a huge, leafy tree to lean up against and read a book or relax. 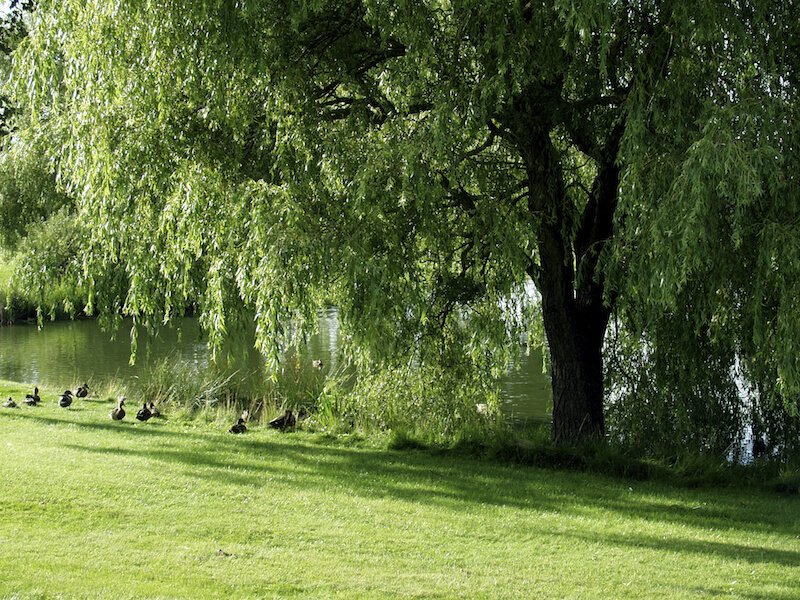 This huge, fully mature tree sits on the bank of a quiet lake, providing shade to a flock of ducks. 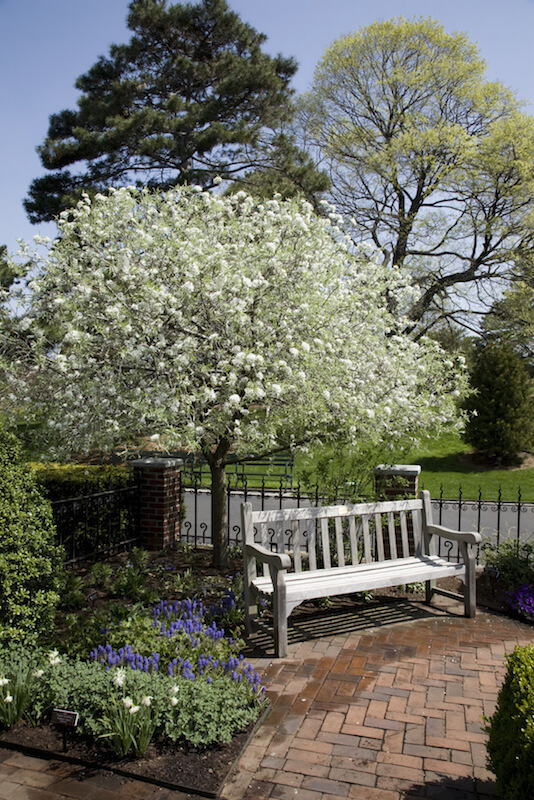 Ornamental trees mature faster, and often have fragrant flowers that bloom in the spring. Sculptures are a fantastic way to add variation to your backyard or garden, and they come in basically any shape or figure imaginable. 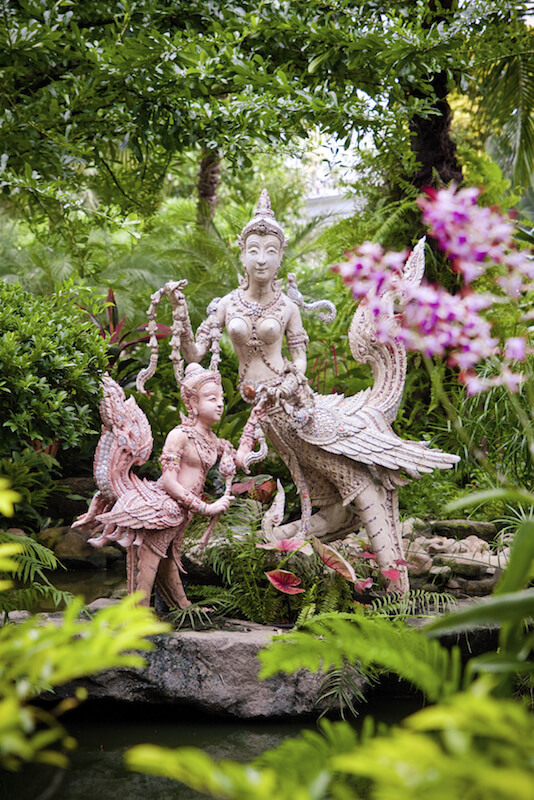 These incredibly ornate statues depict Hindu deities, and are stunning amongst the thick greenery and vibrant flowers. 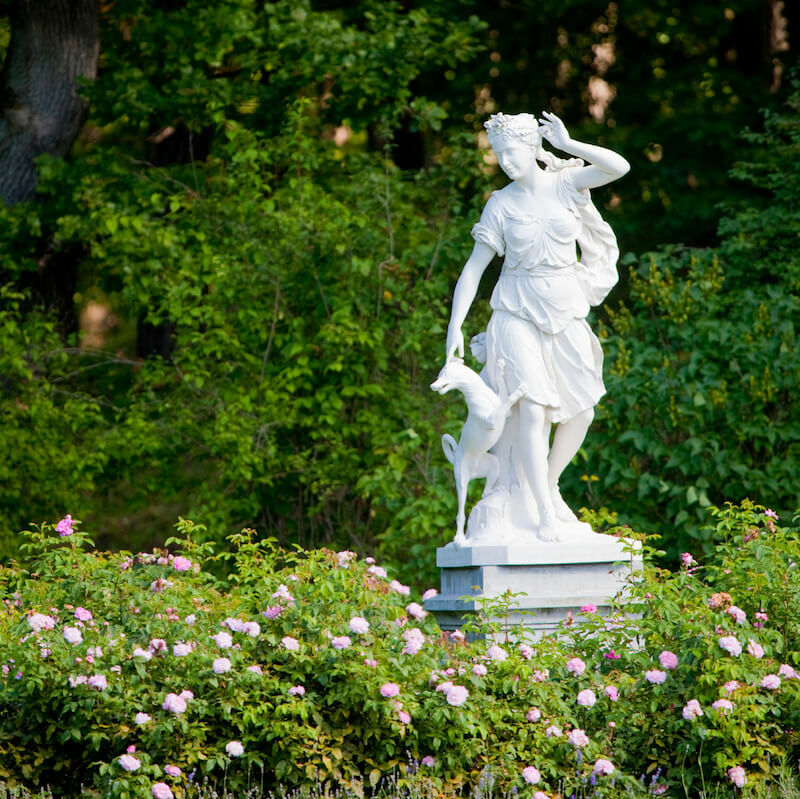 If you prefer a more classical design, Greek style statues can make a huge statement in a garden where most plants are much shorter than the statue. Steps aren’t usually necessary in most backyards, but if yours happens to be hilly, you might need a few. 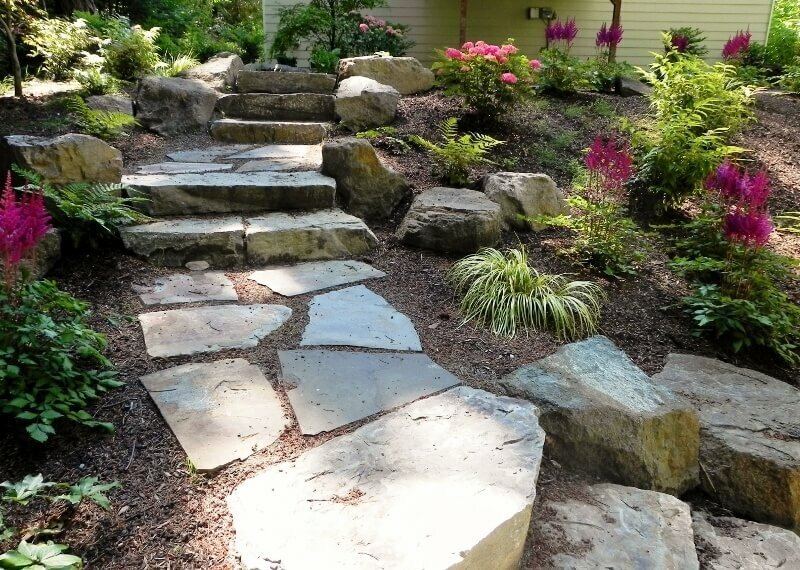 Check out more stone step ideas. 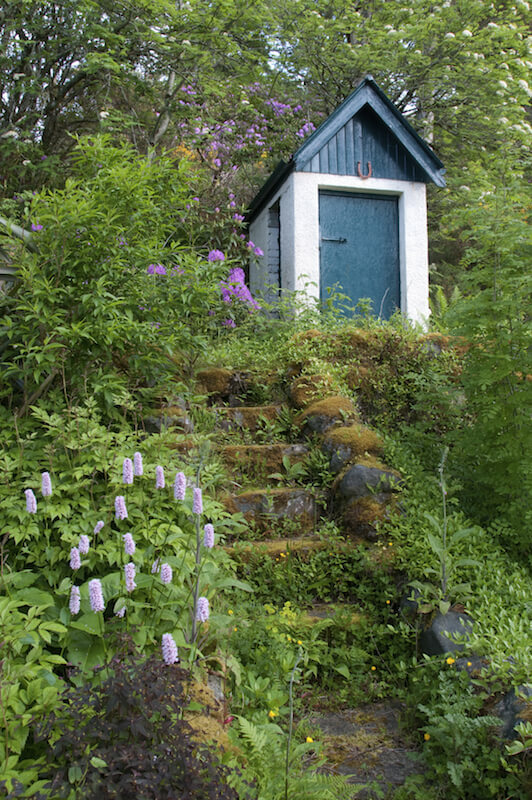 These moss-covered overgrown steps lead up to a garden shed at the top of the hill. 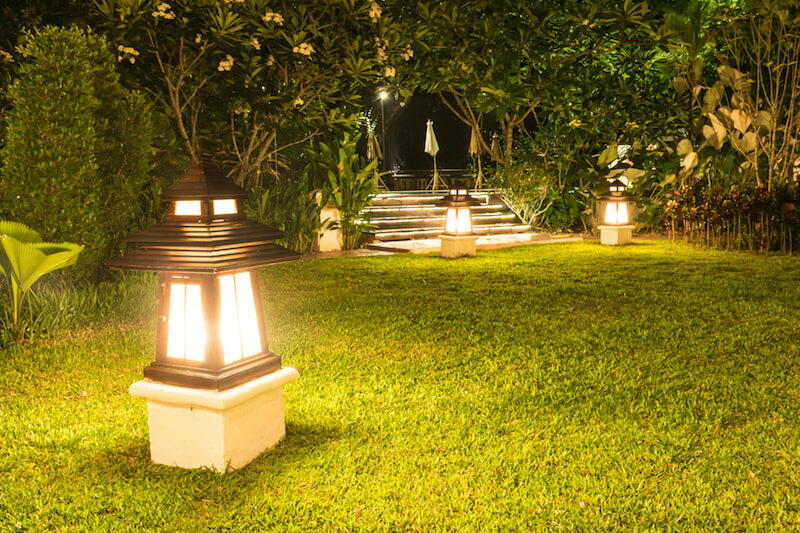 If you plan on spending much time outside in the evenings, you’ll want to include some outdoor lighting in your landscaping. 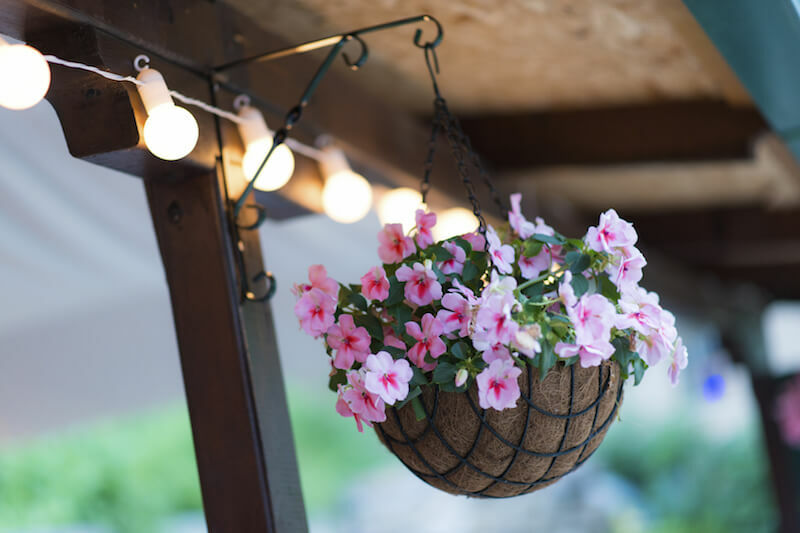 Adding a strand of hanging lights to the top of a patio or pergola is a great way to ensure that your relaxation area remains well lit into the night. Vines and ivy are incredible additions to your landscaping, but they take some time to grow large and sturdy enough to really take full effect. 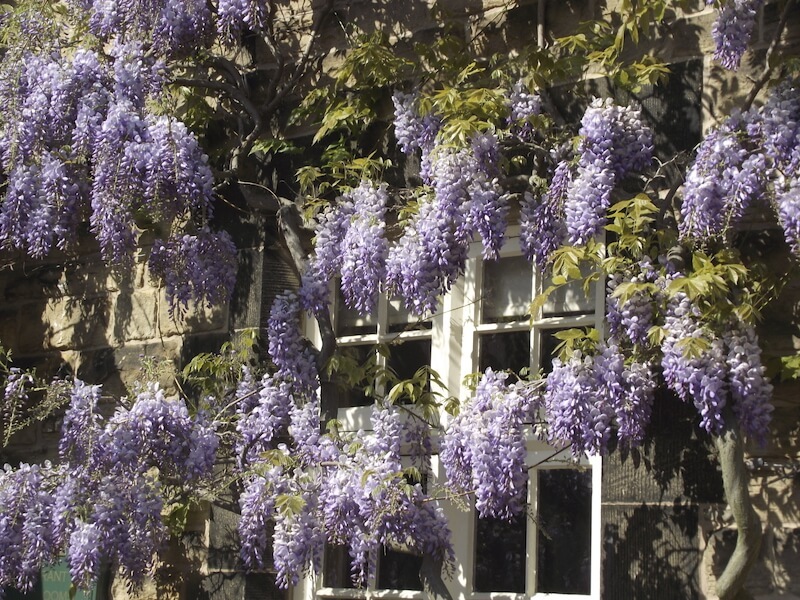 While Wisteria isn’t truly a vine, it has many vine-like qualities, and will grow, much like a vine, over sheds and trellises. 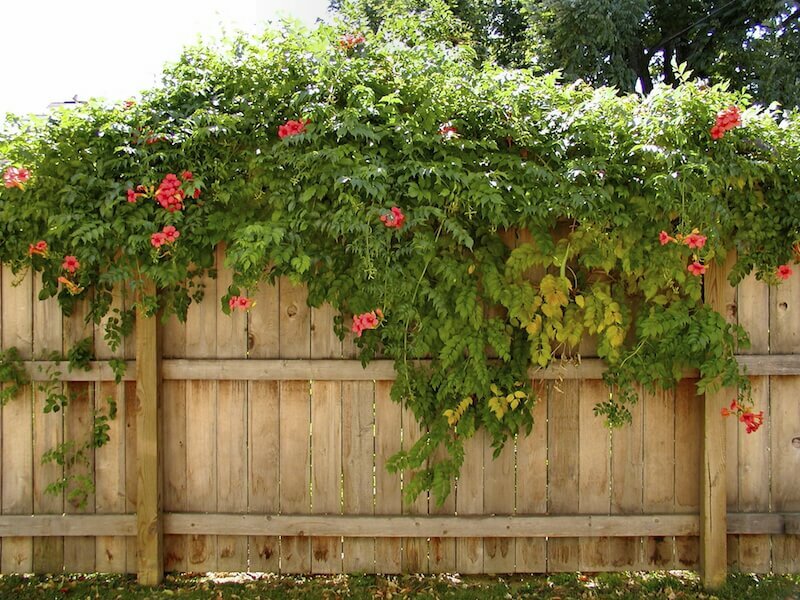 Vines can even be used to cascade over a privacy fence and dress it up with color and fragrance. Palm trees won’t be an option everywhere, but if you have the right climate, a palm can really set a beachy or tropical atmosphere. Even a much smaller potted palm can really help set the mood. It gives this simple wooden lounge chair the air of a tropical resort. If harvesting some home grown fruit appeals to you, you may want to invest in a few fruit trees for your yard. Not only will they grow into shade-giving trees, but you will be able to harvest fruit each year. 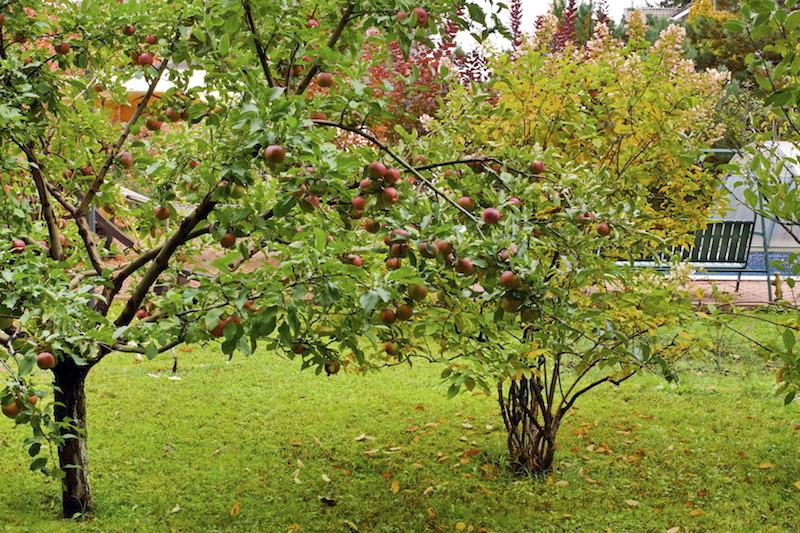 This apple tree is weighed down with ripening fruit. 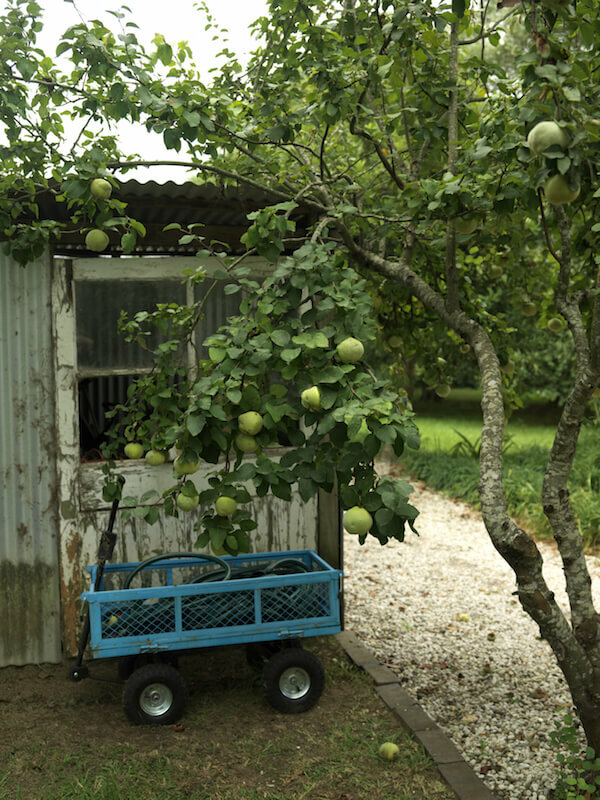 Nearby is a gardening shed and a wagon, which will be useful when it’s time to harvest. Another lovely apple tree, planted at the rear of the property, obscuring the main living area from prying eyes. 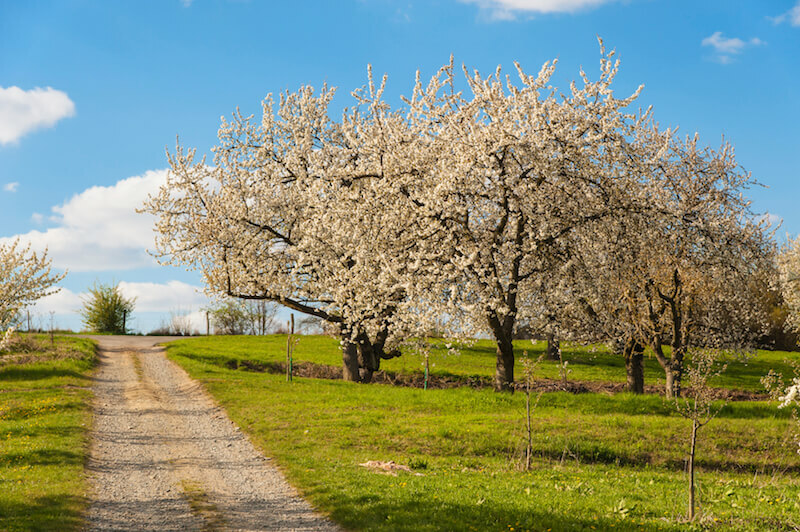 Even when they aren’t bearing fruit, cherry trees have glorious flowers in the spring time. Not sure if you have the time or inclination to mow your grass? Perhaps you want a water-conscious lawn. 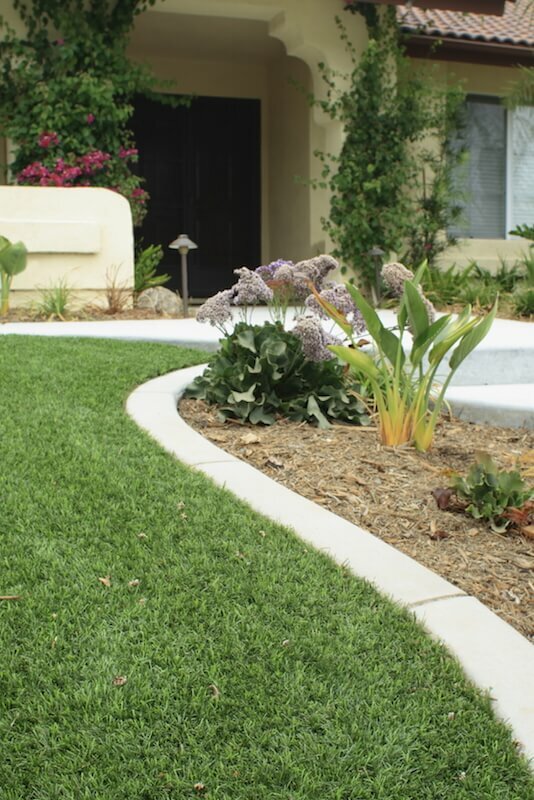 Astro turf looks very much like real grass, but does not require any watering or mowing. It’s unlikely anyone will even notice it’s not real grass until they step on it. Plus, your neighbors will never be able to figure out how on earth you keep your grass so green. A closer look at astro turf reveals that it does look very much like grass, especially at higher price points. 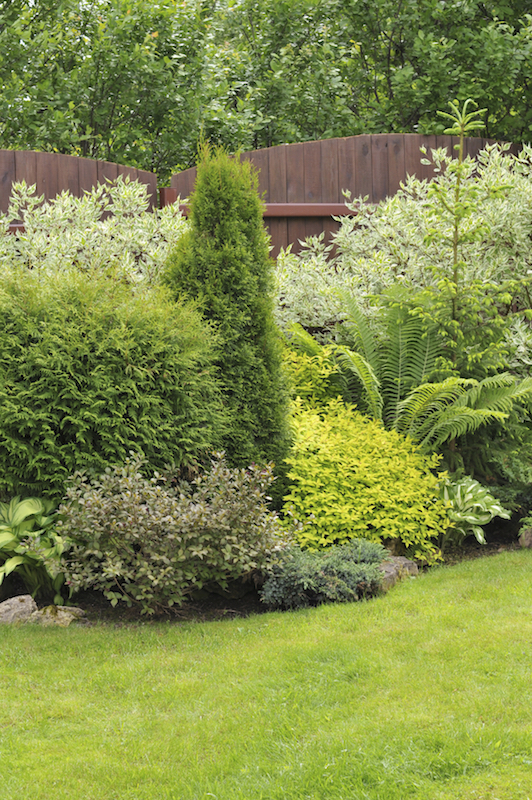 Berry bushes are a great way to add privacy to a yard. 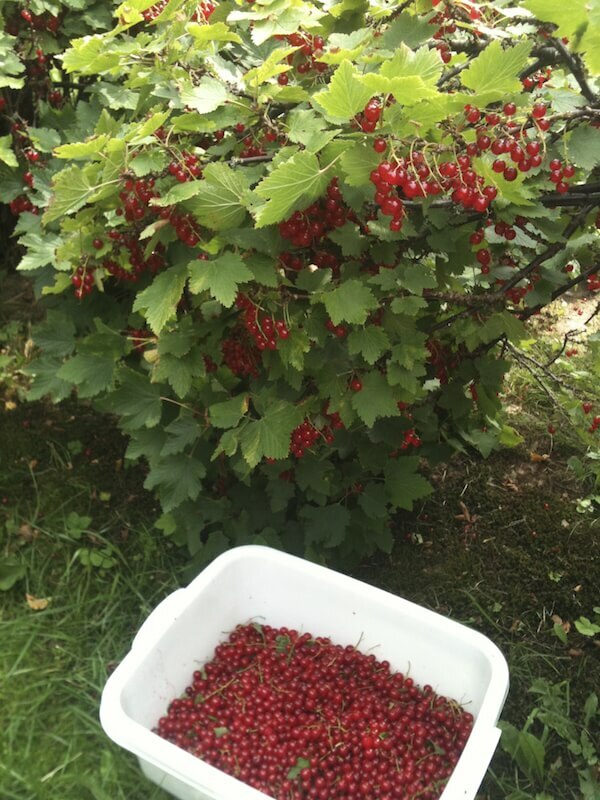 They will grow to a large size, and you can harvest your very own organic berries to make jam! Brightly colored berries are harvested. Look at that haul! The large bush also acts as a great barrier between yards. 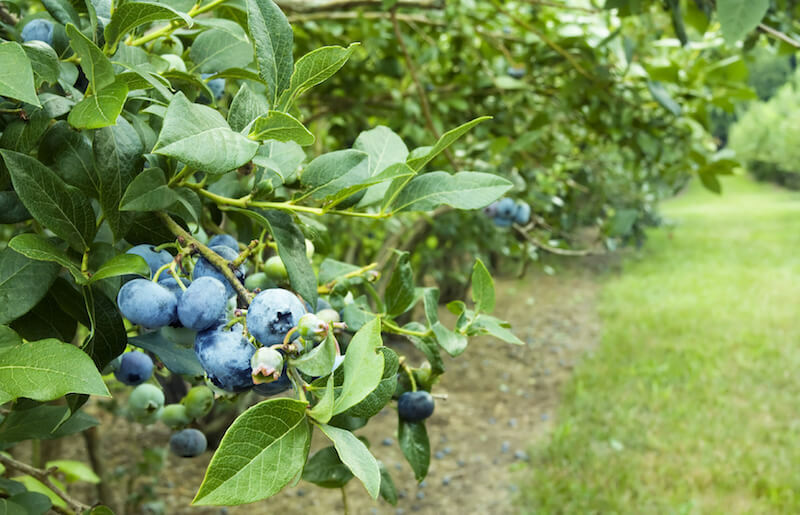 Blueberries are easy to structure into rows, and produce the brightly colored berries each season. Grass is the standard in most yards throughout the United States, and is easy to maintain in areas with plentiful fresh water. 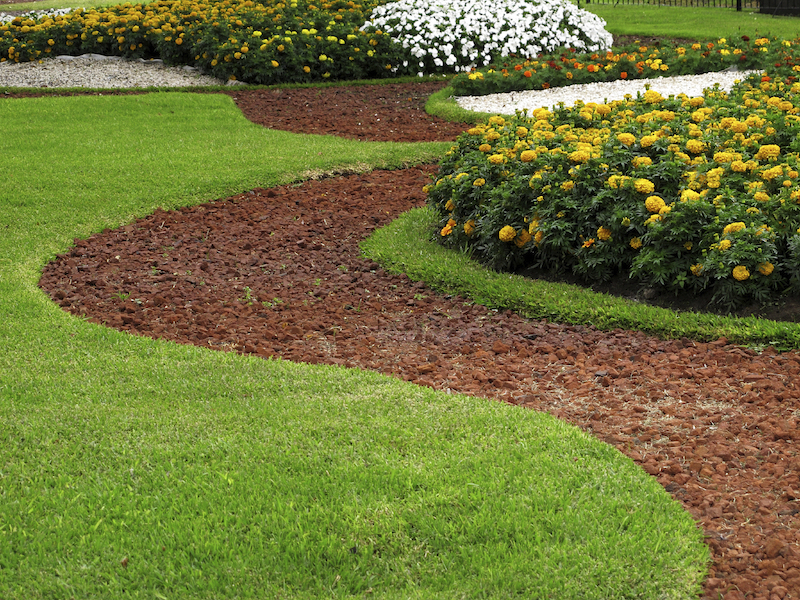 However, it requires sprinkler systems and regular mowing to keep it looking great. 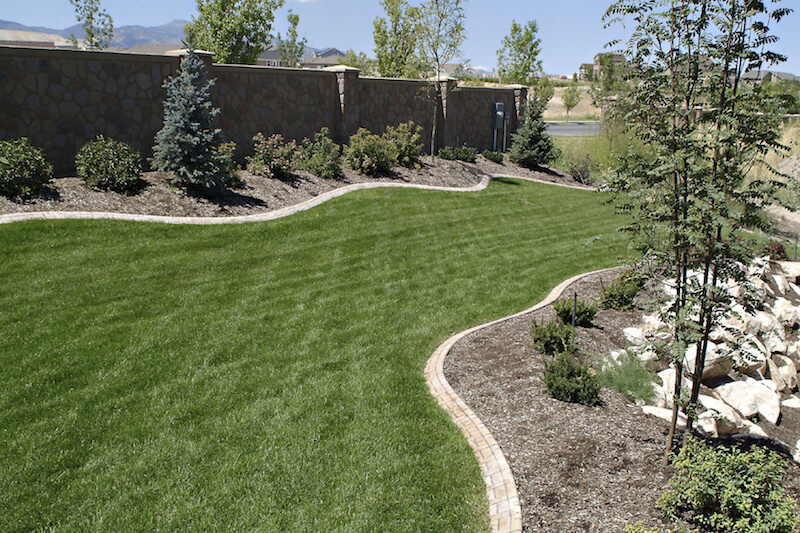 To limit how much grass your lawn has, add large pathways or planting beds. Just be aware that you’ll have to mow or weed whack around them. 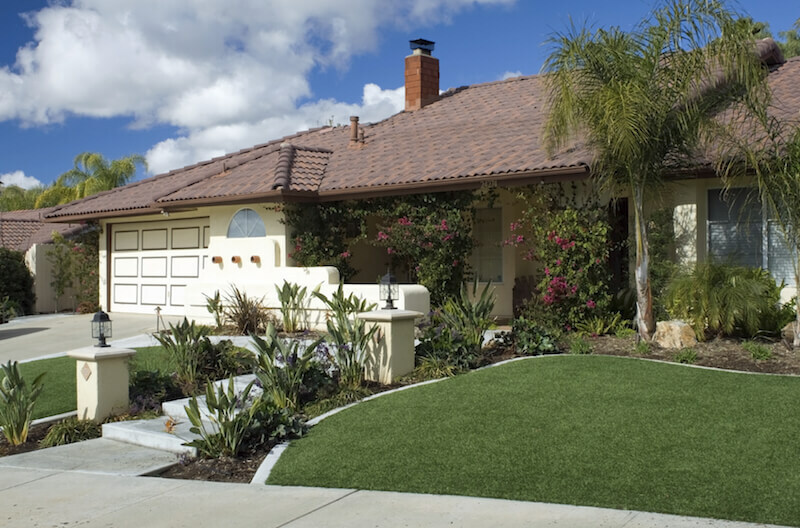 This yard has a snake-like section of grass between manicured planting beds.